At our meeting on August 30th, we inducted our newest member - Jody Doll, 3rd from left. Also in the photo; President Kathleen van der Ree, Membership Chair Lynda Rocha, and Jody's sponsor Judy McQuinn. 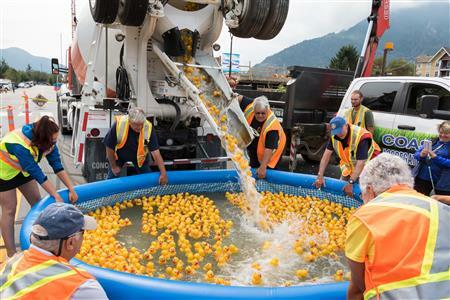 We will again be at the Squamish Street Market on Sunday, July 15th, manning our "Duck in a Truck" lottery tickets sales table, running the Rubber Duck Race, selling stuffies for charity, at the Market welcome table, and assisting with traffic. 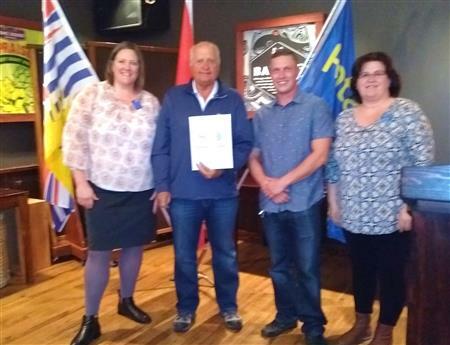 Kathleen van der Ree was installed as President of the Rotary Club of Squamish for 2018-19, along with her executive team at a Hawaiin-themed evening at the soon to open Northyards Cider Co. Assistant Governor Liz Scott conducted the formalities while Doug Race performed as MC. It was a great evening of fun, friendship and good food. For more more photos of the event click HERE. 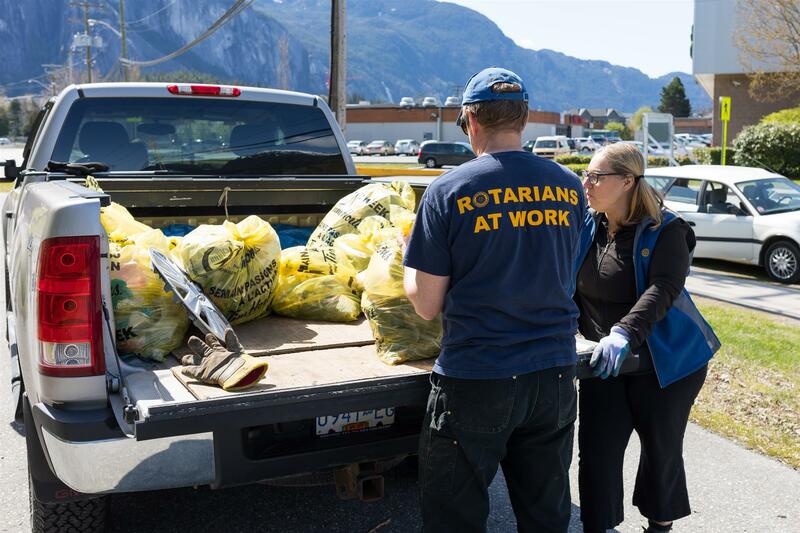 On a beautiful sunny Sunday, Rotarians were “pitching-in” to help give our community a spring cleaning by removing garbage and litter from urban, rural and wilderness areas. Pitch-In Week, Canada’s largest environmental improvement campaign, runs from April 22-29, 2018. 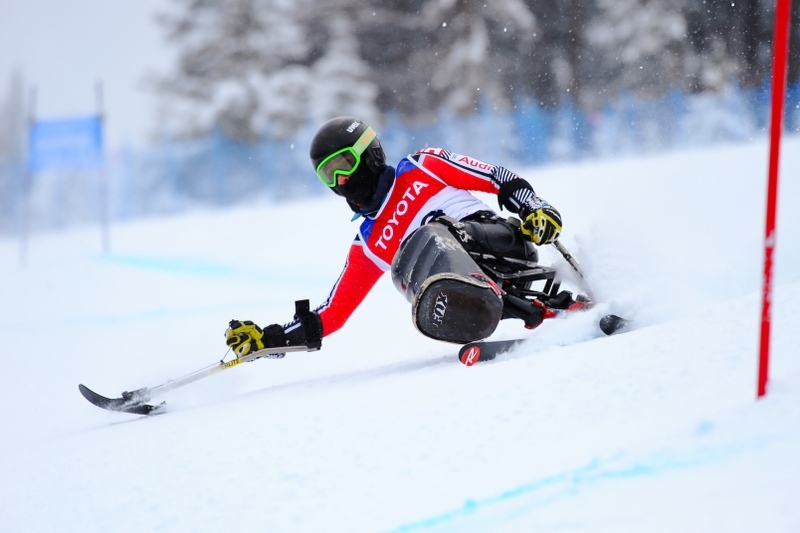 Squamish athlete Alex Cairns has been chosen to join Canada’s para-alpine ski team at the 2018 Paralympic Winter Games in PyeongChang. He’s expected to be competing in the giant slalom and slalom events. 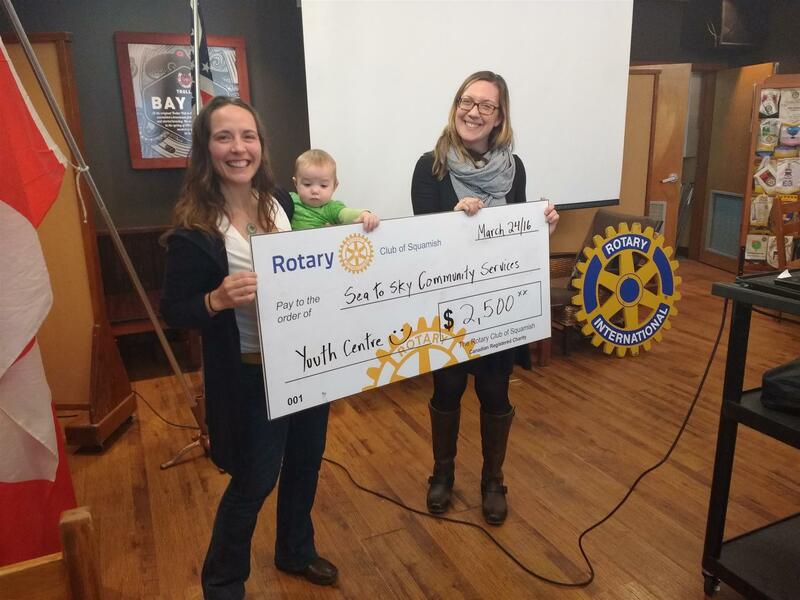 In 2013, the Rotary Club of Squamish helped to fund a sit-ski for Alex. Just look at him now. Full story in the Squamish Chief. 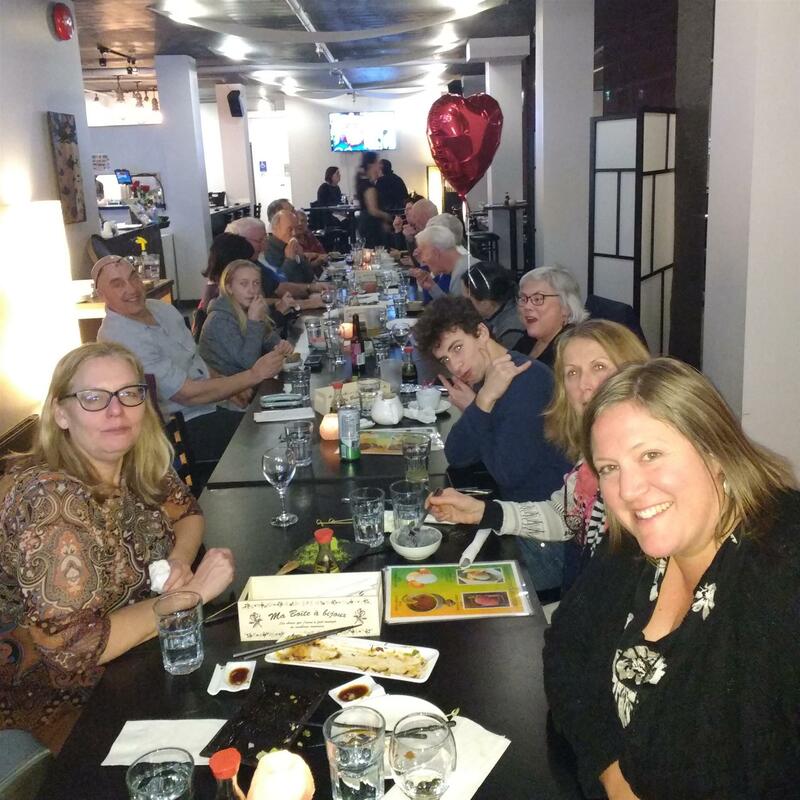 In lieu of our regular meeting, Squamish Rotarians enjoyed a social evening and a traditional Japanese meal at the Oryzea Japanese restaurant in downtown Squamish. 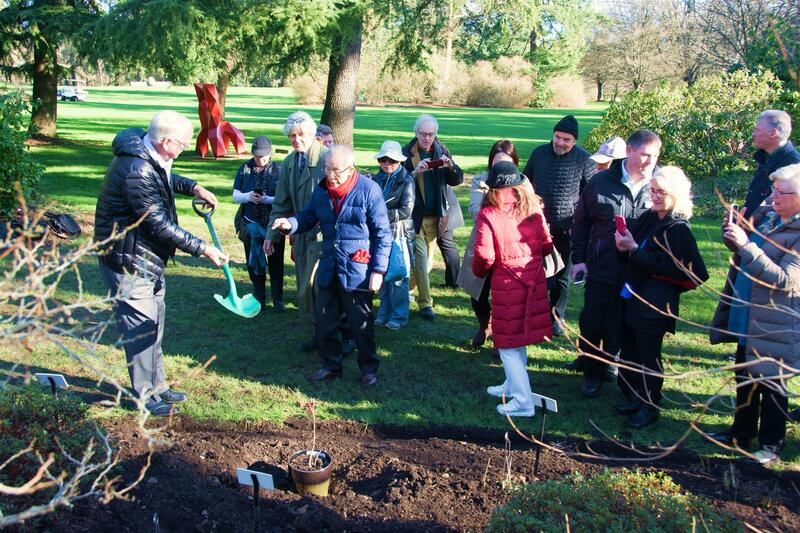 At the conclusion of the Rotary Peacebuilding Conference in Vancouver, Rotary International President Ian Riseley planted a Ginkgo tree in the VanDusen Garden. 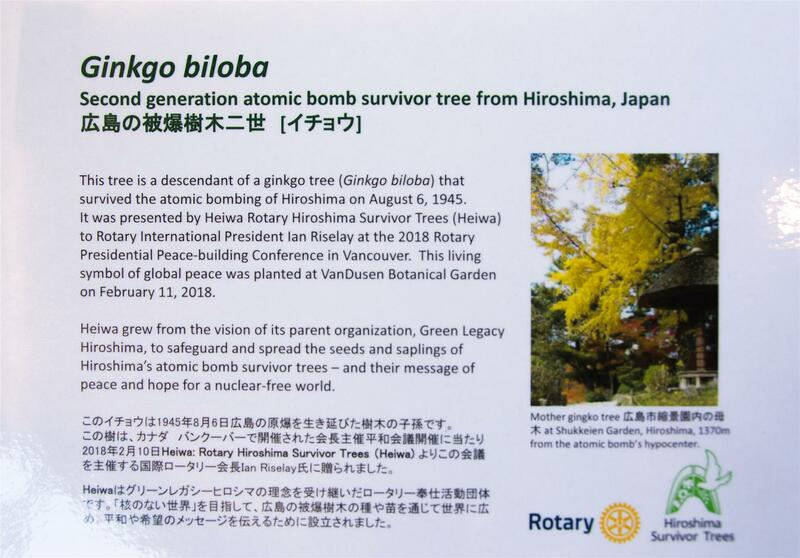 This tree is a descendant of a ginkgo tree that survived the atomic bomb dropped on Hiroshima on August 6, 1945 - a message of peace and hope for a nuclear-free world. 2017 saw significant progress in our campaign to eradicate polio from the world forever. 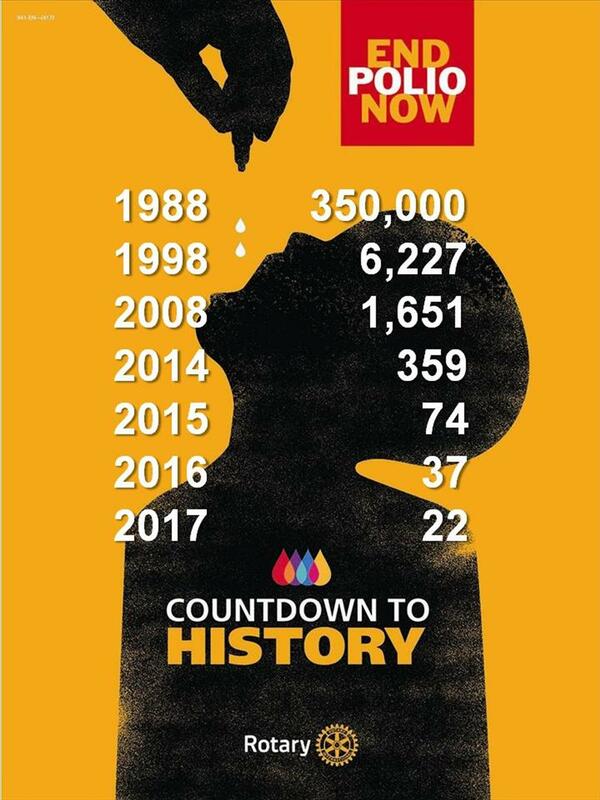 We saw the fewest cases in history caused by the wild polio virus, Only 22 cases were confirmed worldwide in only two countries - Pakistan with 8, and Afghanistan with 14. 2018 will be a critical year for the polio eradication programme, and we will be strengthening efforts to reach all the vulnerable children and to find the places that the polio virus still lurks in the environment. 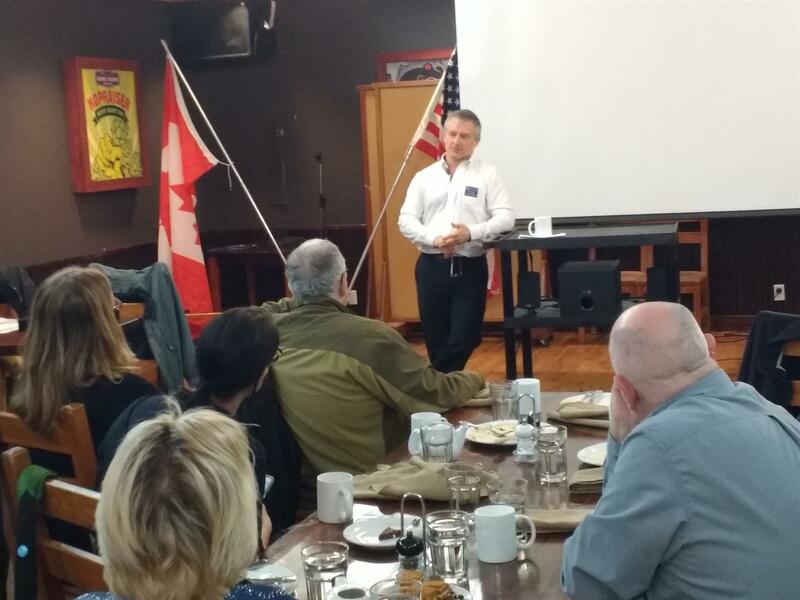 At our meeting on February 1st, Rotary member Max Saenger described what it takes to prepare a venue for the Olympic Biathlon. Max is the Course Technical Expert for the Biathlon at the upcoming PyeongChang Winter Olympics. He was also the Venue Director for the biathlon at the 2010 Olympics in Whistler. At the same meeting, the Squamish Rotary club received a cheque for $10,000 as a District Grant from the Rotary Foundation. This will go towards the new Squamish Hospice facility. 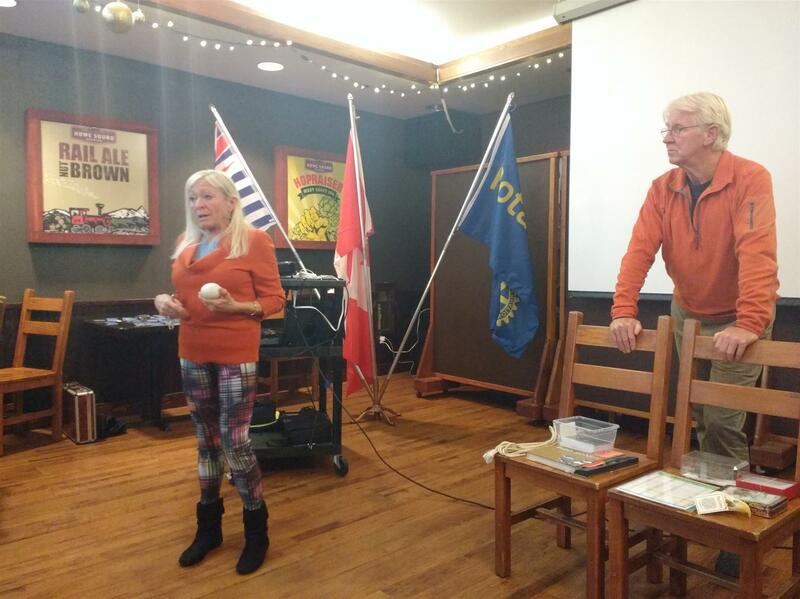 We were delighted to have Krystle tenBrink and Michalina Hunter from Squamish CAN as our speakers today. 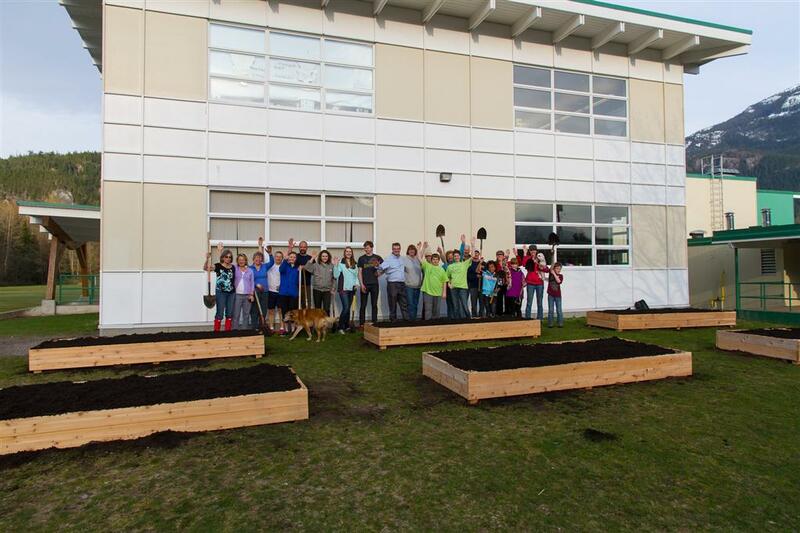 They updated us on their activities and specifically about the Mamquam Edible Schoolyard Project (MESY). This wonderful project is now starting phase 2. See http://squamishcan.net/mesy/. 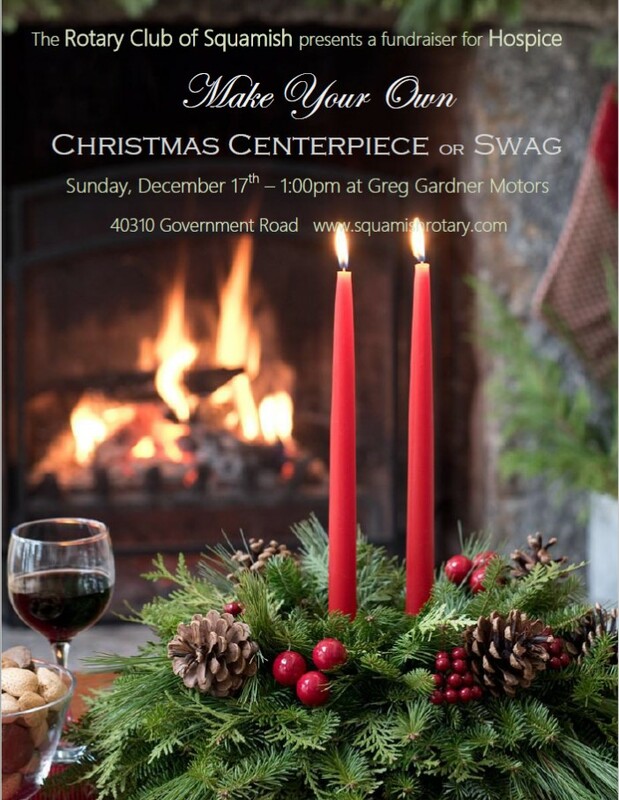 Make your own Christmas Centrepiece or Swag. Rotary Club of Squamish in support of Squamish Hospice Society. Greg Gardner GM, 40310 Government Road. RSVP to lyndarocha@live.com or text 250-639-6054. Bring your favourite centrepiece container (some available for a fee). All greenery, ribbons, ornaments, and tools supplied. Santa’s elves around to assist. Ready-made centrepieces available for purchase. All proceeds will go to the new Squamish Hospice Palliative Care Centre. Water Project at Hosanna Children's Home. The water is flowing at the Hosanna Children’s Home. Hosanna Children's Home for the Destitute in rural Kenya. 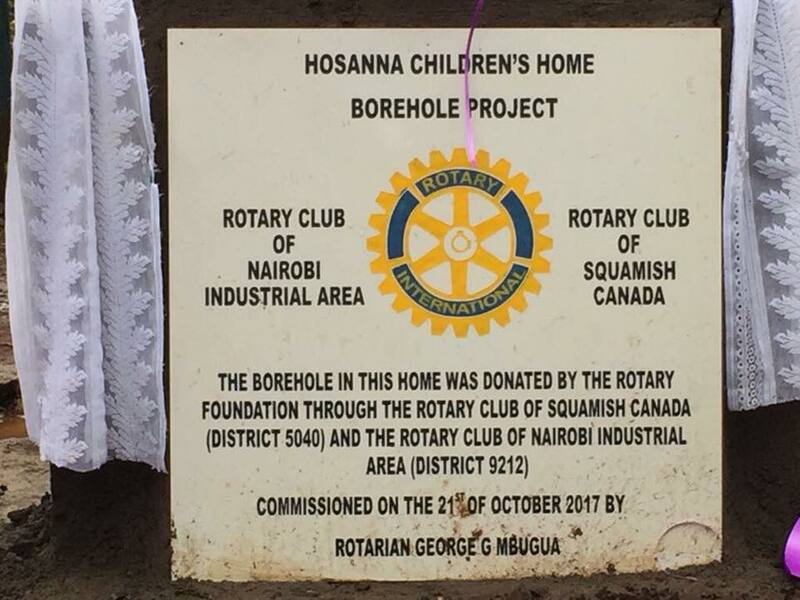 An International project by the Rotary Club of Squamish, the Rotary Club of Nairobi Industrial Area, and the Rotary Foundation. This project included a well, water storage tanks and solar power. 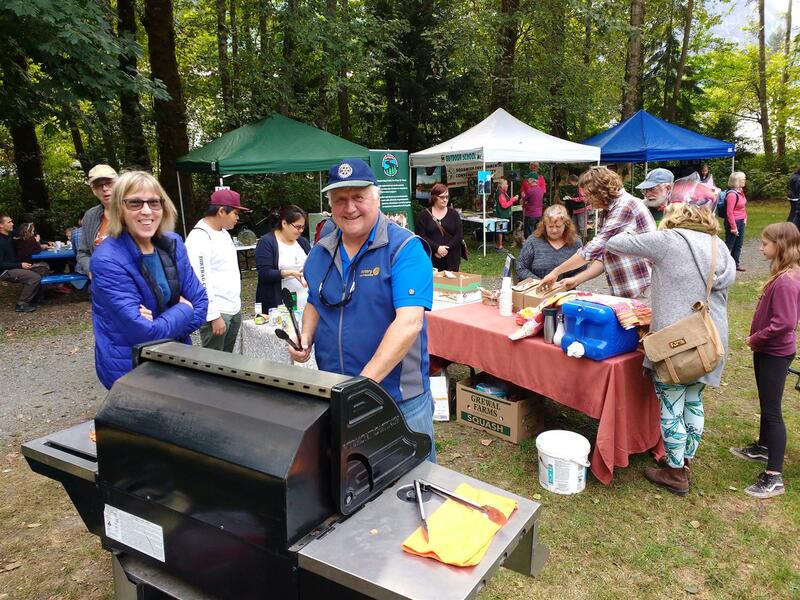 Rotary joined the Squamish River Watershed Society during the annual Rivers Day event and served up burgers and hotdogs. Jada Hurford from Howe Sound Secondary will be in Belgium for a year-long exchange. We welcome Charles Deome from Belgium as our in-bound exchange student. An exchange is the opportunity of a lifetime for the more than 8,000 students who participate each year. By sharing your own culture & embracing a new one, you help foster global understanding—& learn a great deal about yourself & your country in the process. For more information click HERE. Once again, we will be serving up the world famous Rotary Beef-on-a-Bun during the Logger Sports show on Saturday & Sunday, August 5th & 6th. The Rotary Beef BBQ has been a tradition at Loggers Sports for over 50 years. Canada AAA beef is slowly roasted over a bed of alders and served on a brioche bun with fried onions. Serving starts at 12 noon. It is always a crowd favourite - soooo good!! 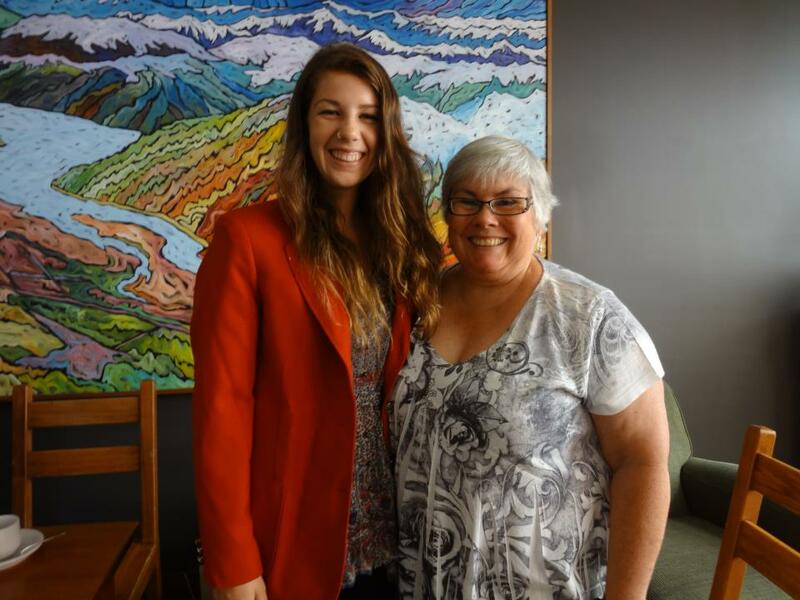 Jada Hurford from Howe Sound Secondary was presented with her blazer today by Denise Rittberg, Youth Services Chair. 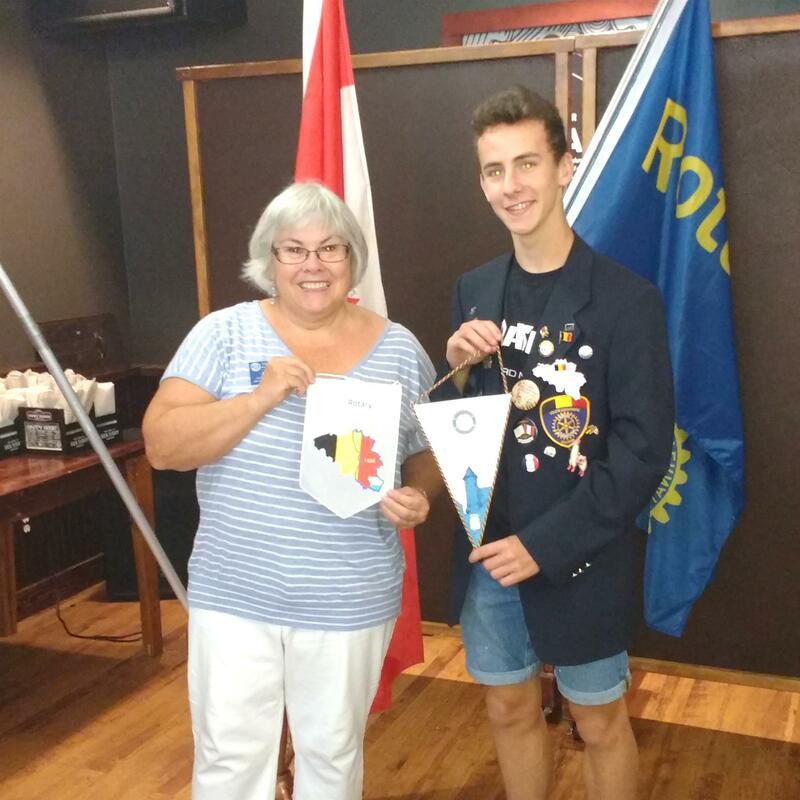 Jada is heading off in mid-August for a year's adventure as a Rotary Youth Exchange student, She is going to the Wallonia (french-speaking) part of Belgium - new culture, new language, new friends, new experiences! We wish you a great time Jada. 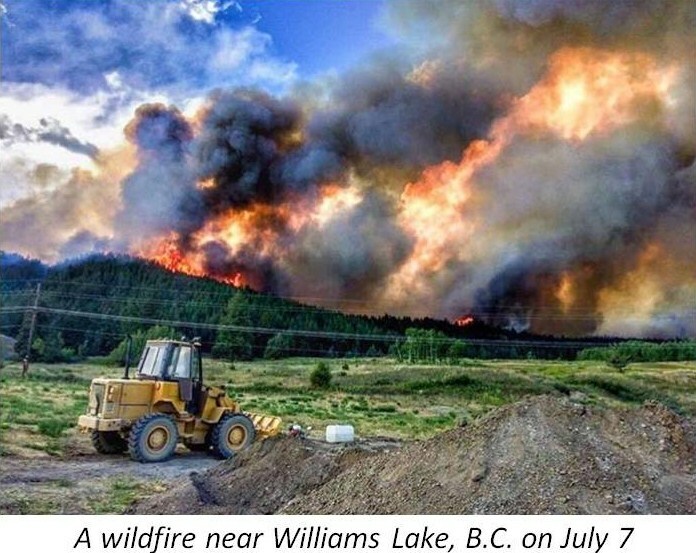 Rotary District 5040 is pleased to announce that the Rotary BC Wildfire Recovery Fund is now established and accepting donations. These funds will be made available to Rotary clubs for restoration projects for the victims of the wildfires currently burning in the Cariboo region of the British Columbia. Once the situation with the fires has ended, a Rotary team will work with the local clubs to allocate funds to Rotary projects in the affected areas to assist with the recovery and rebuild in their communities. We Welcome Three New Members. Melissa Saunders (left) is an assistant Bank Manager. Allie Meeres (right) is a Community Engagement Officer. 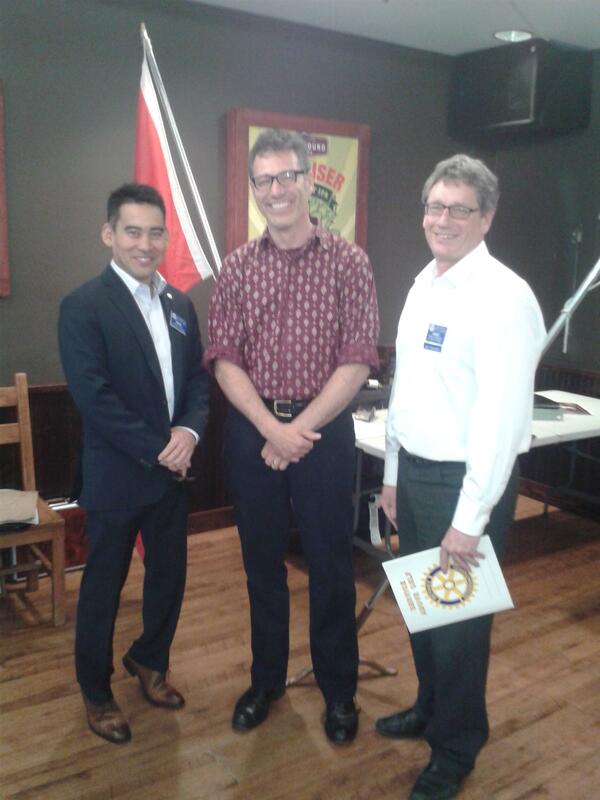 Roger Duncan (right) is a retired lawyer and former member of the Rotary Clubs of Vancouver and Harrow (England). Judy McQuinn is the new President of the Rotary Club of Squamish for 2017-18. We are looking forward to another great year with Judy and her Executive team (listed on the right), serving our communities locally and around the world. 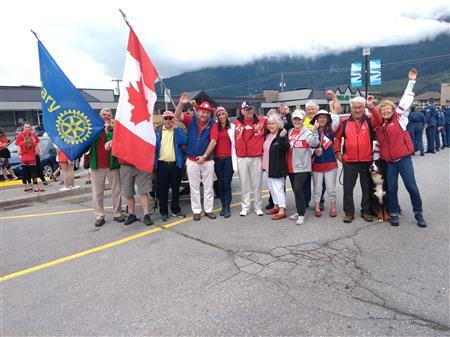 Squamish Rotary joined the community and participated in the parade to celebrate Canada's 150th birthday. 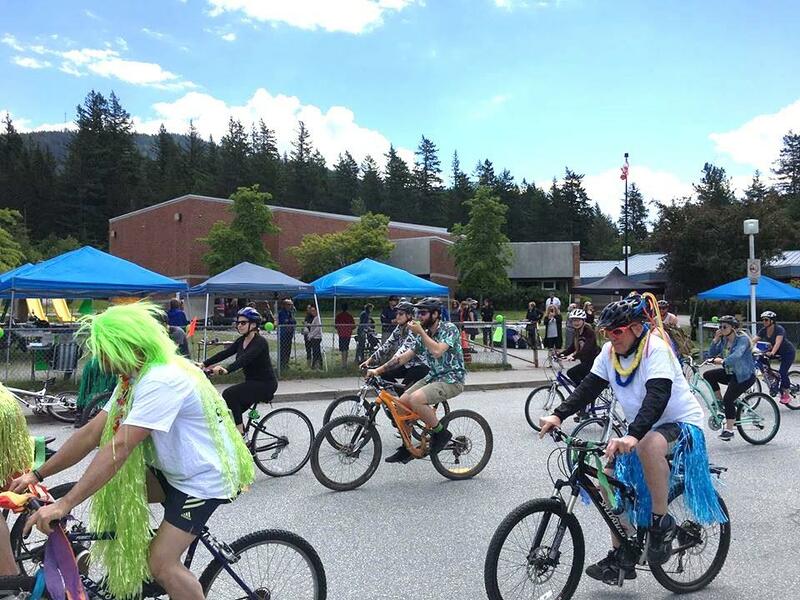 The Rotary Club of Squamish is proud to support Ride Away Stigma, and the work to raise awareness about mental health and provide support for those with mental health issues. $20,000 was raised at this year's event which will go to Sea to Sky Community Services to support mental heath programs in the corridor. More information can be found at www.rideawaystigmas2s.com. At our meeting today, Squamish Rotary distributed $20,000 in Gaming Grants to community organisations in support of their programs. The focus was on Youth, Seniors, Health, and Safety programs. Talks from keynote speakers to inspire and motivate you. Develop your leadership & professional skills with workshops. Additional information available on the Summit Website. On March 14th 2017, the four Sea to Sky clubs convened on Whistler Mountain for Fresh Tracks breakfast and a morning of group skiing. Then we reconvened in Black's Pub for appies and fellowship as well as for some prize giving. More photos HERE. Rotary Hearts are SOLD OUT for 2017...orders for the 2018 'Rotary Hearts in Downtown Squamish' will begin around mid-January 2018. In the meantime, check out all the wonderful messages of love in shop windows all along Cleveland Avenue! 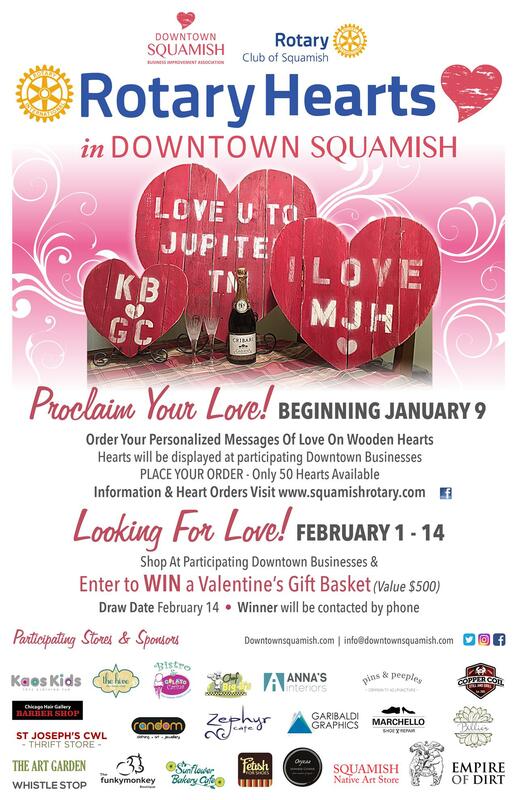 And while you there, when you shop in any of the stores that are showcasing a Rotary Heart, put your name into our draw for a Valentine Basket which is valued at $500. Draw will take place on February 14th. 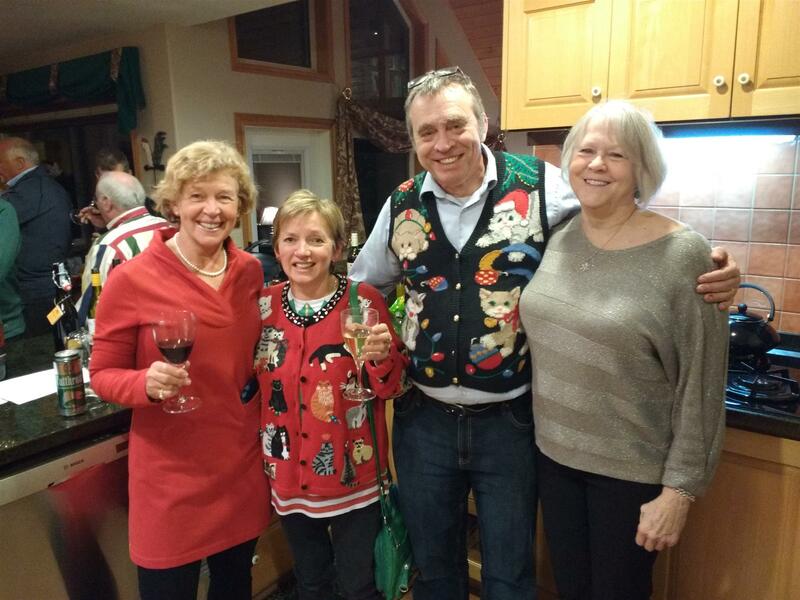 Our annual Christmas party was held at the home of Ann & Owen Carney. In keeping with the theme "Christmas in the Quebec countryside", G-Van Catering served up a French Canadian menu including Tourtiere, beans, and sugar pudding. Thanks to Rose Fast for organizing the evening and all the games and prizes. It was a great evening of fun and fellowship. 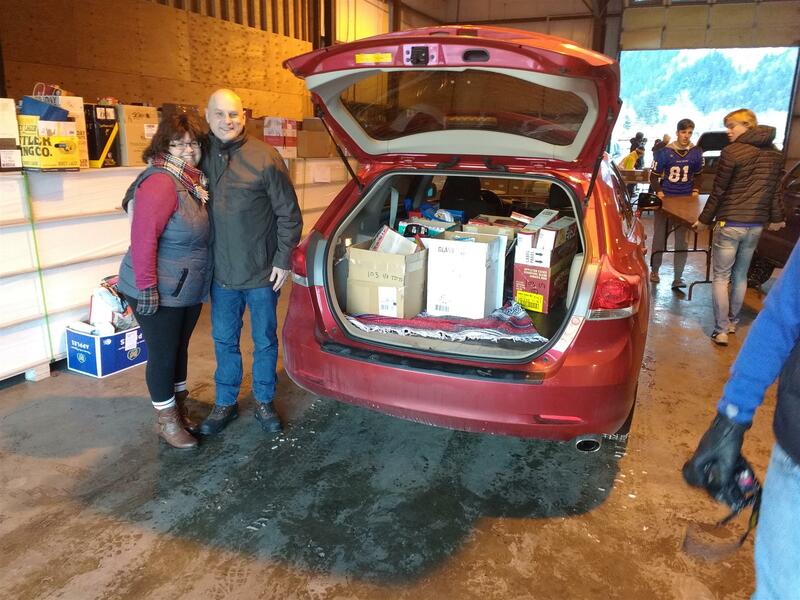 Squamish Rotarians joined other volunteers to deliver Community Christmas Cares hampers to the less fortunate in our community. When all the hampers were delivered, we met at the Shady Tree for lunch. 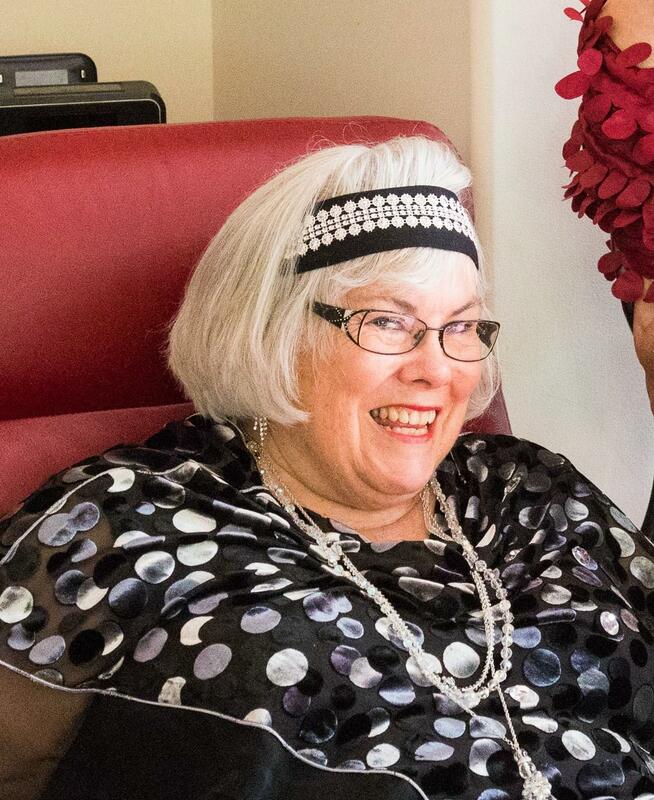 District Governor Lyn Stroshin - Special Guest on Dec 8th. 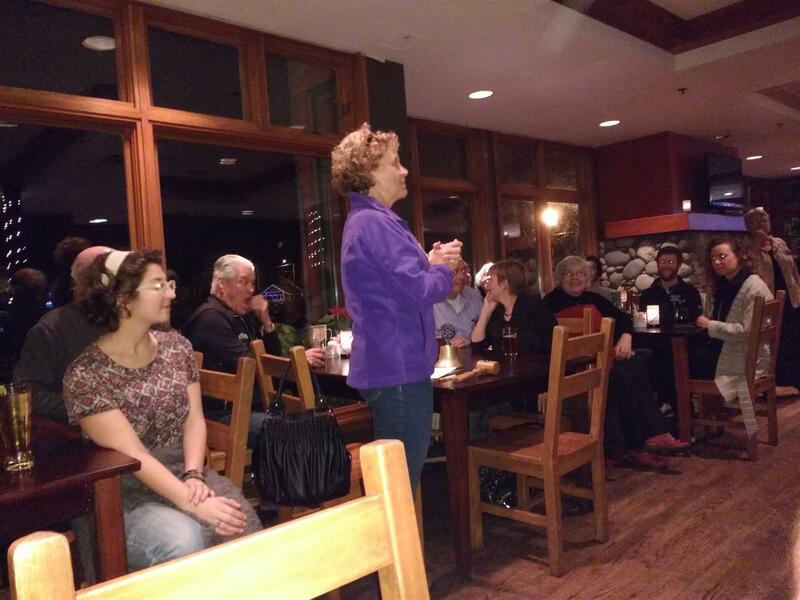 District Governor Lyn Stroshin visited our club on Dec 8th. She shared a cake celebrating the 100th year of the Rotary Foundation. presented Paul Harris Fellow awards, and gave an inspiring talk on the work of Rotary and what Rotary means to her. Jeanette Levett, Clint Levett, and Chris Humphrey received Paul Harris Fellow awards for their support of the club with upgrades at the Beef BBQ hut. 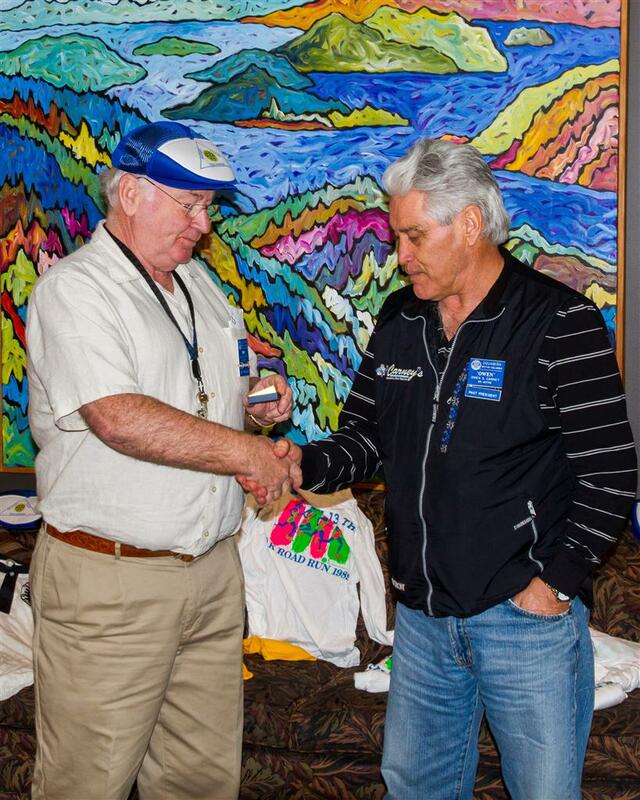 Lloyd Ingraham was presented with his PHF+4 recognition for his support of the Rotary Foundation. Garry Shearer (L) and Don Patrick (R) did the honours. At our meeting this week, member Lynda Rocha talked about her vocation as an event planner. Do you need help in planning a wedding or other event? Contact Lynda. At the Remembrance Day ceremony on November 11th, Ryoma Mori, our youth exchange student from Japan, laid the Rotary wreath at the cenotaph in honour of our veterans and all the men & women who have served our country. 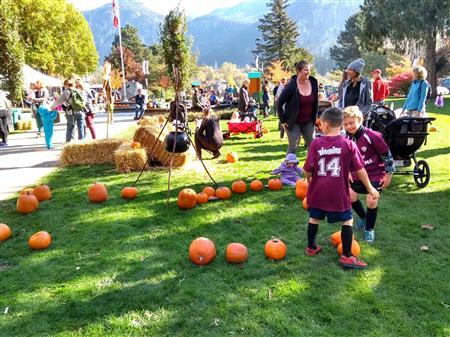 The Rotary Club of Squamish was a major sponsor of Pumpkin Patch in the Park, a community event to celebrate Halloween and raise money for Community Christmas Care. 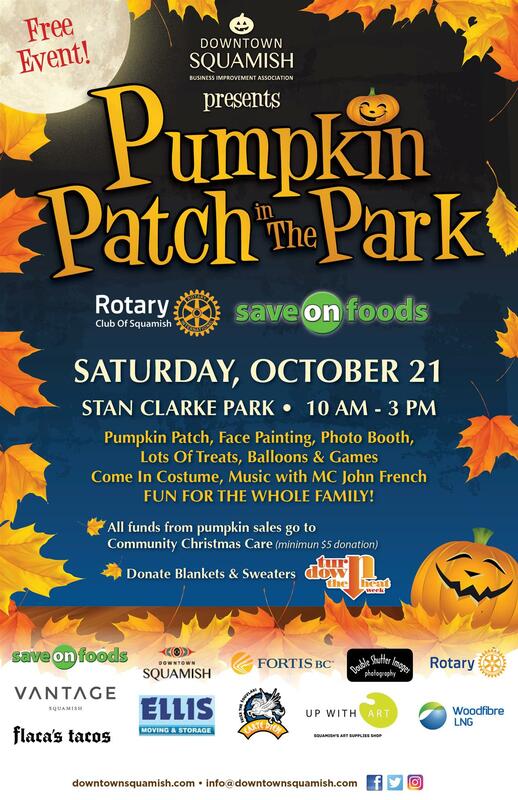 Rotary will be at the "Pumpkin Patch in the Park" on October 22nd at Stan Clark Park in downtown Squamish. 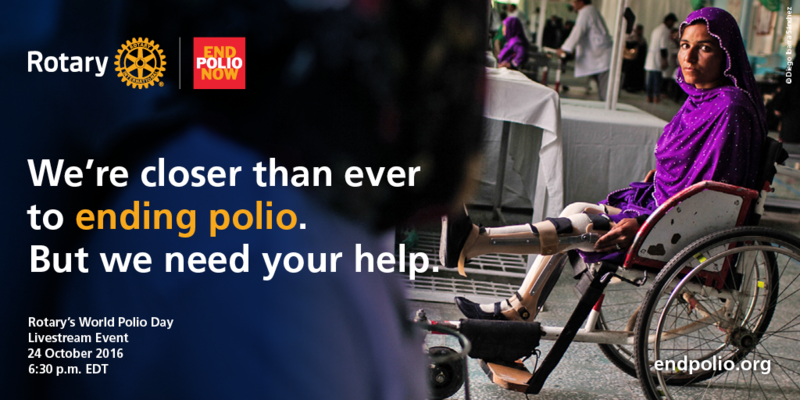 Visit our stand to learn more about Rotary's promise to eradicate Polio from the world forever. After the reception and dinner, several members were called to the podium to highlight some of the events and happenings that occurred over the 50 years. District Governor Lyn Stroshin presented co-Presidents Ian Davis and Pat Taylor with a special message from RI President John Germ. 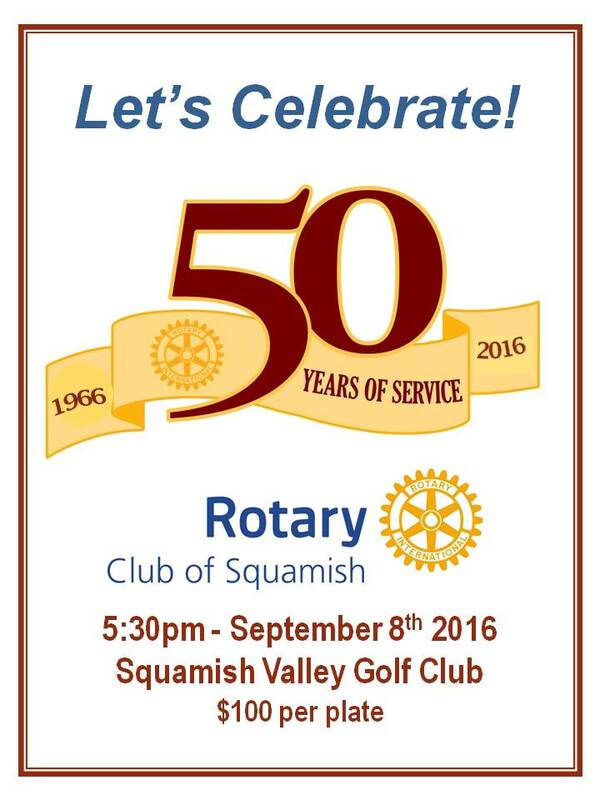 The Rotary Club of Squamish was chartered in September 1966. On September 8, 2016 we are celebrating 50 Years of Service. You are invited to join us. For tickets contact Ray Brickell, brickell@telus.net, 604-898-4572. The Beef BBQ at Loggers Sports is coming up. Have you signed up on the volunteer sheet yet? Contact Barry Wetter (barrywetter@gmail.com) to get on the list. The Rotary Beef BBQ has been a tradition at Loggers Sports for over 50 years. Canada AAA beef is slowly roasted over a bed of alders and served on a brioche bun with fried onions. It is always a crowd favourite - soooo good!! 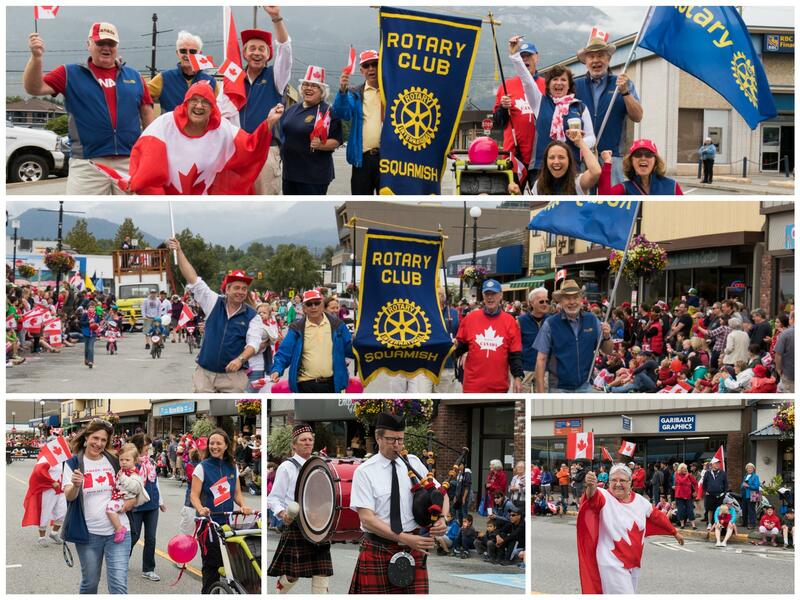 Squamish Rotary participated in the annual Squamish Canada Day Parade. Young and no-so-young joined other community groups on the route to the flag raising ceremony and the start of the festivities. This was Anne's last meeting as President, A big THANK YOU to Anne for your leadership and inspiration. Our co-Presidents for 2016-17 are Pat Taylor and Ian Davis. It was cupcakes all around! Daniel Nduati visited us from Nairobi and gave us an update on his amazing work with the Emmanual Boyz Rescue Centre and the National Youth Empowerment Centre - both dedicated to destitute youth. Squamish Rotary has supported Daniel over many years. John Harvey talked bout the plans for the Mamquam River Campsite; a not-for-profit initiative to provide facilities for recreational campers. 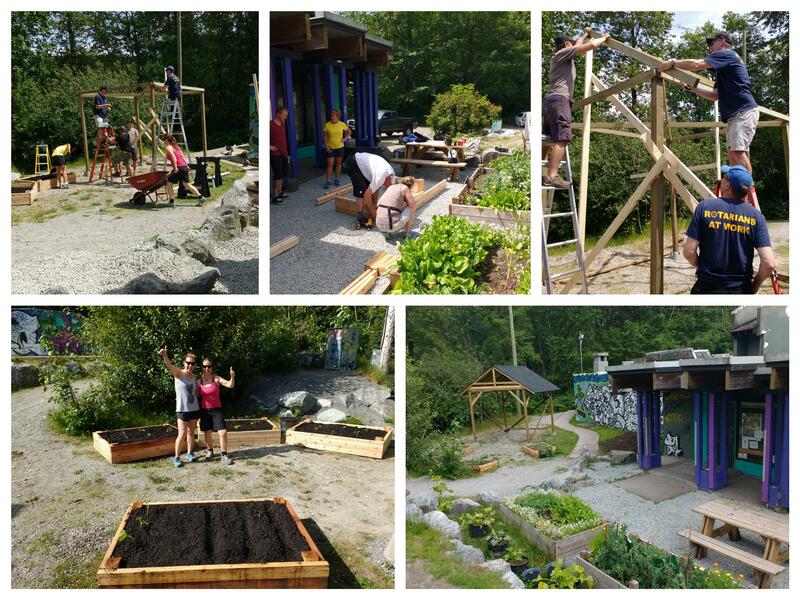 The Squamish Rotary Club partnered with Sea to Sky Community Services to enhance the area around the Youth Centre. The project included building 5 cedar garden boxes, and constructing a small pavilion. It was a fun community project with Rotary providing funding and volunteer labour. On completion of the project, we received a thank you note from the Youth Centre staff. Click "Read More". 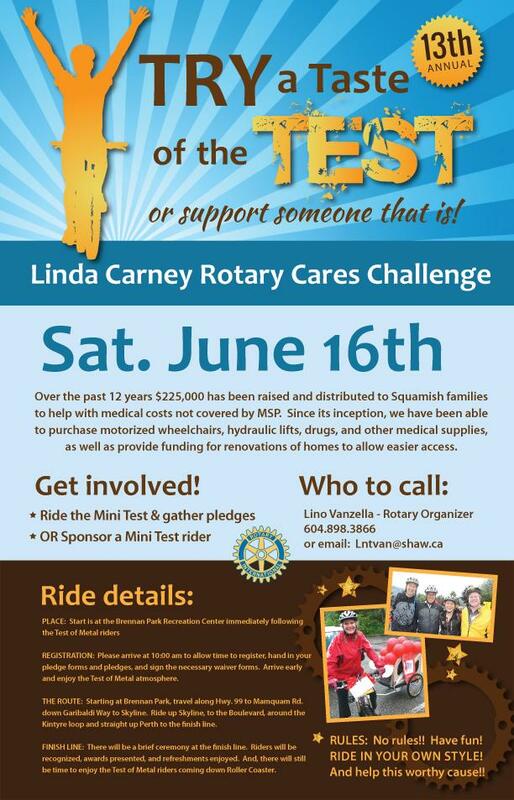 On the day of the last Test of Metal, we once again held the Linda Carney Rotary Cares Challenge ride. Following the ToM riders out from the start, our riders, who had collected pledges, road up to the top of Perth to our finish where refreshments and fun awaited. 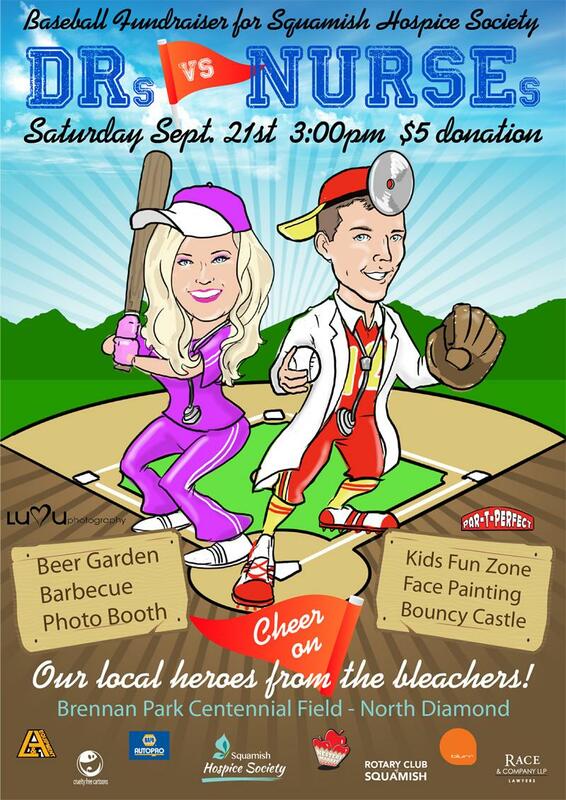 The event raises funds to help Squamish residents with medical expenses not covered by insurance or other means. This year we raised over $8,000. The Installation of the new Executive, Directors, & Committee Chairs for 2016-17 was held at the home of Greg & Lila Gardner. Pat Taylor & Ian Davis will serve as co-Presidents for the coming Rotary year. District Governor-elect Lyn Stroshin did the honours for us. In addition, we welcomed Vicki Haberl as a new member, Denise Imbeau received her Paul Harris Award. 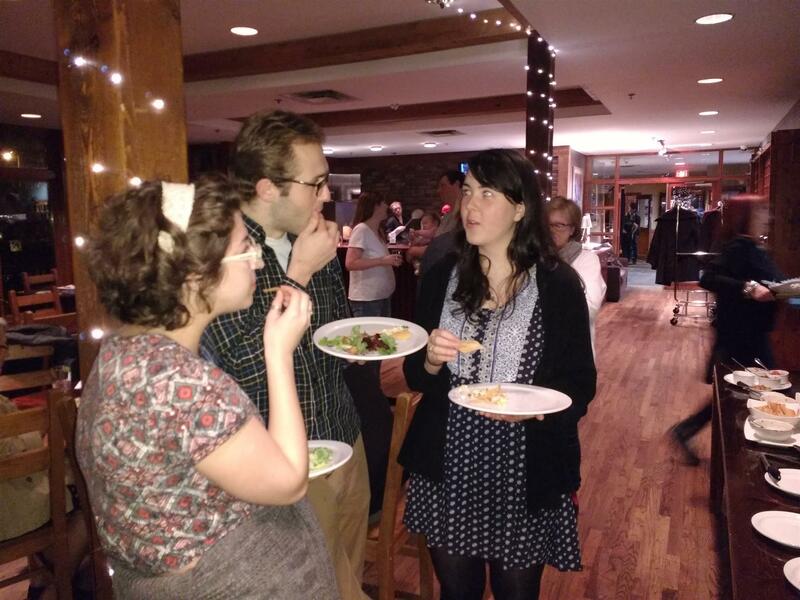 and President Anne recapped her year (and what a year it was!). 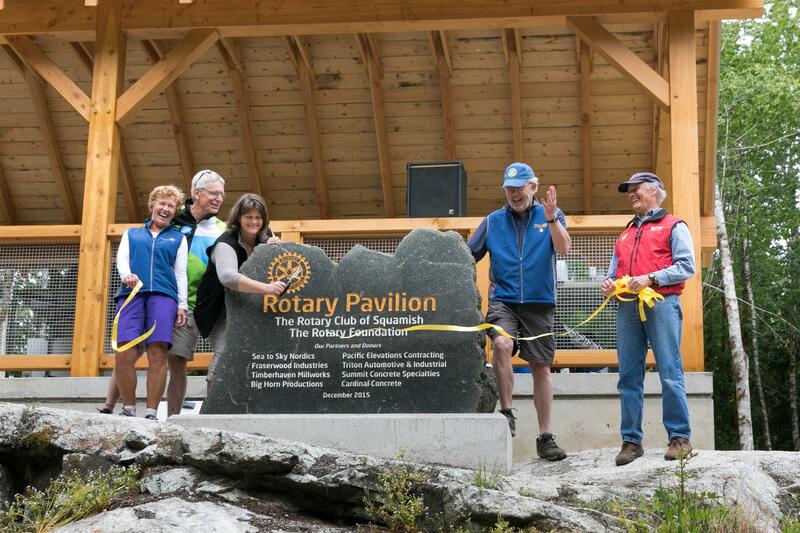 May 15, 2016 was the Official Opening of the Rotary Pavilion at the Squamish Legacy Sports Park. 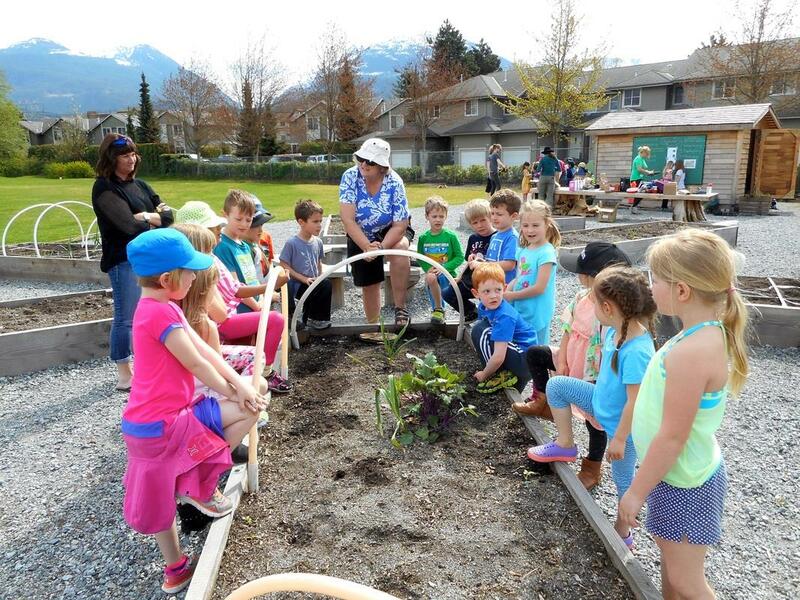 The project was funded by the Rotary Club of Squamish, a District 5040 grant from the Rotary Foundation, and the Sea to Sky Nordics Club. Thank you to our partners, volunteers, and donors who helped make the vision a reality. 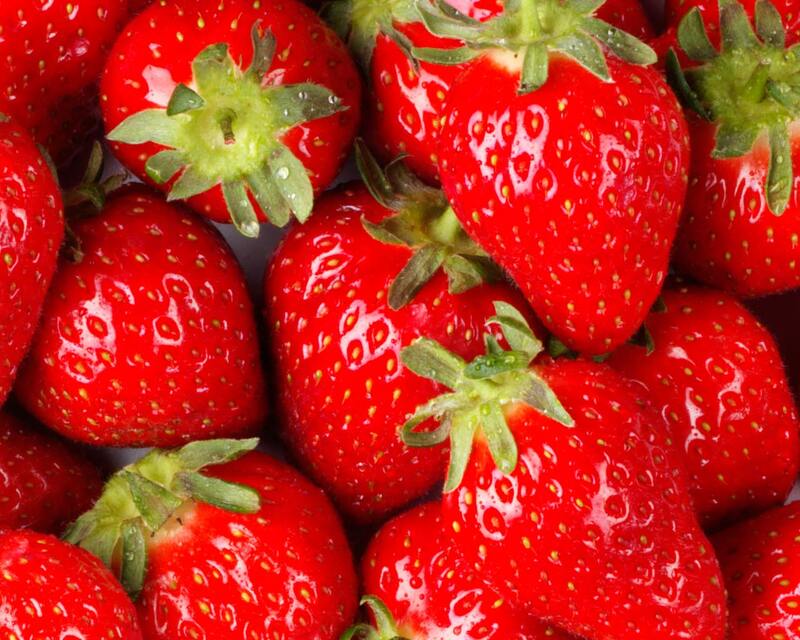 Strawberry Sale - Order yours today! please click on the strawberry man. Official Opening of the Rotary Pavilion & Squamish Legacy Sports Park. 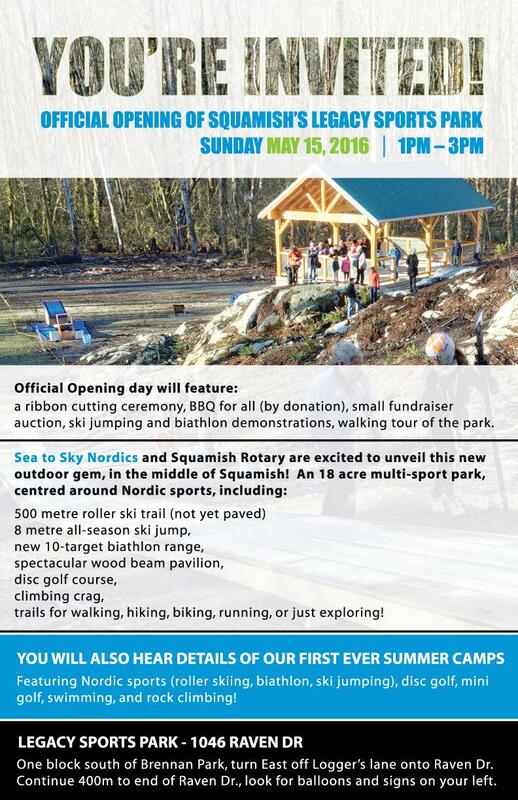 You are invited to the Grand Opening of the Rotary Pavilion and Squamish Legacy Sports Park on Sunday, May 15th, 1:00-3:00pm. Bring your family and friends for the ribbon cutting, BBQ (by donation), ski jumping & biathlon demonstrations. Pope Francis urges Rotarians to continue to END POLIO NOW. Vatican City (30 April 2016) — Nearly 9,000 members of Rotary from across the globe attended the Jubilee Audience at the Vatican in St. Peter’s Square on 30 April 2016 at the invitation of Pope Francis. At the end of the Audience, a delegation of Rotary members - led by Rotary International President K.R. 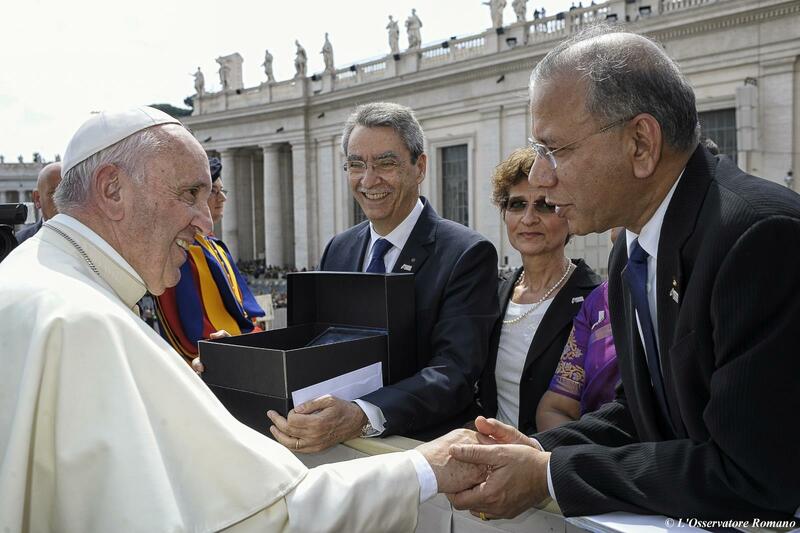 (Ravi) Ravindran - met Pope Francis where he emphasized the importance of vaccinations against polio and urged Rotary to continue. 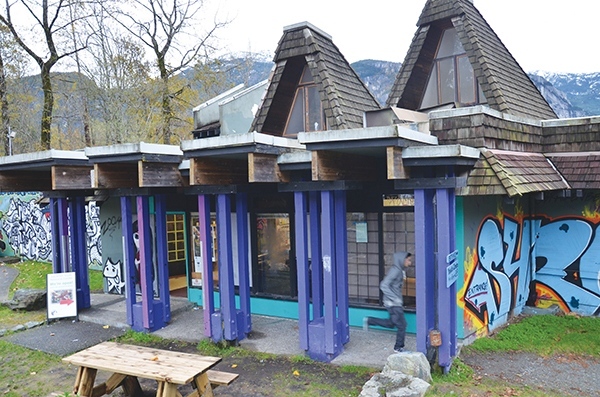 Squamish Youth Centre to be "beautified". 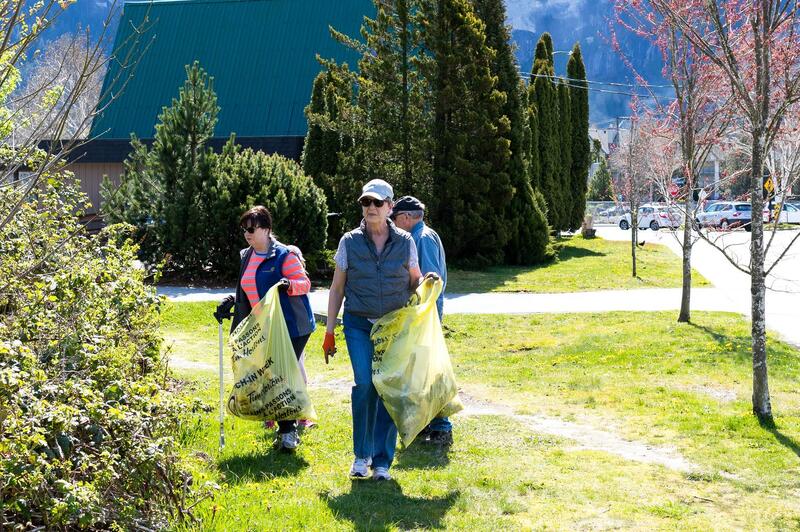 Rotary Squamish will team with the youth and Sea-to-Sky Community Services to improve the outdoor space around the Youth Centre. Work will include landscaping, garden beds, a small pavilion, and lighting. To kick off the project Inis LeBlanc presented a cheque to Alex Anderson, the Manager of Outreach Services for Sea to Sky Community Services. It ain't your Grandpa's Rotary club any more! 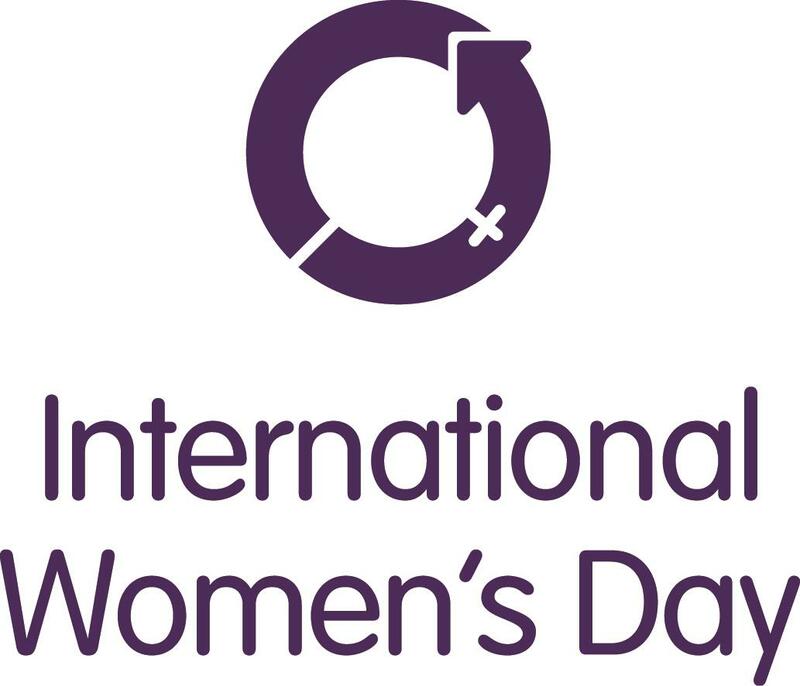 March 8th was International Women's Day. 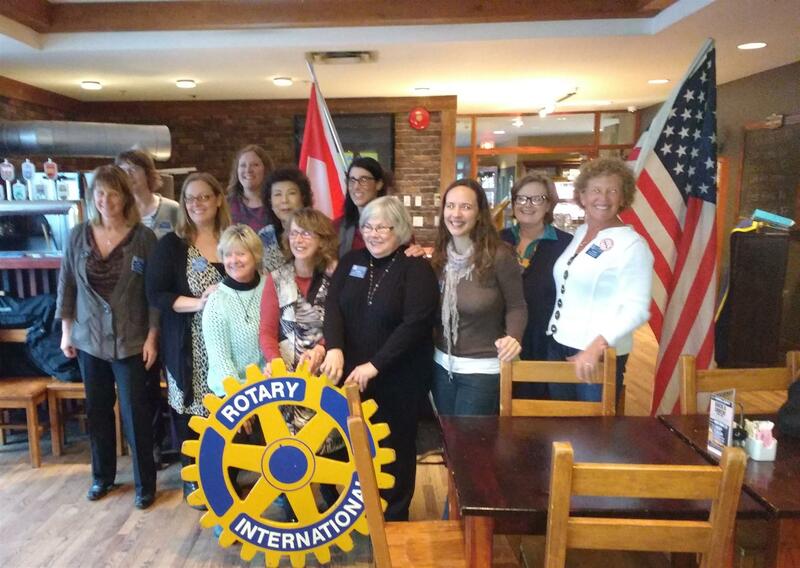 We celebrate the women of the Rotary Club of Squamish and the wonderful work that they do in our club, in our community, and around the world. Rose fast (front in turquoise sweater) was one of the first three women to join our club in 1991. The four lucky winners of the Club 200 Lottery final draw for the 2015-2016 series were #63 $200 Stewart Kerr sold by Glen McEachran, #135 $1000 Alison Hopkins sold by Ian Davis, #162 $1000 Jayden Kanka sold by Michael Kanka, and the big winner #155 $2000 Cathy Scott sold by daughter-in-law Liz Scott. 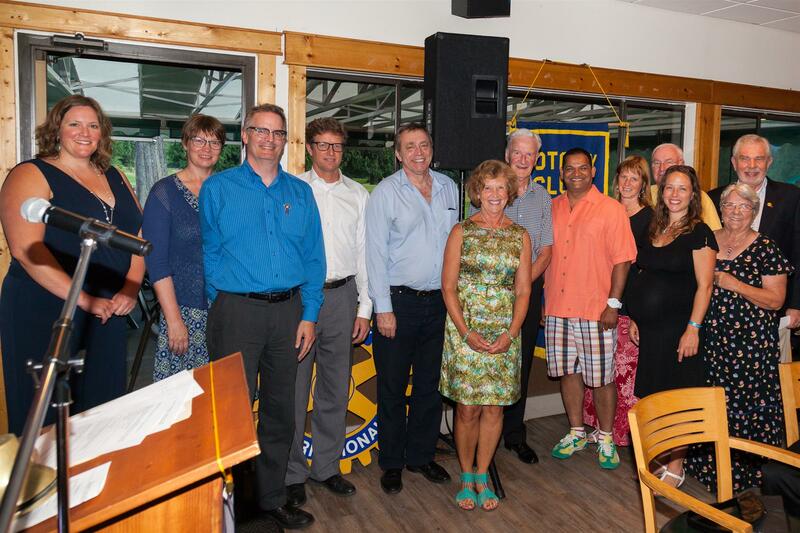 Congratulations to the winners, the non-winners and the sellers for a great job allowing the Rotary Club to distribute $10,000 to those groups in Squamish that need a little extra help. At our meeting this week, Shana Murray from the Howe Sound Women's Centre spoke about the Centre's Camp for young girls. The club presented a cheque to Shana to support the camp. Other guests were Hilda Rizun and Karen Smith from Hilltop House. We donated funds to them for the Friday night family dinners. 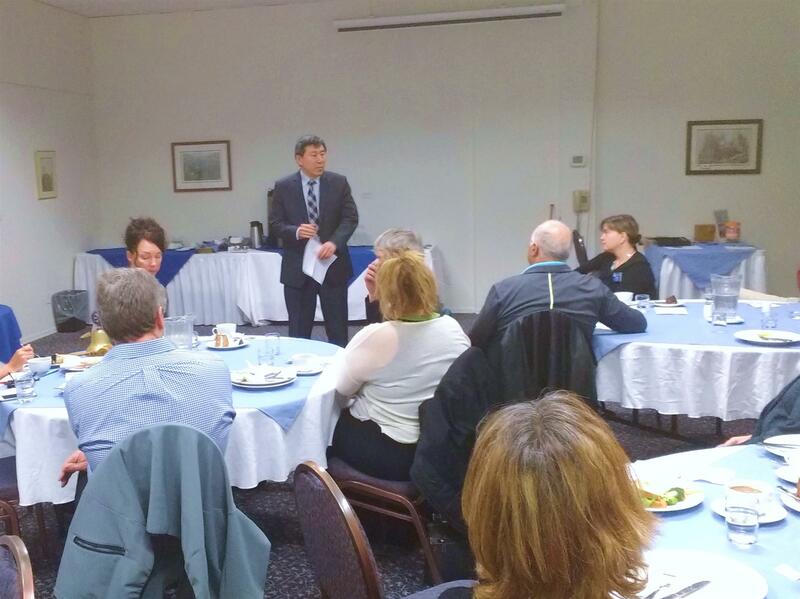 Jim Chu, former Chief of the Vancouver Police Department shared his knowledge on the safety and challenges of aboriginal women on the downtown eastside. He spoke about the joint efforts being made by the local community and police working together. With the upcoming International Women’s Day on March 8th, we are arranging a Speaker Series beginning with “The Safety of Aboriginal Women on the Downtown Eastside” on February 25th, and “Howe Sound Woman's Centre Girls Camps” on March 3rdt. Other meetings during March will focus on women and women’s issues. Despite making up 50% of the world’s population, presently only 22 per cent of all national parliamentarians are female. Women in most countries earn on average only 60 to 75 per cent of men’s wages and violence against women and girls continues to exist throughout the world. We invite you to join us at our Thursday 12 noon meetings in considering women’s place in Rotary, our society, and the world as we discuss gender equality, women’s empowerment and women’s human rights. February 25th at the Sea-to-Sky Hotel. 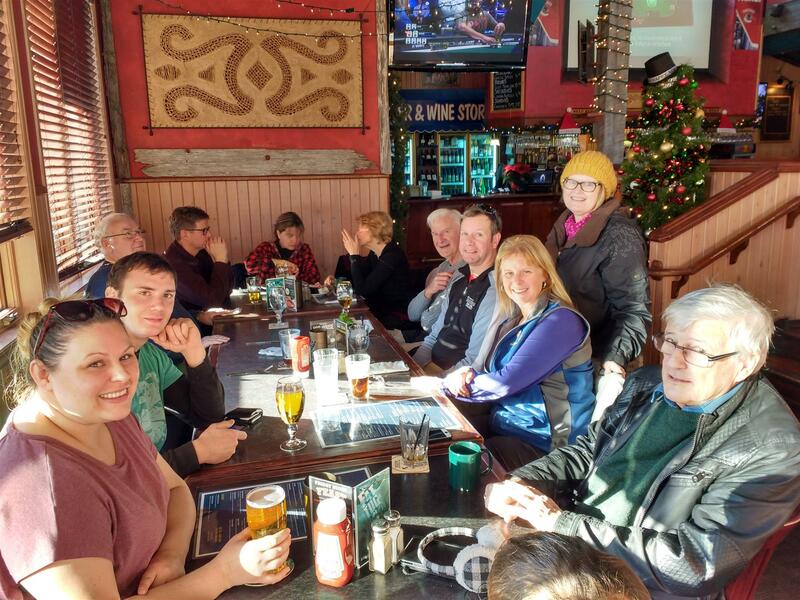 All other meetings at the Howe Sound Brew Pub. A lunch charge will apply. Groom,Gillespie's Fine Spirits Ltd., Counterpart Coffee, Nootka Naturals. Jan 21, 2016: Kevin Haberl spoke about the emerging state of Provincial relations with aboriginal peoples, the changing legal landscape that is driving those relations, and the historical roots that underpin today’s challenges. Kevin remains optimistic about the future state of these relationships, without understating the enormous challenges facing both aboriginal peoples and BC’s society at large. Kevin is with the Ministry of Forests, Lands, & Natural Resources and is involved with First Nations relations. Jan 28th, 2016: This was the Monthly Evening Meeting and Pizza Nite. Many guests came along as did a bunch of Rotaractors. We all got to know each other by doing a bit of Speed Dating. It was a fun evening! December 17th was a great day- full of service and fellowship. It started at 9am with joining other volunteers from Community Christmas Cares to collect and deliver Christmas hampers. Then lunch at the Shady Tree. And followed by a jovial and fun Christmas party hosted by Bruce and Sonja Lebans. District Governor John Anderson and his wife Claire were welcome visitors on December 10th. John gave an inspirational talk on what's happening in Rotary District 5040, and had many personal anecdotes on what Rotary has meant for him. 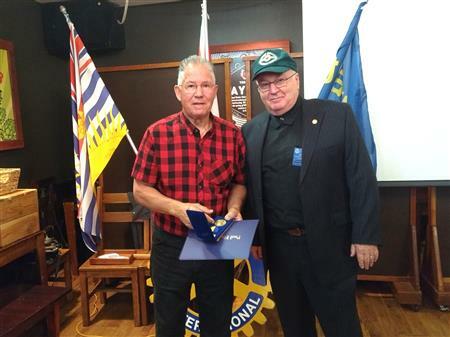 He also presented several awards to members of the Squamish Rotary Club. During November, President Anne set a goal to have fun, learn and share information about Rotary, and to build goodwill and better friendships. of the club’s programs, or charities. (funded by the November fines). Lunch meetings featured guests from our Rotaract Club who challenged us with Rotary Trivia, Tanya Hall with a look into RYLA (Rotary Youth Leadership Awards), and Don Evans with a presentation on the Rotary Foundation. 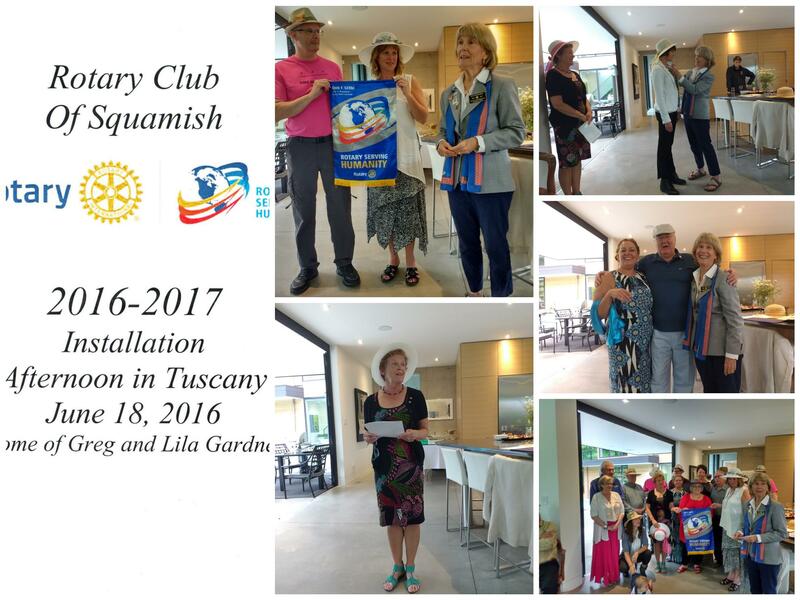 The last few months have been busy for Squamish Rotary. 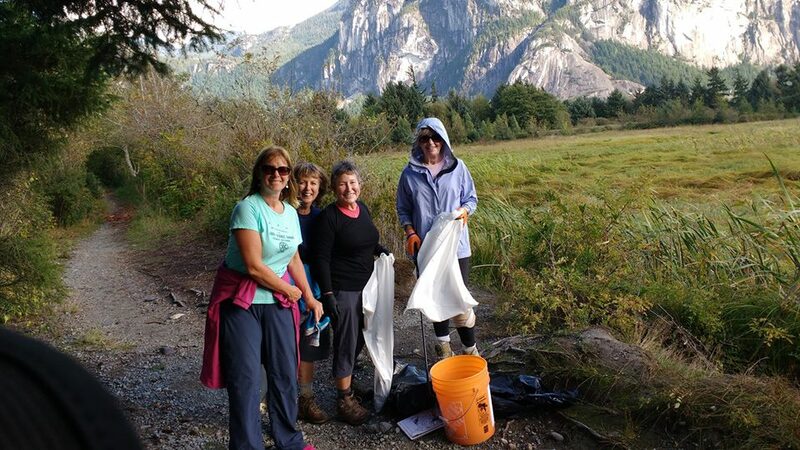 Squamish Rotarians joined the Squamish River Watershed Society for Rivers Day at the estuary restoration project of the old Westbarr logsort site. 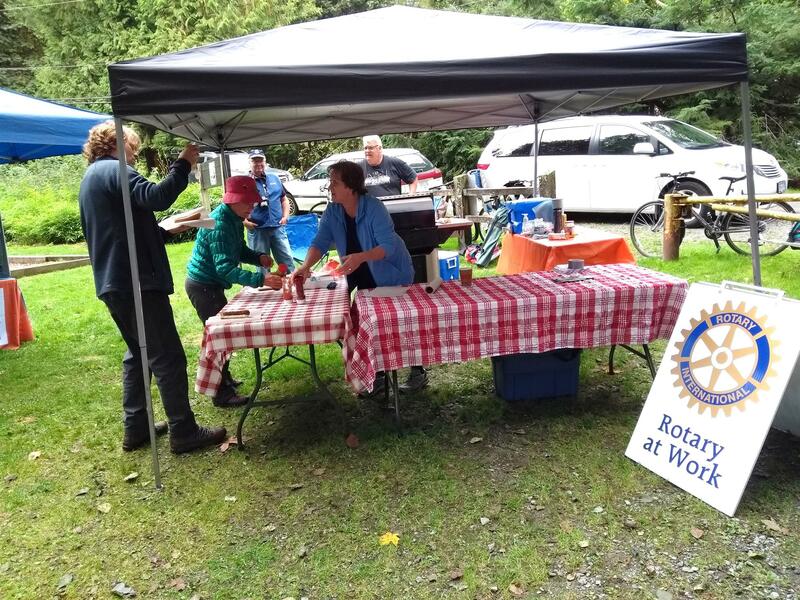 Rotary provided a BBQ and refreshments. 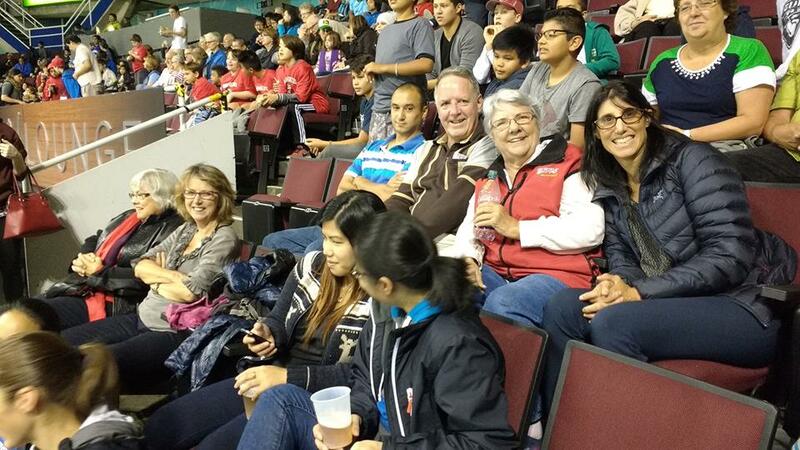 A group of Squamish Rotarians travelled to the Pacific Coliseum to join more Rotarians for "Rotary on Ice" where the Vancouver Giants played the Tri-Cities Americans in a WHL hockey game. The event was in aid of Rotary’s campaign to end polio and a portion of the ticket proceeds went to PolioPlus. 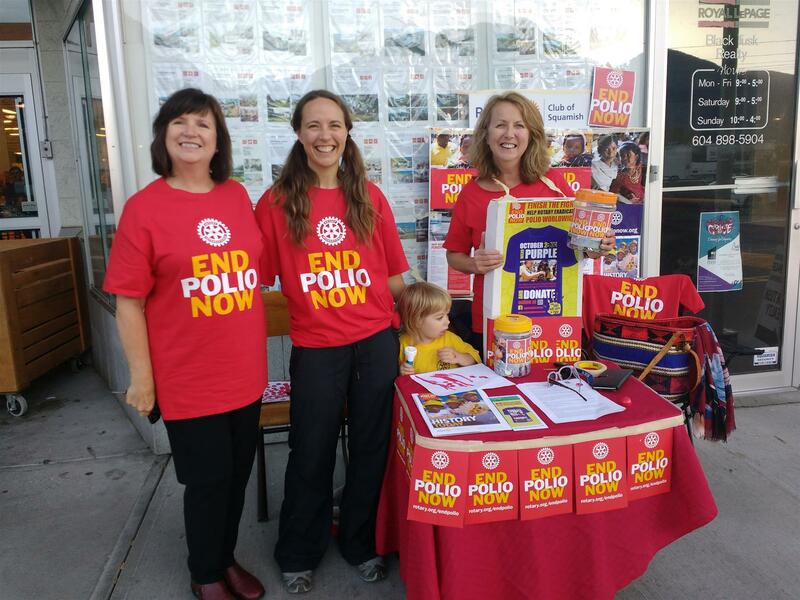 Squamish Rotarians had several booths around town to raise awareness about polio and Rotary's commitment to End Polio Now. We were joined by a local resident and polio survivor who told us how important Rotary's work is, and how Rotary helped her as a young girl. At this special meeting chaired by President Anne and emcee'd by Doug Race, we honored local citizens, long serving members, and a very special Rotarian - Lloyd Ingraham on his 99th birthday. 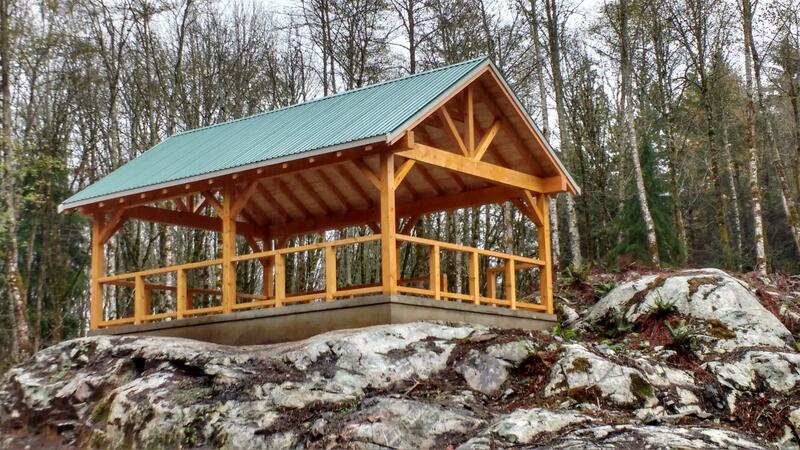 The Rotary Pavilion at the Squamish Legacy Sports Park is nearing completion. We hope to have the grand opening soon! The site of the pavilion (centre) and the all-weather beginner ski jump (right). The framing going up for the foundation walls. The pump truck from Cardinal Concrete getting ready to pour the foundation walls. 1500lbs of prime Alberta beef slow roasted over an alder fire. 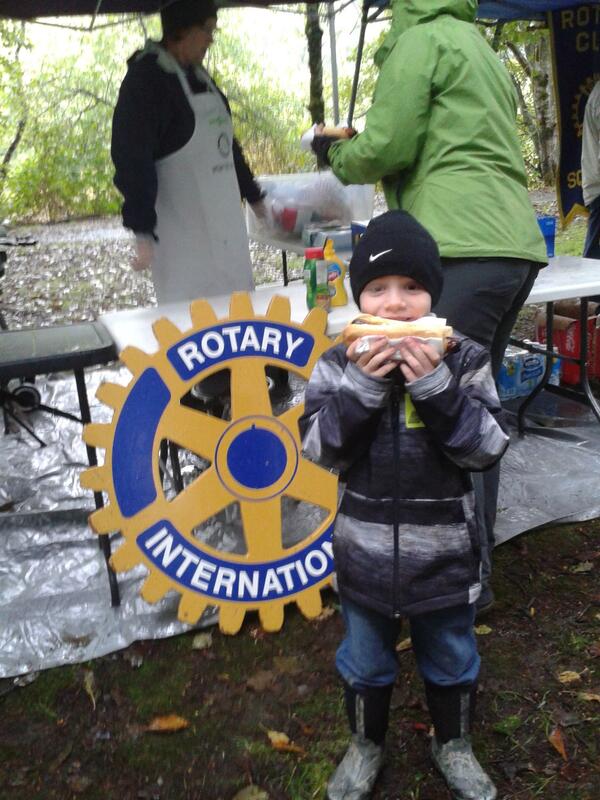 We hope you enjoyed your Rotary beef-in-a-bun! It's been a tradition at the Loggers Sports Festival for over 50 years. See you again next year! 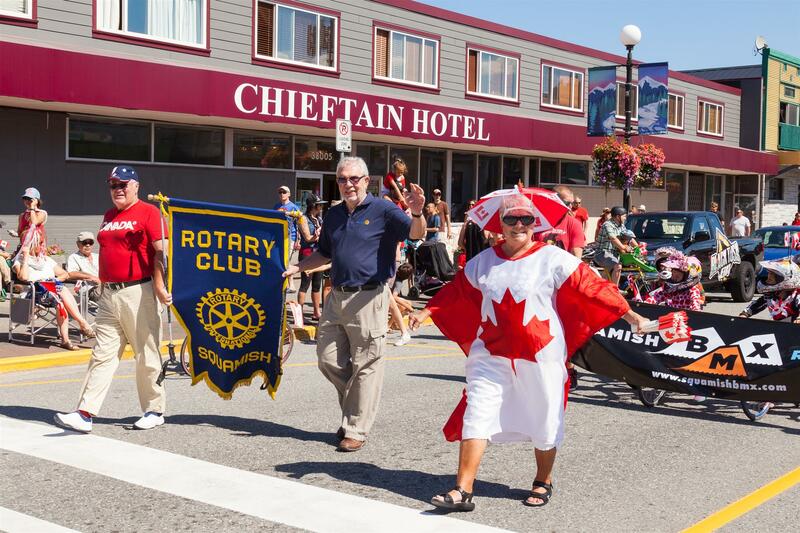 Don Patrick, Brian Finley, and Judy Fowler carry the flag for Rotary in the Squamish Canada Day parade. 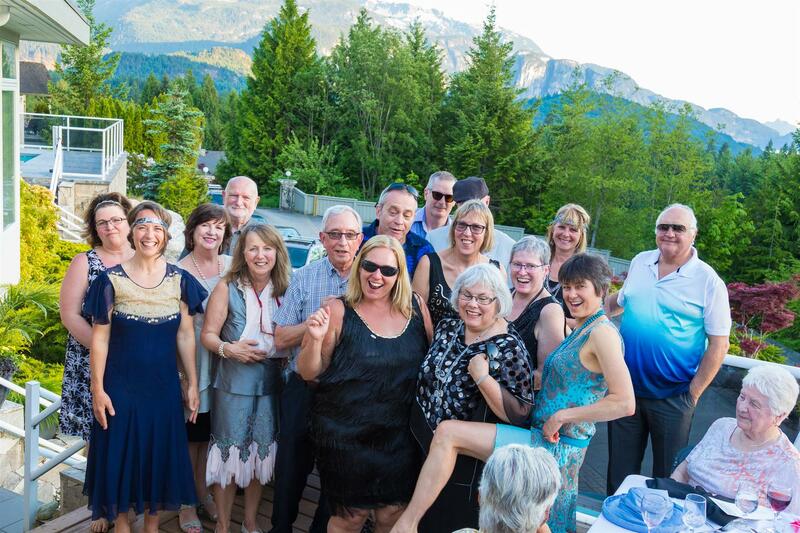 The Installation Evening for the new 2015-16 Executive was held at the Squamish Valley Golf Club on June 25th. New member Jeanette Levett is inducted by President-elect Anne. Karen Vanzella is awarded a Paul Harris Fellow by Foundation Chair Don Patrick. Outgoing President Brian passes over to Incoming President Anne Carney. President Anne and her new Executive team. Streaming out after the main Test-of-Metal riders, Rotarians and friends rode the short course in support of the Linda Carney fund to help folks with medical expenses not covered by insurance. Riders and supporters at the finish of the Linda Carney ride. In support of the Rotary Foundation, a group of Rotarians boarded Pat & Gary's boat for a cruise to Gambier Island for an afternoon of games, swimming, orchard golf, and of course a superb dockside BBQ. Jose Luis Aviles, our exchange student from Mexico, recounted his year in Squamish and all the activities he was involved in. Come back soon Luis! 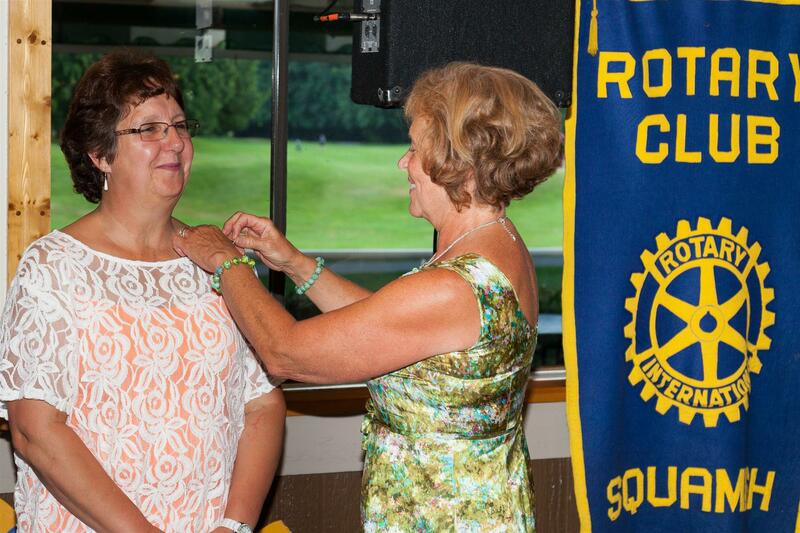 Susan was inducted into the Rotary Club of Squamish on May 28th 2015. She is a massage therapist and the founder of Squamish Integrated Health. She has spent many years practicing post surgical therapies and working with cancer patients. Susan is also an avid climber, skier and mountain biker, and currently serves as a District Councillor. with President Brian Finley, Susan, proposer Ian Davis, and Assistant District Governor Liz Scott . 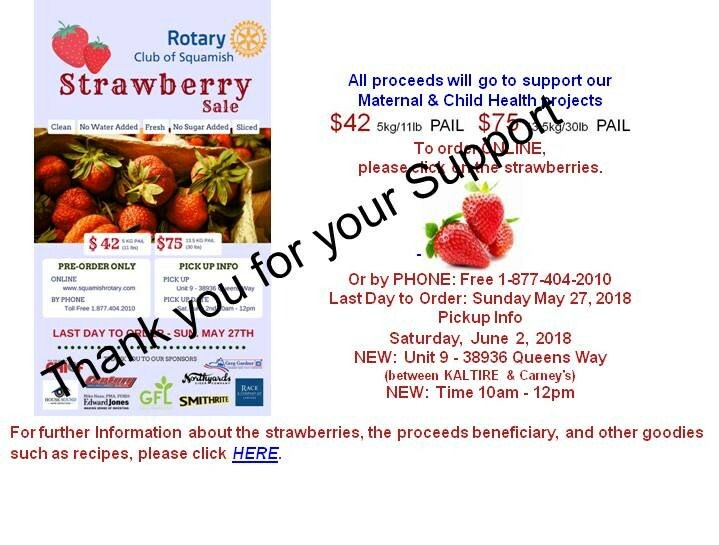 Purchase fresh, local Fraser Valley Strawberries (washed, sliced and ready to enjoy) from Squamish Rotary, and support our International project in Mexico. 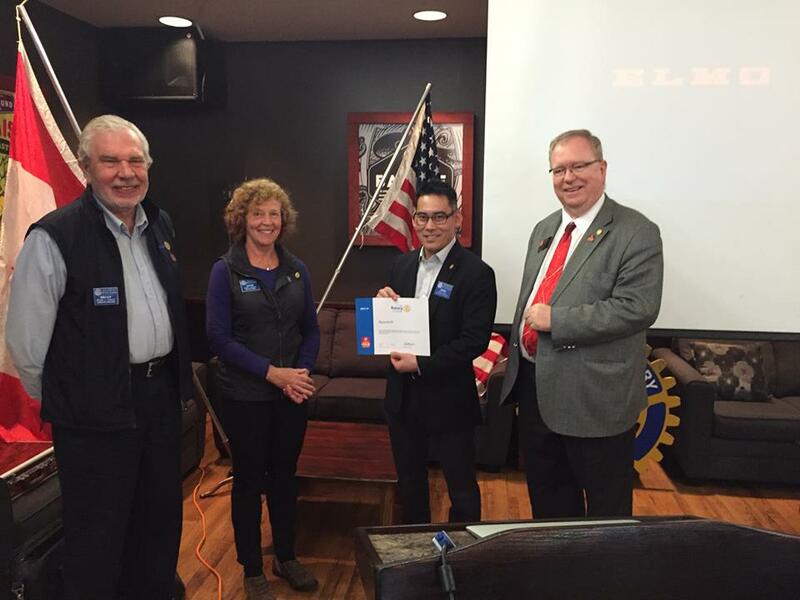 At the District 5040 Conference the Rotary Club of Squamish was awarded the Presidential Citation 2014-15 for achieving the membership, service, and engagement goals set by Rotary International President Gary Huang. MEXICAN FIESTA Fundraiser - it was a BLAST !!! May 2nd 2015 at the Squamish Valley Rod & Gun Club. - the Pavilion at the Squamish Legacy Sports Park. 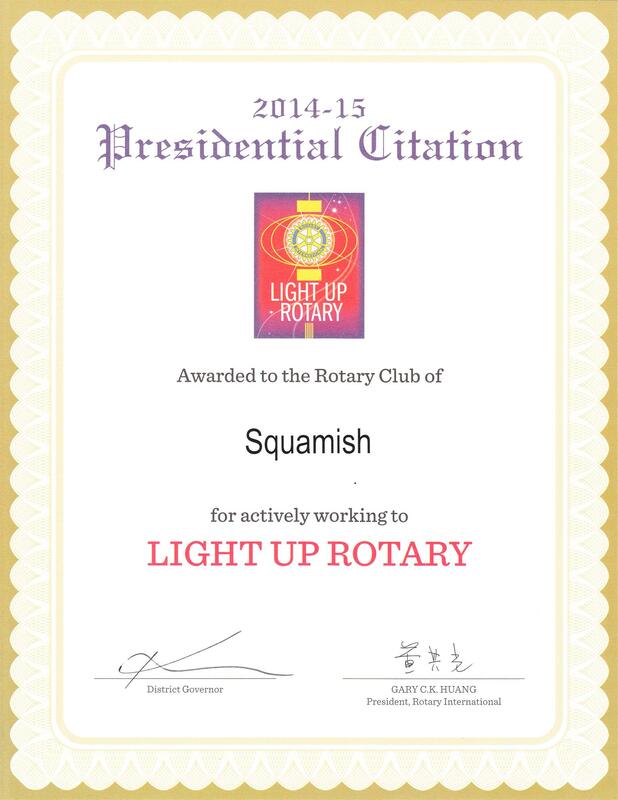 Squamish Rotary truly appreciates your support. 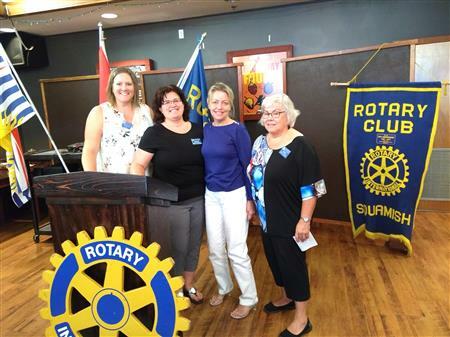 Rotary shares out funds to the Squamish Community. 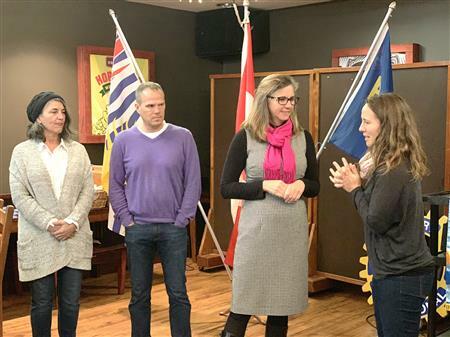 The Rotary Club of Squamish donated $15,000 in gaming funds to community groups on April 16. From left: Pat Taylor (Rotary), Liz Scott (Rotary), Geoff Park (Camp Summit), Christine Buttkus (Suicide Prevention Group), John Howe (Squamish Search & Rescue), Ann Marie McKenzie (Big Brothers Big Sisters), Rick Smith (Sea to Sky Nordics Biathlon Bears), Lori Broker (Elementary School Breakfast Program), Don Patrick (Rotary). 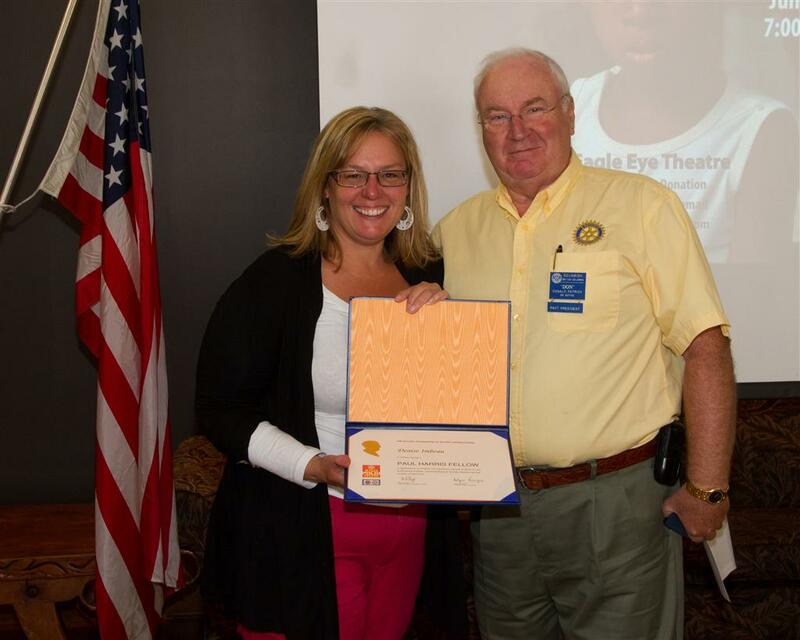 March 12, 2015: District Governor Ken Wilson presented the club with Rotary International recognition for the club's contribution to Polio Plus during the 2013-2014 Rotary Year. Pictured is current President Brian Finley, President Elect Anne Carney, and accepting the certificate is Past President Mike Nasu. 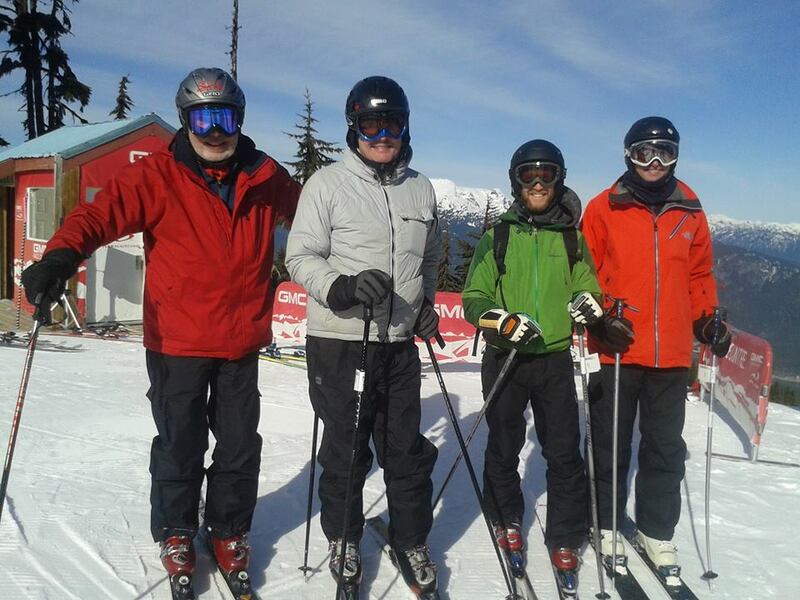 March 3rd was the 4th annual Rotary Sea-to-Sky Ski Day & Challenge Race hosted by the Whistler club. 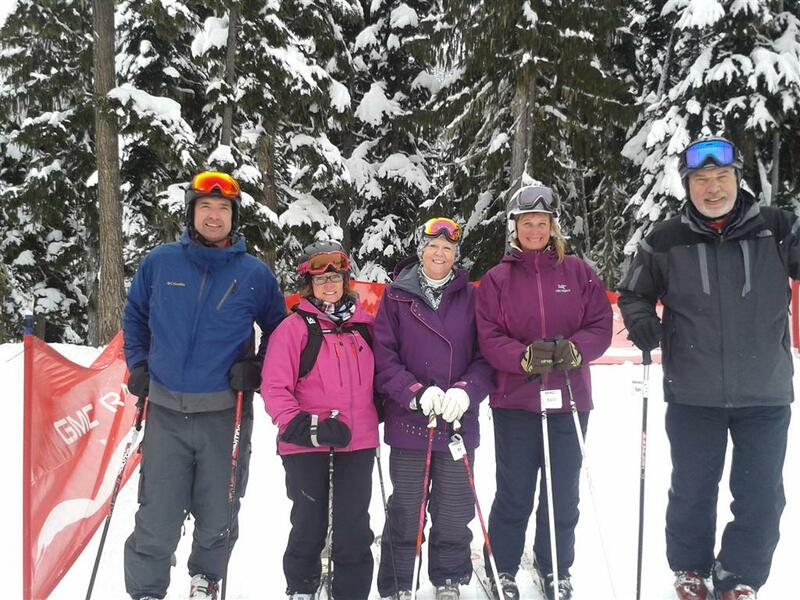 A great day of skiing & fun with the 4 Rotary clubs. 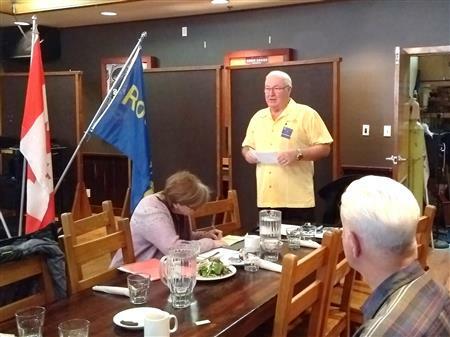 Steve Julien is the newest member of Squamish Rotary. He is sponsored by Mike Nasu and was inducted by District Governor-elect John Anderson on Feb 12, 2015. Pictured: Mike. DGE John, Steve, President Brian. The Rotary Club of Squamish is proud to have sponsored the play “maladjusted”, which was performed by Theatre for Living in Squamish on Jan 27th 2015, the 1st of 28 performances in BC and Alberta communities. The play asks provocative questions about mental health and the systems that we have to give and receive care; and seeks a dialogue towards a new understanding about mental health and a more humanized approach to mental health care. Proceeds will benefit the Sea to Sky Suicide Awareness and Prevention Working Group. At the Club meeting on January 15th 2015, 12 members were recognized with Paul Harris awards for their contributions to the Rotary Foundation. 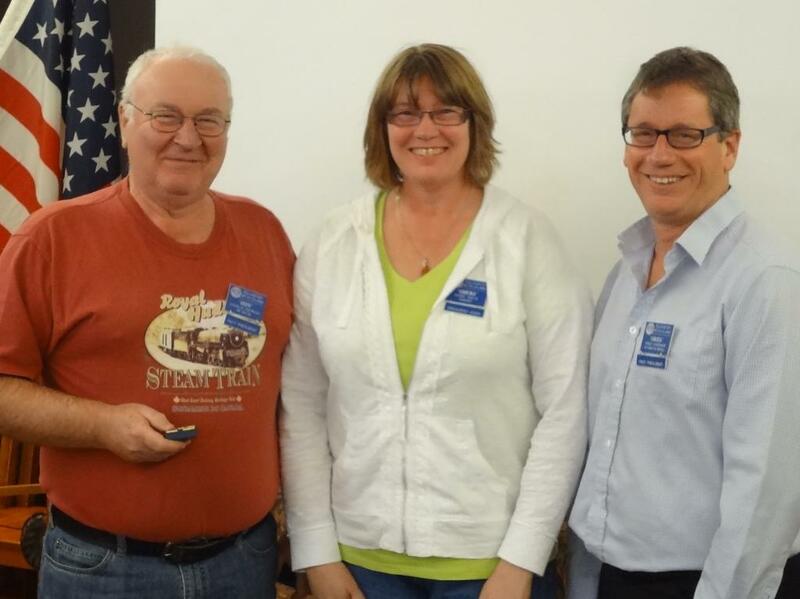 Sheri Davis and Ian Davis (centre) receive Rotary Foundation Major Donor recognition. With District Governor Designate Don Evans, Club Foundation Chair Don Patrick, and Club President Brian Finley. More photos of the awards and the meeting are in the Photo Album (scroll down on the left). Friday, October 24th is World Polio Day. 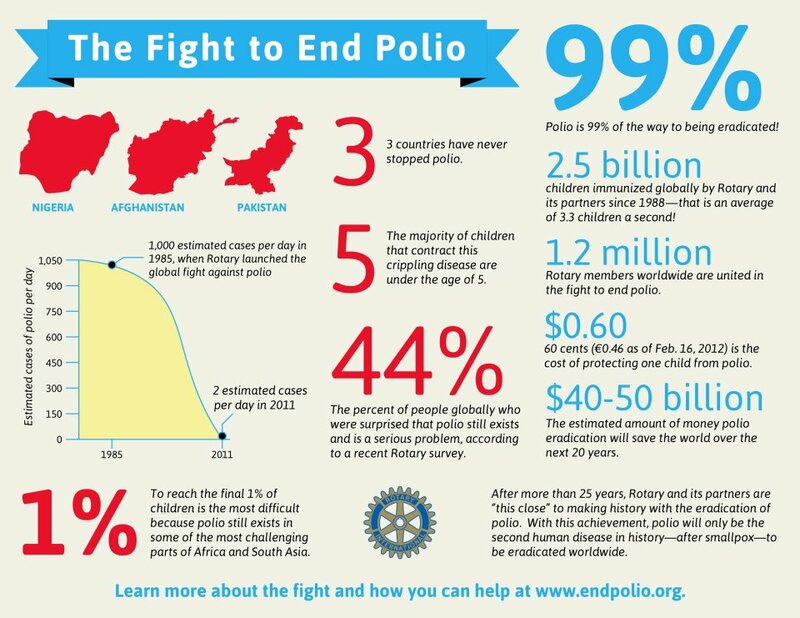 Help Rotary eradicate polio worldwide. - Wear purple to show your support. - Your contribution will save children. Mark Goodwin & Simon Hudson join Rotary. 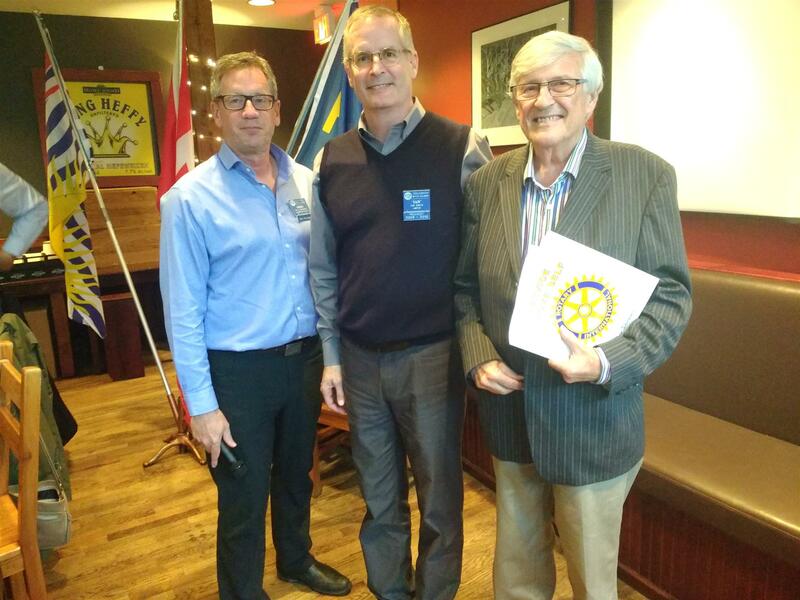 On October 23rd, 2014 Mark Goodwin and Simon Hudson joined the Rotary Club of Squamish. They were inducted by District Governor Ken Wilson. Mark is sponsored by Bianca Peters. President Brian Finley, Mark Goodwin, Simon Hudson, Bianca Peters, Ken Wilson. For more pictures of the Beef BBQ 2014, scroll down to the photo album list on the left side of this page. 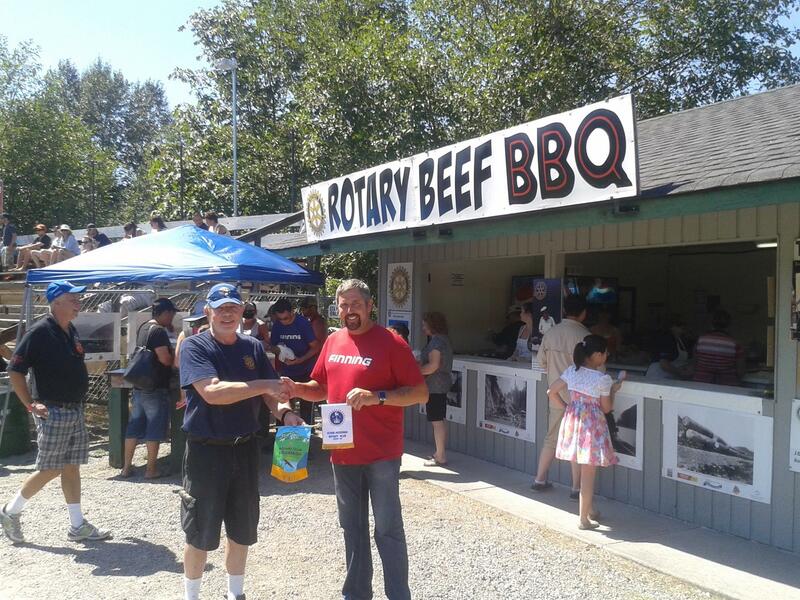 The Rotary Club of Squamish once again put on the Rotary Beef BBQ at Squamish Days Loggers Sports on Aug 3-4 2014. 1500 lbs of Canadian Prime Beef were roasted over an alder fire and served in sandwiches to the hungry crowd. This was the 57th annual Loggers Sports Show and the Rotary Club has been there from the beginning. One of the competitors, Jens Johansen from the Rotary Club of Store-Heddinge Denmark, exchanges banners with President Brian Finley. 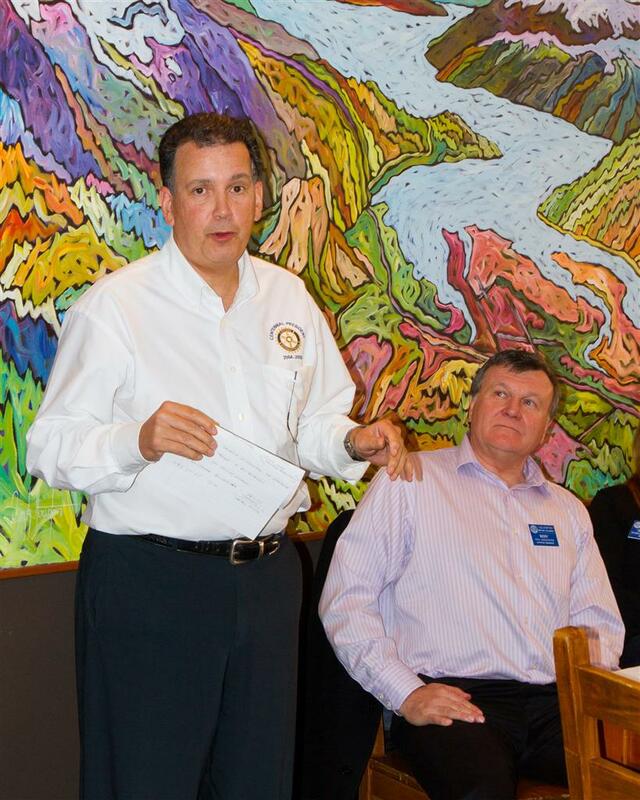 On April 17, 2014, Patrick Sweeney became the newest member of the Rotary Club of Squamish. He was proposed by President Mike Nasu and inducted by Past-President Greg Gardner. Patrick is a pilot with Air Canada, but so far hasn't offered any free rides! 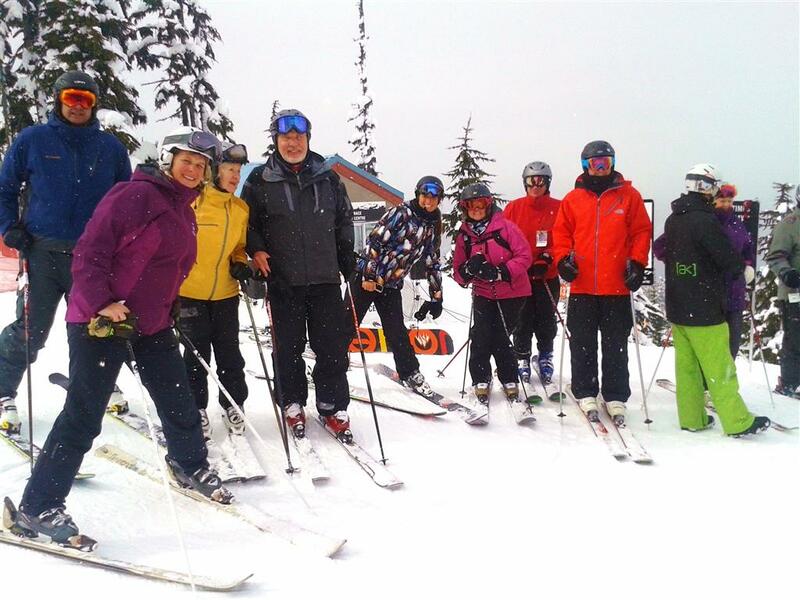 The Rotary Club of Whistler hosted a club social Squamish, Whistler, and Pemberton Rotarians to a "Ski Day" up Whistler on March 4, 2014. It began with a early load for a Fresh Tracks breakfast up Whistler Mountain, out for some fresh corderoy skiing, over to Blackcomb Race Centre, for the club challenge. Apres Ski and awards were presented at Black's Pub where our team recieved Bronze status for our team race challenge despite not having our "A" team. We look forward to next year when we can attempt to win back the Golden Boot award. 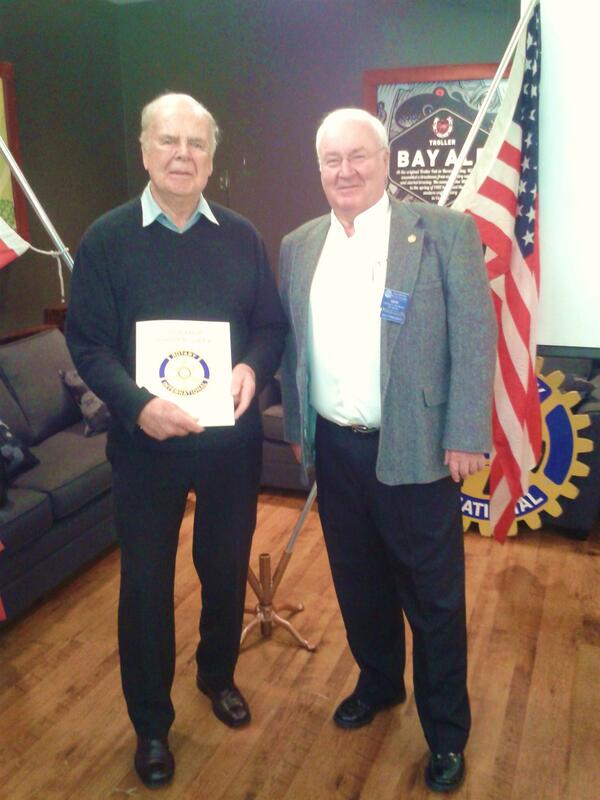 On 28 November 2013, John Bywater was inducted by Don Patrick into the Rotary Club of Squamish. John is originally from Australia and we all welcome him and his family to Squamish. 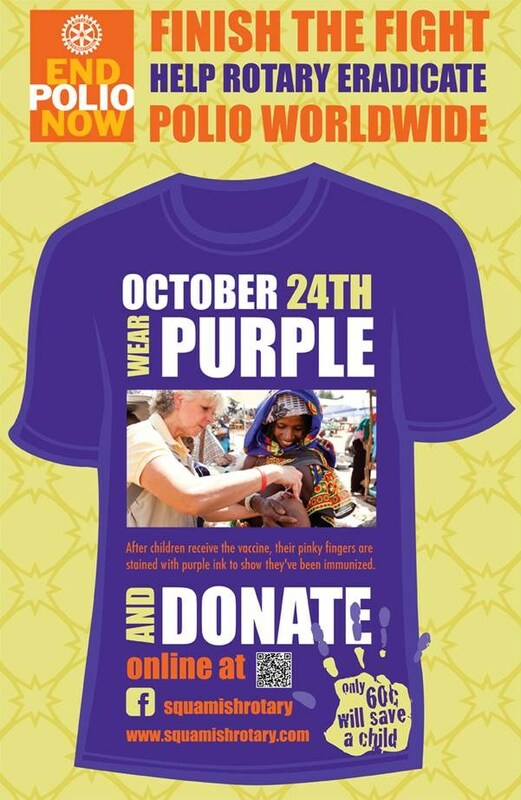 Squamish celebrated its first Purple Polio Day October 24, 2013, which also marks World Polio Day. 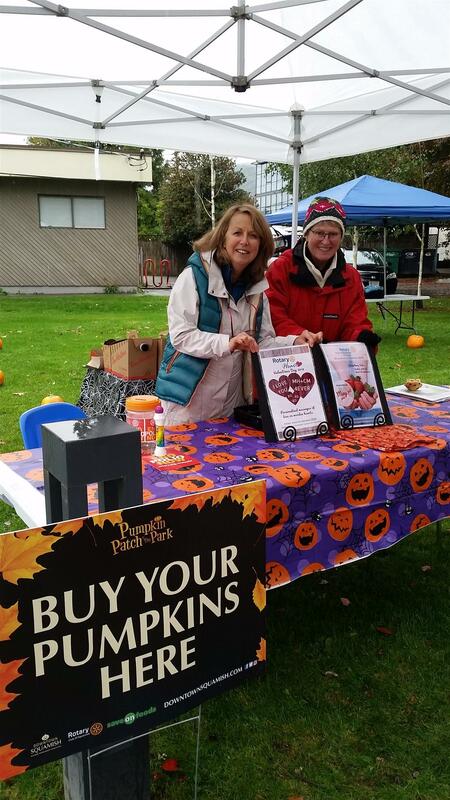 Many local businesses as well as elementary schools and the Montessori preschool participated by wearing purple and collecting coins. The District of Squamish held a Wear Purple Day and donated $5. 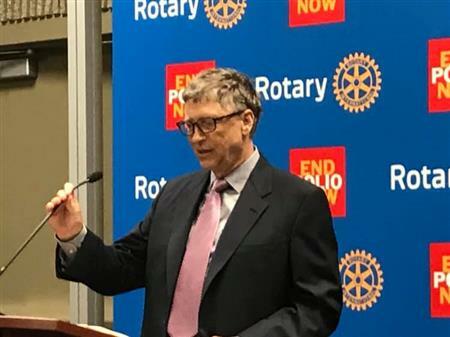 Squamish Rotary accomplished our goal of raising awareness about this devastating disease as well as raising funds towards Polio Eradication. 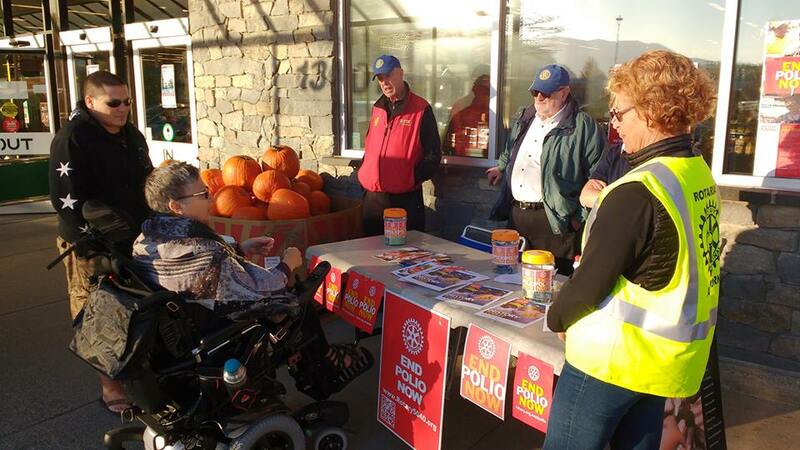 Pictured are President Mike and Rotarians Ann and Carl raising awareness and collecting donations outside Squamish SaveOn Foods. 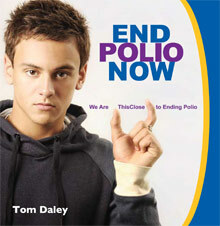 To donate, go to www.endpolio.org, scroll down and click on the donate button. A fun filled day centring around Rose Park (opposite the Adventure Centre). 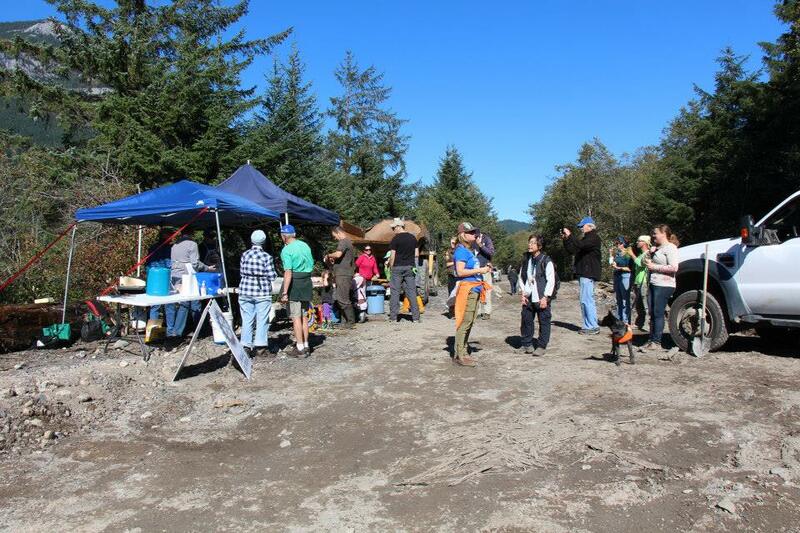 The day included native trees and shrub planting along the Loggers Lane Trail riparian zone; weed pulls in Rose Park; Interpretive Signage unveiling in Squamish Estuary; Welcome ceremony by Squamish Nation; and a lunch time barbecue by the Rotary Club in Rose Park. Events ran from 10:00 - 3:00 at Rose Park. Squamish Rotarians at the District Conference 2013 in Quesnel. 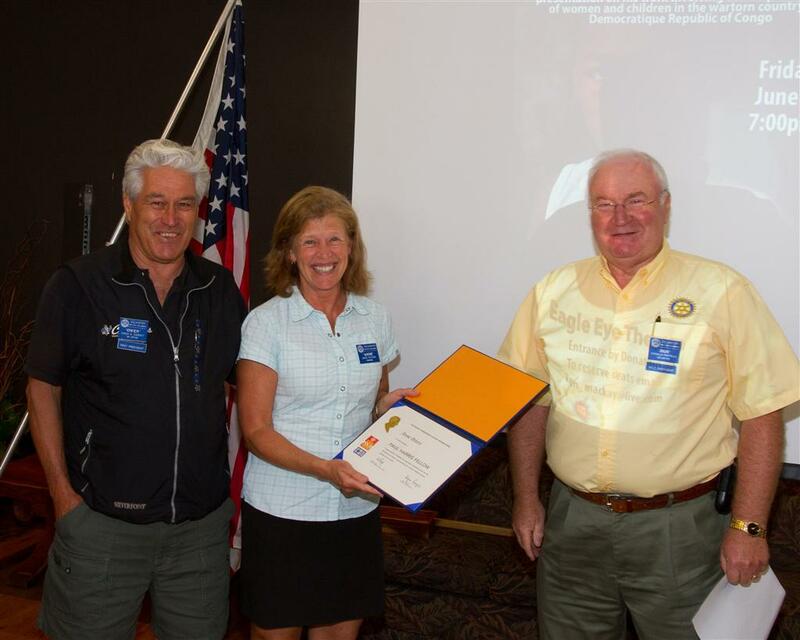 All four Rotary clubs of the Sea to Sky Corridor were awarded with Presidential Citations at the District Conference. Congratulations to all of our club members for demonstrating excellence. Come out and give Rose a hand to weed and tidy up the Rotary Garden at the Railway Park - no experience necessary. Bring your gloves, pruning secateurs, rake, and weeders. Come out for 1 or 2 hours - Rose promises that the sun will shine! Squamish Rotarians Capture the "Golden Ski-Boot"
Squamish Rotarians won the Golden Ski-Boot trophy at the Rotary Club of Whistler's annual ski day on March 13th. The four Sea-to-Sky clubs participated in the Rotary Club Challenge Race on the GMC course. Our top four skiers - Michael Hutchison, Ian Davis, Greg Gardner, and Glen McEachran, recorded the best combined times to come out on top. Squamish Rotary has partnered with Rotary clubs across North American on this $175,000 project in a remote area of Northwest Guatemala. Proceeds from tournament go to: The Pemberton District Chamber of Commerce, Quilts for Africa project in Lesotho, Africa and ongoing local Rotary projects. 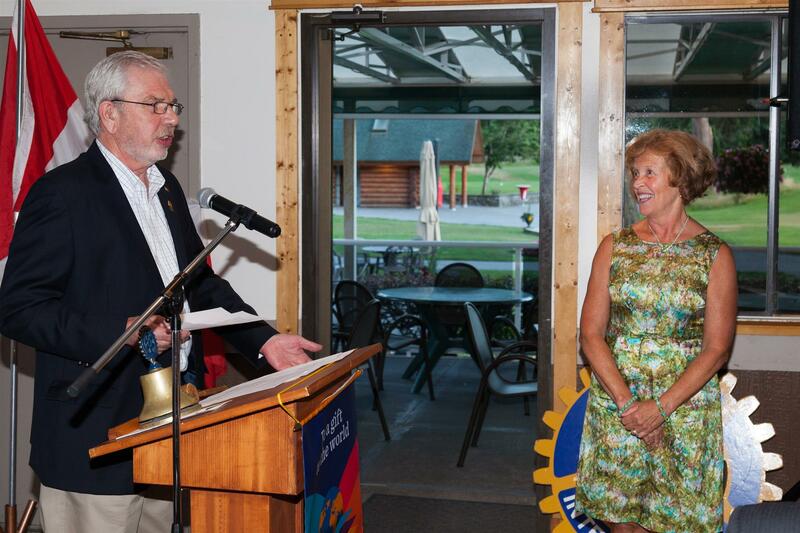 This fund was established by the late Linda Carney, the first female president of Squamish Rotary. She envisioned a fund to provide financial help to the citizens of Squamish for medical costs not covered by other sources such as Pharmacare, MSP, etc. 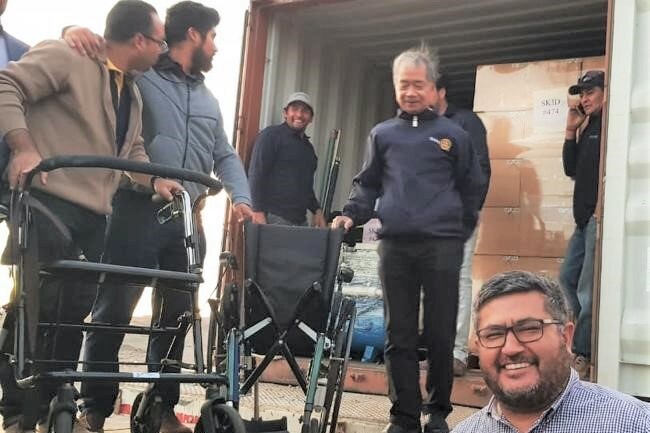 Since its inception, we have been able to purchase motorized wheelchairs, hydraulic lifts, drugs, and other medical supplies, as well as provide funding for renovations of homes to allow easier access. Over the past 12 years, Rotary, with your help, has raised and distributed well over $225,000 from this fund to our community. This is money that is raised in Squamish and money that stays in Squamish to help our own citizens who have run into medical issues that require further financial aid. The Linda Carney Rotary Cares Celebrity Challenge is our major fundraising event and we greatly appreciate your assistance in making the 2011 Challenge a success. The Jr. Olympic Archery Program is a non-profit society providing a program for Squamish youth to train and compete. The program teaches life skills such as discipline, leadership, etiquette and respect. 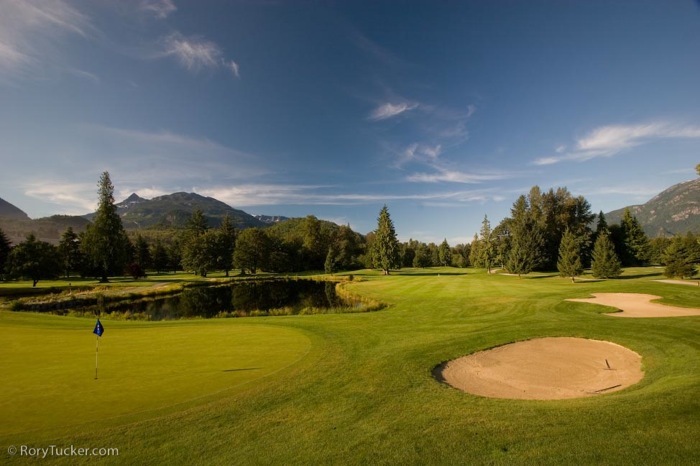 The Squamish club has had many successes at the provincial level. Gaming funds will be used to purchase archery targets and materials that are required for the archery program. The beautiful mountain setting at Quest University showcased our town and perhaps a student or two will even return here in the future to pursue their studies. Thanks to Michael Kanka and his wife Monika, for participating in the airport simulation, there to greet our outbound student Casey from Prince Rupert. Unfortunately, Casey's plane was delayed (actually, he was off having dinner somewhere, unbeknownst to all of us! ), and also to those who baked goodies for us. The baking was a definite highlight! Thanks also to Sheri Davis who coordinated this event for the District. At our May 5th meeting, representatives from service groups in our community attended and received cheques from Rotary that had been applied for on their behalf to the Gaming Commission. Pictured is President Pat with Nancy Hamilton, Board Member of the Helping Hands Society receiving a donation of $1000 to be used for the Feeding the Hungry program. The Feeding the Hungry program revolves around food security at the local leve. Volunteers pick up from a variety of food donors, sort and re-distribute, and then deliver to agencies and groups or individuals in need. 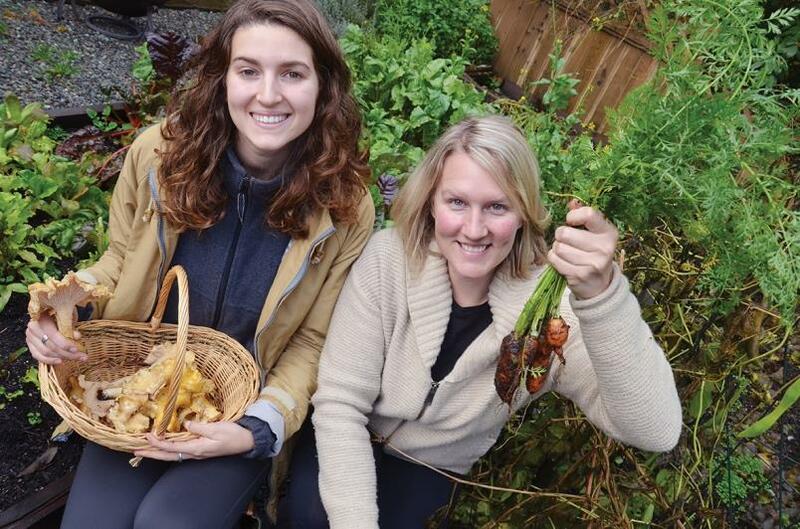 Grocers, cafes, and growers large and small are participating because they want to be socially responsible while at the same time reducing their waste. Many recipients live on or below the poverty line and cannot do without this service. The final event of this term for the Rotary Foundation of Canada...which for you to remember that 100% of the funds received by our charity do get to the inteded source... after three years. 50% to District 5040 and 50% to Global funds... a true International Charity and it belongs to Rotarians. This event will be hosted by Judy McQuinn and will take place at the McQuinn Manor located at 40257 Kaloden in the Garibaldi Estates area of Squamish. 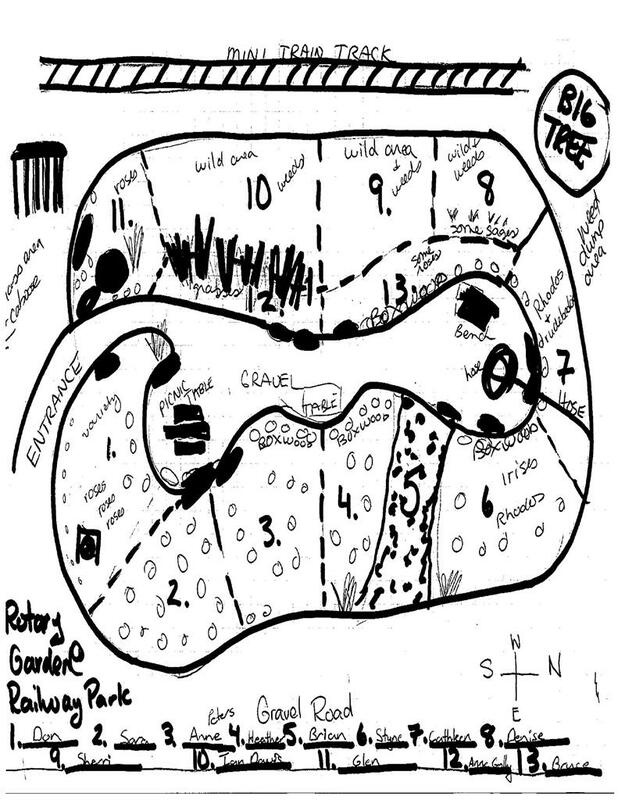 The plan is for the guests to arrive at the Manor at 10 AM on the Sunday morning of June 12th to paretake in a guided tour over to the Golf Club and down the Mamquam Dyke, west to the power line, turning right or North passing our Rotary Community Garden, and back along Diamond Head Road to the Manor. Brunch will be served around 11 AM on our arrival. The cost is $25/person and the cheque should be made out to the "Rotary Foundation (Canada)" and uou will receive credits towards your Paul Harris award leve. Thank you for your participation... we have ten participants at present... let's make President Pat proud. 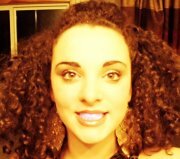 Martina from Sicily, Italy is our next Inbound student. She will be arriving sometime in August and we are looking for host families for about 2 1/2 months each. Please see Judy McQuinn for more information. This year's Rotary Installation, introducing Ron Anderson as our new President effective July 1st, and his Executive, will be held Friday June 24th at the West Coast Railway Heritage Park in the Roundhouse. More details to follow. "In" Event a Roaring Success! The "In" event, a fundraiser held April 30th at the West Coast Railway Roundhouse, to help build a new lab at Squamish General Hospital and keep Chemo "In" the Corridor, was a roaring success. Approximately $175,000 was raised in this one evening. 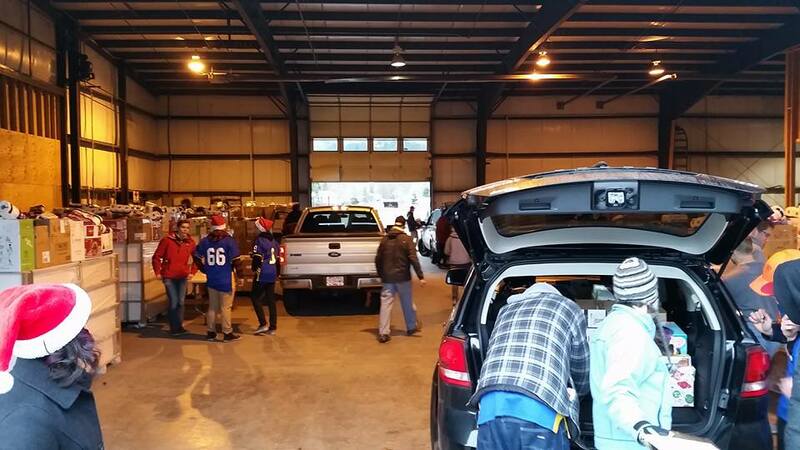 The outpouring of generosity was amazing! In the last couple of weeks I shared some unforgettable moments with my host family. I spend Easter at the McEachran´s house and we did the traditional Easter-Egg-Hunt. Let me tell you that I had a great time searching little plastic eggs filled with yummy chocolate and enjoyed being a part of their family. My host mom Toni took me at least once a week horseback riding and I loved helping her out at her barn. Sara and I sang in the United Church Choir over two month, practicing wonderful songs for the Easter Cantata, which turned out to be a great experience for both of us. Thanks to Vicky Haberl who invited us to join the choir. Currently I am mountain biking every Friday with my mountain bike club and trying to prepare myself physically for the “Linda Carney Rotary Care Challenge”, which I am participating. Also I just moved to my last host family. Now I am living with my lovely host mom Denise Imbeau and her family. They made my move really easy and I feel very comfortable here, ready to spend my last three month in Canada. I want to tell you somecing about all my wonderful familys. I could speak of things I did or link i visit, but I like to tell you what I learned in each of them for the moment. In my first family (Pat & Gary Taylor) learned to be more idependiente for be my first family and feel for the first time away from my mother, also learned about hard work and effort especially with Pat, for work for all people and her family so hard . In my second family (Denise & Dean Imbeau) learned to trust in oneself, to be happy with yourself and a beautiful example of mother what someday I will use on my own family, my third family (Sheri & Ian Davis) learned what you have to work for others, no just for you, think about who comes after, and you can always help no matter how small is, the fourth family (Vicki & Kevin Haberl) learned that little by little every day can accomplish great things, always the little things are what make the Pretty of the life and you have to look at them all always. Of my fifth family (Kelly & John Heilig) i can´t say anything for now because I can only spend a few days but I'm sure they are wonderful. 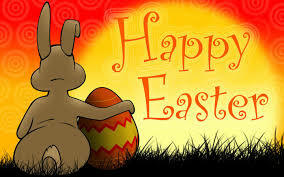 Thanks to all for be a wonderful person! Greetings fellow Rotarians. It was a perfect day for planting. Lots of rain, not too hot. We got it done and the park looks beautiful. I would like to thank my gardening pals who showed up on Monday and got really wet and full of mud...many thanks to Michael and Monika Kanka, and Nancy Edwards who worked cheerfully in the rain with me to get the plants into their new home. Drop by and take a stroll. Yet to do, we are putting in an electrical and a water trench, plus some tables and benches into the area. We will also be putting a Rotary sign up somewhere in the near future. Still needed????? During this first season, the plants will need some care including some watering and weeding. I am looking for volunteers who will committ to visiting the park during "their designated week" and making sure the plants aren't too thirsty etc. Let me know if you can spare some time to make sure the gardent establishes itself. I am thinking maybe two or three hours during the week you sign up for. Thank you once again to those who made it happen - Carney's for the soil, Cardinal Concrete and Coast Agg. for the equipment operator time, and the gravel, Marty Hopkins who donated a half day to truck the soil and gravel, Doug Barone our equipment operator who donated a full day of his work, Home Depot for the plant discounts, Chris Rommel who will be donating the time and equipment for the electrical and water trenches. Thanks to Brian Findley who spearheaded this project. 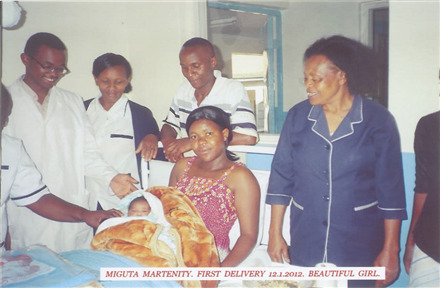 If you are a knitter (or always wanted to be) why not knit up a baby hat or ten for the Miguta Medical Centre in Kenya. Funding was recently approved for the centre and a group of Squamish Rotarians are planning a trip this fall. They would like to take some baby hats with them for the newborns at the Centre. There is a pattern available on a link on home page under "Club Links" "Baby Hats for Charity". For more information contact Liz Scott at (604) 892-4961 or email liz_scott@shaw.ca. Visit RI Convention Site at http://www.rotary.org/en/Members/Events/Convention/Pages/ridefault.aspx?housead for registration detail . On April 14th, Foundation Chair Don Patrick presented Mike Nasu, Owen Carney, and Carl Ingraham with Paul Harris Awards. Thanks for helping our Rotary Foundation to do the good works that it does, gentlemen! 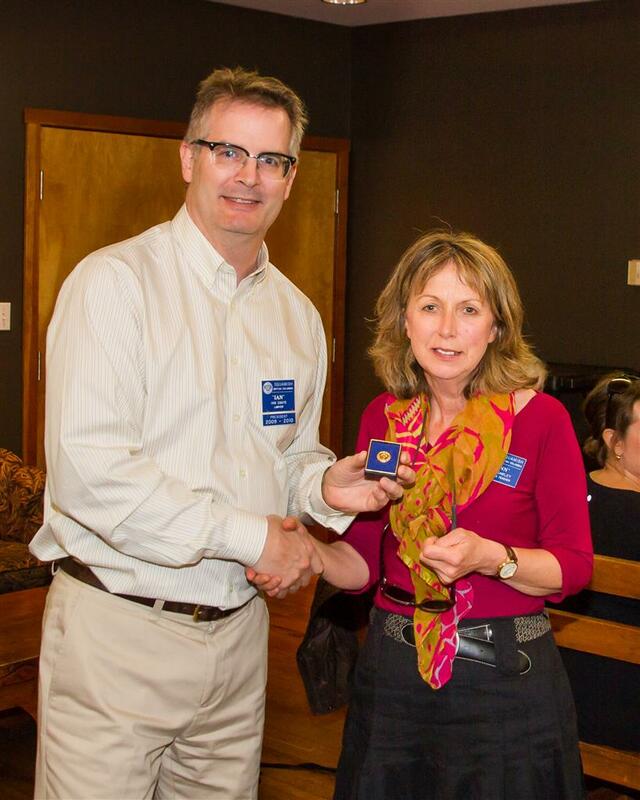 Mark Stephens, Manager of the North Shore Credit Union, Squamish Branch, was inducted into our Rotary club April 21st. Mark is looking forward to becoming an active member of our club. Welcome to Rotary, Mark! Mark is pictured here with Rotarian Dave Stewart. Squamish Rotary has applied for Provincial Gaming Grants for the past seven years. Each year we have been successful recipients of Gaming Grants of $15,000 for a total of $105,000. These funds are then distributed throughout the community as well as used by our own youth programs. Over these years we have used $7,000 towards sending five students to Rotary Adventures in Citizenship in Ottawa, $15,000 for RYLA (Rotary Youth Leadership Awards Camp), and $4,600 for Rotaract. In addition, over these seven years, we have helped to send underprivileged children to Evans Lake Forestry Camp ($2,700), supported the local Community Garden at Mamquam Road and Hwy 99 ($2,000), beautified the gardens at Hilltop House ($4,000), supported the Squamish Food Bank ($5,800), the Squamish Helping Hands Society ($7,100), Big Brothers/Big Sisters Teen Mentoring Program ($7,500), Squamish Archery Junior Olympic Program ($3,800), Dogwood House - Mental Health Camp ($2,000), Callaghan Winter Sports - Biathlon Bears Kids Program ($4,000), and the Squamish Breakfast Program - over $21,000!!! We acknowledge the financial support of the Province of British Columbia. Without the Provincial Gaming Grant funds, this would have been much more difficult to achieve. 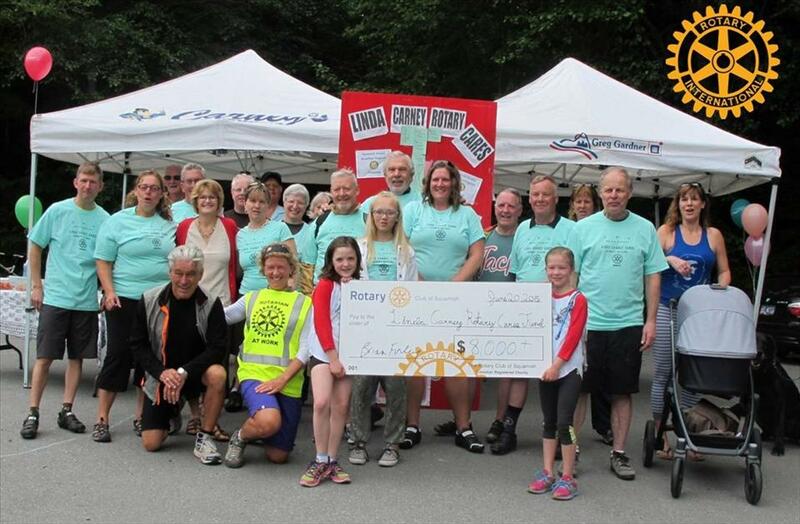 The Rotary Club of Squamish was the recipient of Gaming Funds in the amount of $15,000 which was distributed to local community groups at their meeting on August 1, 2013. The balance of the funds ($4,000) will be used for Rotary Youth Programs including RYLA (Rotary Youth Leadership Award Camps) and Adventures in Citizenship, a four day trip to Ottawa with over 200 other high school students designed to develop their potential as leaders in their communities and in Canadian society). Well, it's all over for a another year and another successful Rotary BBQ. Once again, the SOLD OUT sign went up at about 4pm on Sunday afternoon. · 170 lbs of onions!! The new Brioche buns and the fried onions were a real hit. What can we say except this is what Rotary is all about - a great team effort by a great Rotary club and a great big THANK YOU to everyone who made this all happen. Also a thank you to David Vandenborn and his team at Save-on-Foods for all their help and support. p.s. from BF - it's about 4pm on Sunday, the fire is out, and I finally managed to grab a beef-on-the-bun - I think it was the last one. Boy was it good. 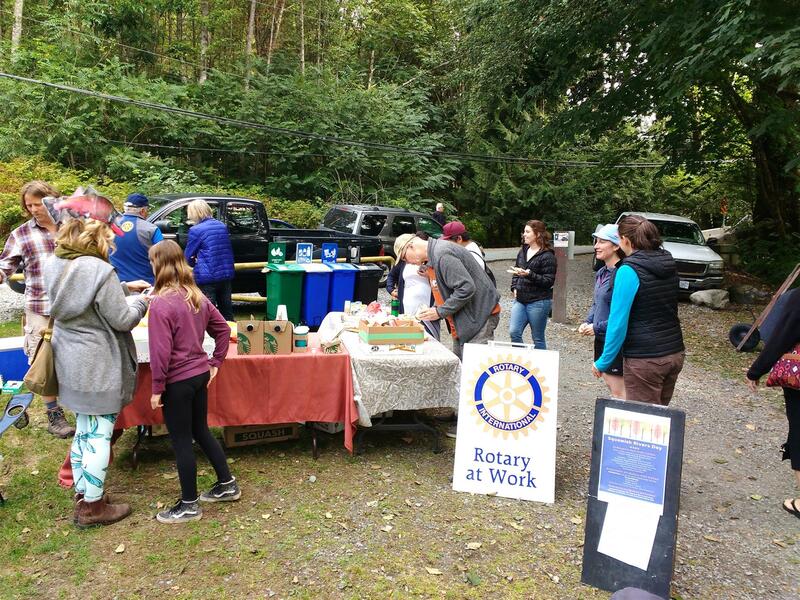 The Rotary Club needs some extra hands to help serve thousands of Squamish’s famous sandwiches. Created by forestry pioneer John Drenka 56 years ago, Squamish Rotary’s Beef-On-A-Bun is as much a part of Squamish Days Logger’s Sports as lumberjacks and chainsaws. At last year’s two-day event, 32 volunteers aided in slow roasting 1,500 pounds of Alberta meat at the Rotary Shack at the Al McIntosh Fields – equalling approximately 3,000 beef buns. The meat is placed on giant rotisseries at 7 a.m., with volunteers cooking two batches of roughly 32 beef roasts each day. Money raised from the event is donated to the community’s many charities. The Rotary Club is looking for volunteers to help out on the August long weekend. People are required for Saturday, Aug. 3, and Sunday, Aug. 4, between 10 a.m. and 4 p.m.
Those interested can email blfin@shaw.ca. 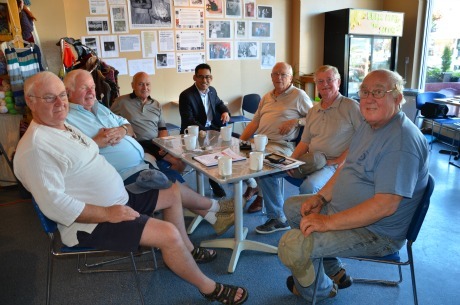 Mike Nasu (centre) and other Rotary Club members, Don Patrick, Stein Hoff, Doug Boyd, Bent Mortensen, Ed Scott and Jim Mulholland, at Newport Market. Left to right: Sponsor, President Denise Imbeau, new members Inis LeBlanc & Jonathan Silcock, sponsor, PR Bianca Arnold-Peters, new member Melanie Koenderman, and Jonathan's sponsor Heather Dunham. 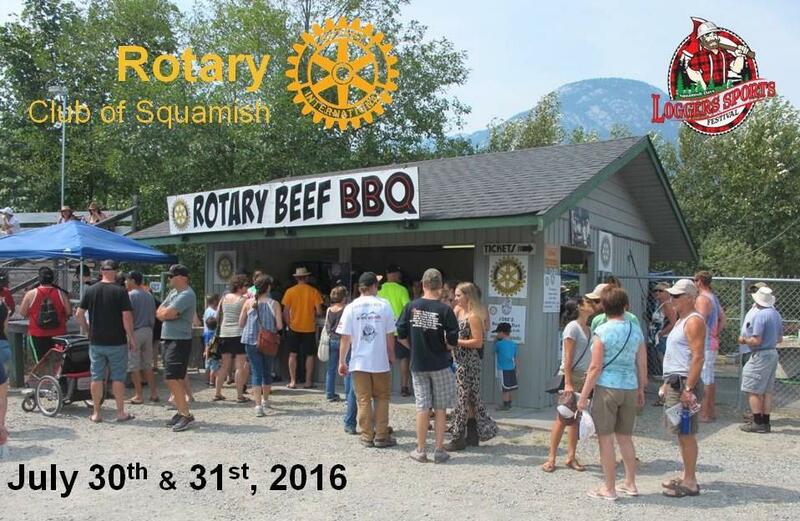 Welcome to Squamish Rotary! 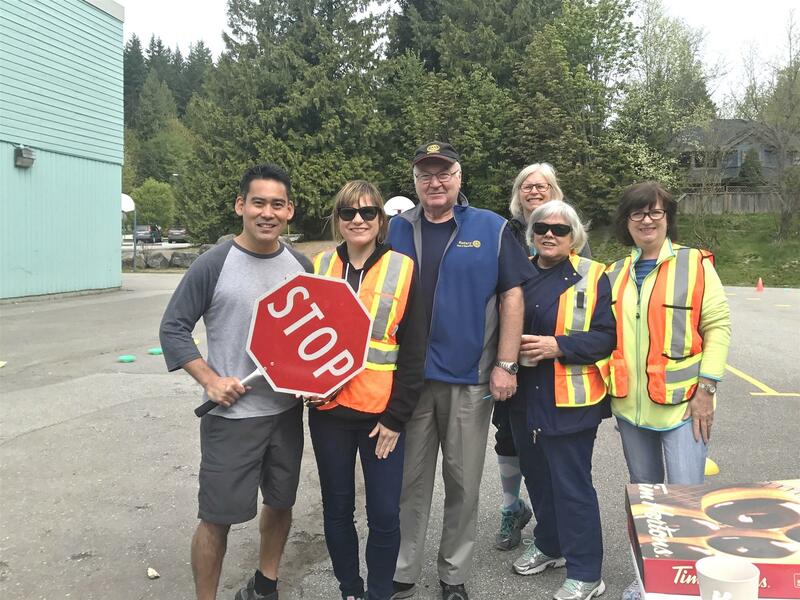 The Rotary Club of Squamish held their annual Bike Safety Rodeo at Garibaldi Highlands Elementary School on Tuesday May 14th. Pictured, In-coming President Mike Nasu does the figure 8. To see more photos of the Bike Safety Rodeo, visit www.facebook.com/squamishrotary . 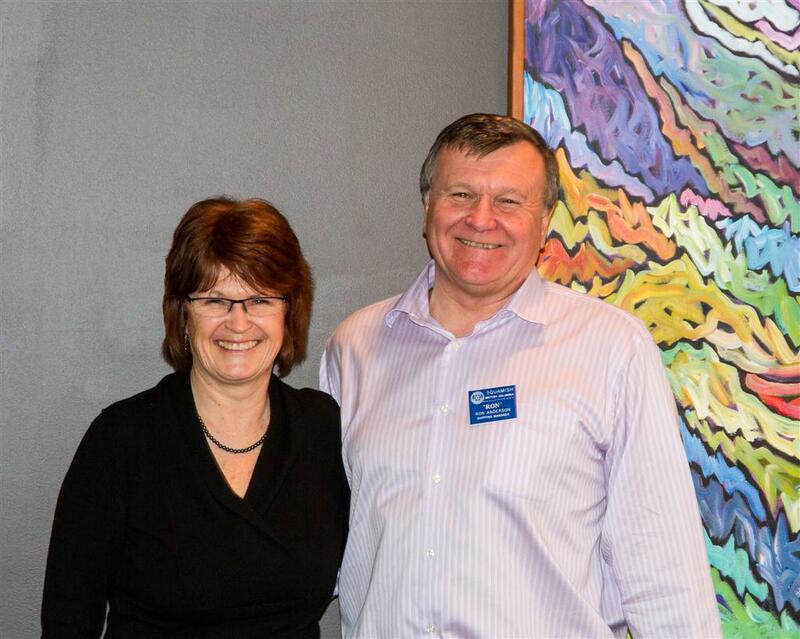 Denise Imbeau and guest Rotarian John Doherty (Rotary San Miguel de Allende-Midday, Mexico) at membership lunch, Thursday, May 9th . 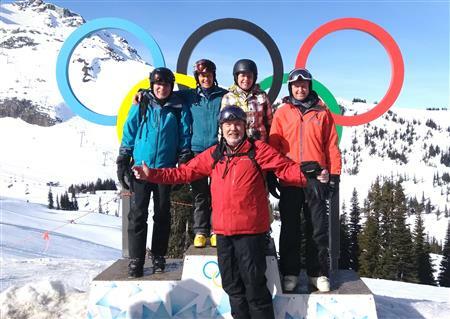 Squamish Rotary skiers relinquish the Golden Boot. 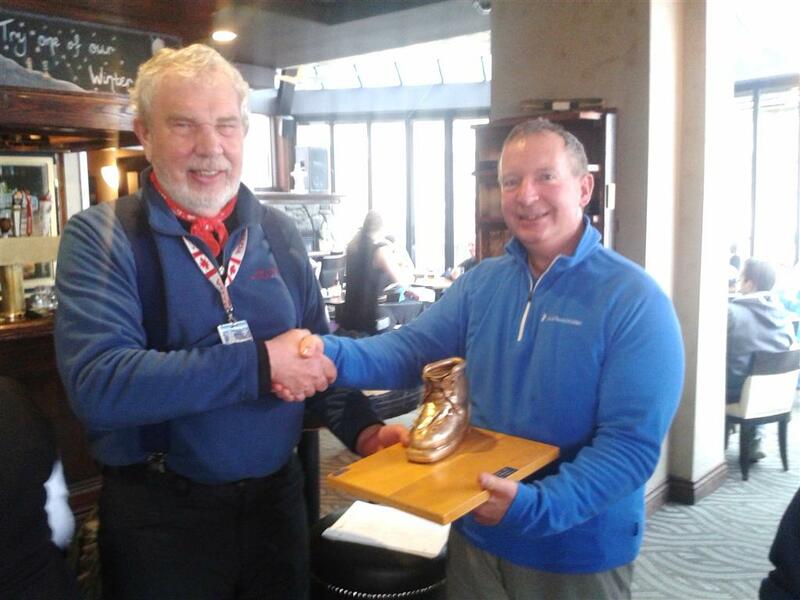 On Tuesday, 5 March 2013, at the GMC Race Centre on WhistlerBlackcomb, the Rotary Club of Whistler captured the Golden Boot trophy from Squamish Rotary. Whistler's top four skiers pipped our skiers by over 4 seconds. The Pemberton Club came 3rd. Chris Rommel (Squamish) won the fastest male; Marg Pallot (Whistler) was the fastest female; Gord Leidal (Whistler) was the most stylish racer; Pat Taylor and Owen Carney from Squamish got the prizes for the best ski sweaters. It was a great day and enjoyed by all. Thanks to the Whistler Club for organizing the event. The photo has 10 of the 11 Squamish skiers. Can you name them all? Who's missing? 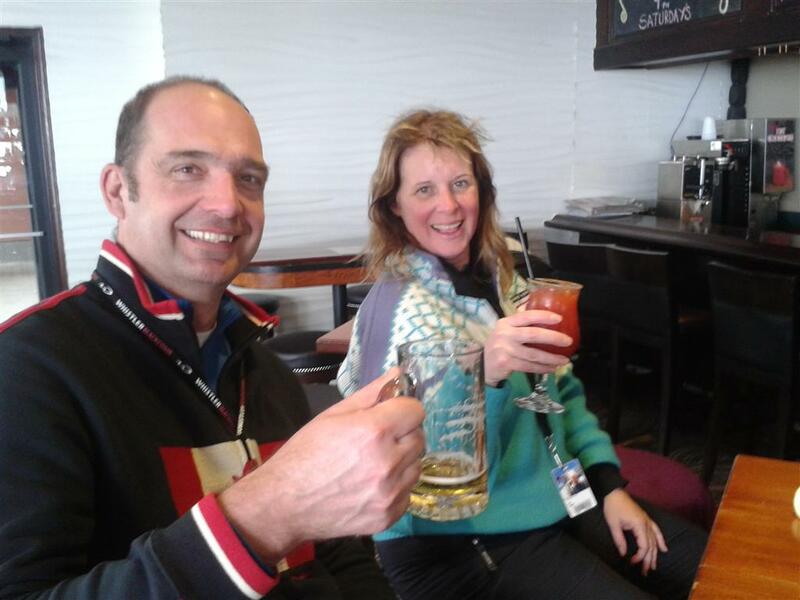 Chris and Pat enjoying some apres-ski..
Handing over the Golden Boot trophy to Jim Miller of the Whistler Club. 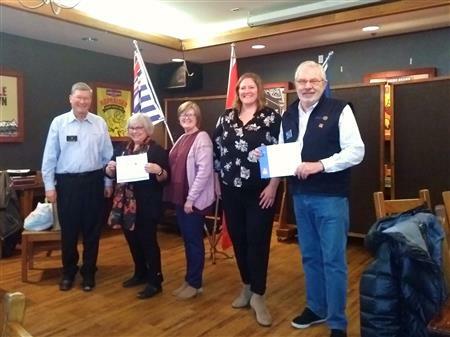 On Thursday, April 11, Rotary Club of Squamish President Denise Imbeau presented the Certificate of Organization to Squamish Rotaract's Michelle Grondin. The Rotaract of Squamish's birthday is 11 Febraury 2013 and they meet weekly at Quest University Canada. Congratulations!!!! The 100 Years Celebration Events Team is pleased to update the plans for the 100 Years of Rotary in BC Celebration, planned for April 2013. Events are now open for booking - plan to participate in the greatest show of Rotary that our area has ever seen. Theme for the week - Leadership Through Service. Community Celebration Event, 5:30PM to 10:00PM at Jack Poole Plaza, Vancouver Convention & Exhibition Centre. 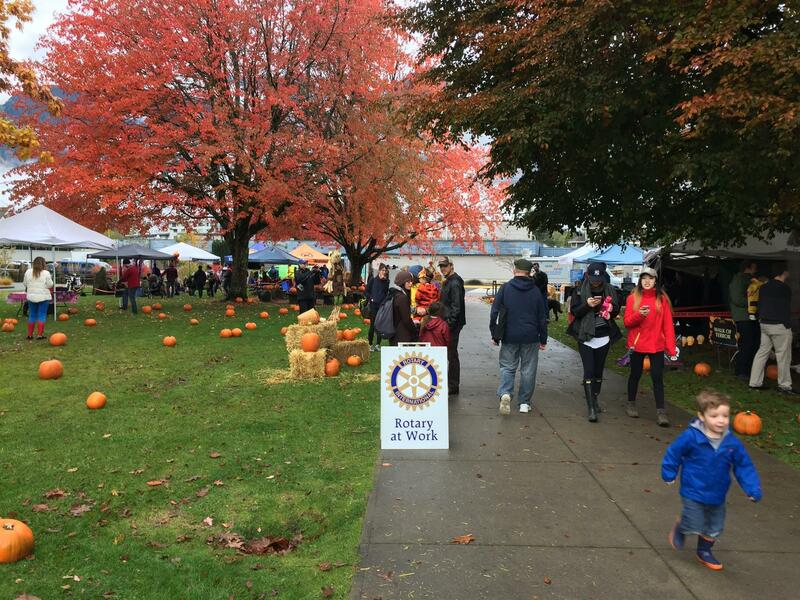 This free event will celebrate Rotary and is open to everyone, the Olympic Cauldron will be lit, there will be family fun, food and great live entertainment, including the Langley Ukulele Ensemble and a feature performance by Abra Cadabra. A special VIP reception will raise funds for the Rotary Foundation. Rotary Showcase, 12:00 PM to 4:00PM at Vancouver Convention and Exhibition Centre. Open to all Rotary Clubs in British Columbia to showcase their projects and the good work of Rotary. All Rotarians, guests and public welcome. Free admission. Rotary Showcase, 12:00 PM to 4:00PM at Vancouver Convention and Exhibition Centre. Open to all Rotary Clubs in British Columbia to showcase their projects and the good work of Rotary. All Rotarians, guests and public welcome. Free admission. 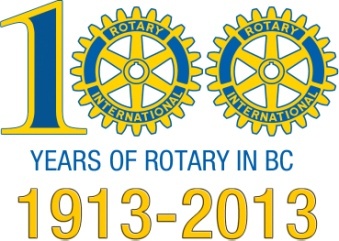 100 Years of Rotary Gala, 6:00PM to Midnight, Ballrooms at the Vancouver Convention & Exhibition Centre. Sumptuous four course dinner with an address by former BC Lieutenant Governor, His Honour, the Honorable Stephen Point followed by keynote speaker, celebrated humanitarian Stephen Lewis. Great live entertainment by Circle of Friends. 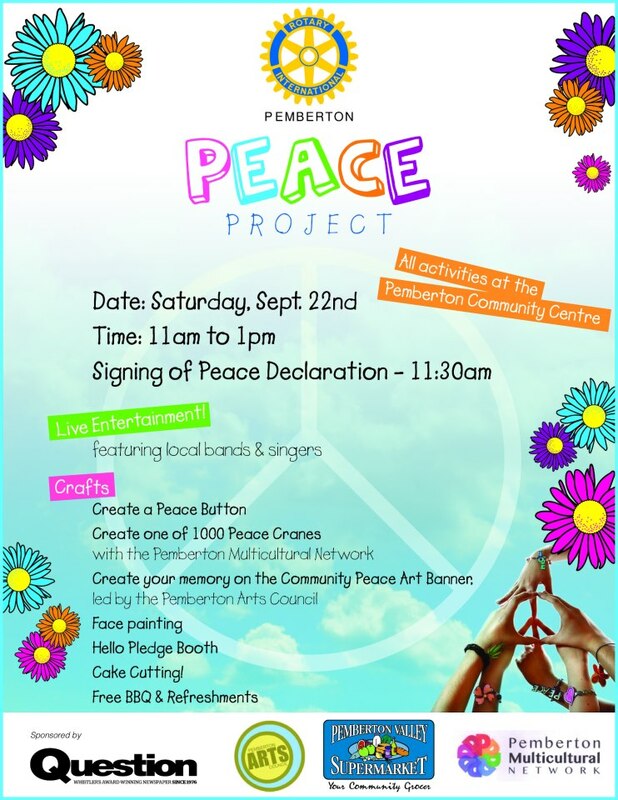 Please join the Rotary Club of Pemberton for the signing of our Rotary Peace Community Declaration on Sat Sept 22 from 11am - 1pm. Fun for the whole family, free cake, food & refreshments as well as crafts and live entertainment! 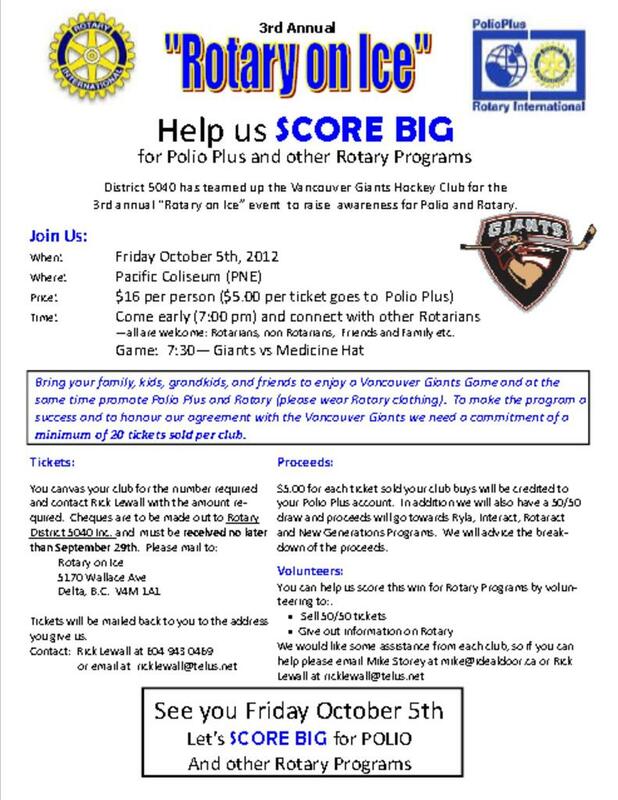 Here’s your chance to help Rotary SCORE BIG with the Vancouver Giants to raise funds for Polio Plus and Rotary Youth programs . Join Rotary Clubs from around the province by attending “The 3rd Annual Rotary On Ice”, Friday October 5 at the Pacific Coliseum. A minimum of 20 tickets must be sold per club. Tickets are $16 each with $5 of it going directly to Polio Plus. 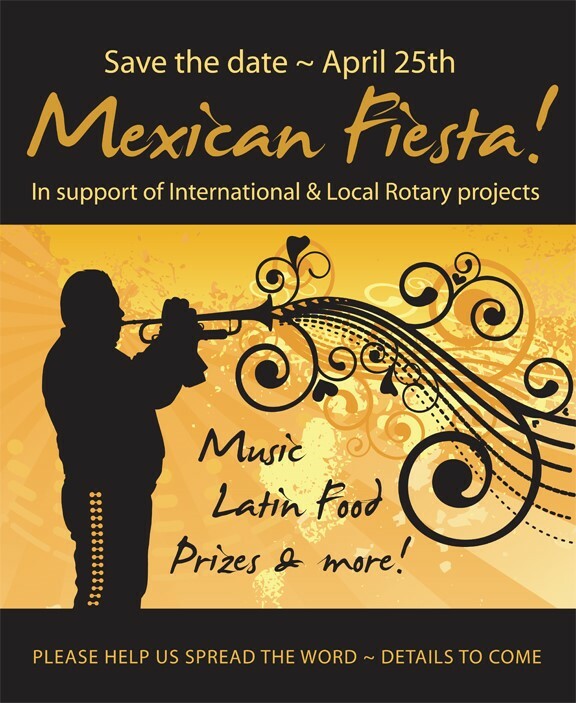 Contact Rick Lewall, PP Rotary Club of Tsawwassen, at 604-943-0469 or ricklewall@telus.net for tickets. Vancouver, BC : The Rotary Club of Vancouver and the 100 Years Celebration Events Team is honoured to have as our keynote speaker at the Gala Dinner, celebrated humanitarian Stephen Lewis. 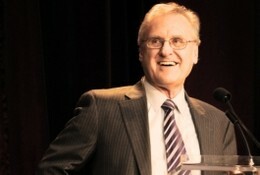 Stephen Lewis is the board chair of the Stephen Lewis Foundation. 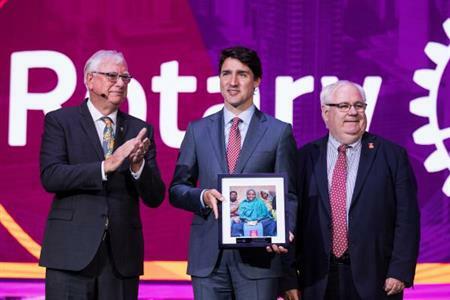 He is a Distinguished Visiting Professor at Ryerson University in Toronto, and he is co-founder and co-director of AIDS-Free World in the United States. His work with the United Nations spanned more than two decades. He was the UN Secretary-General’s Special Envoy for HIV/AIDS in Africa from June 2001 until the end of 2006. From 1995 to 1999, Mr. Lewis was Deputy Executive Director of UNICEF at the organization’s global headquarters in New York. From 1984 through 1988, he was Canada’s Ambassador to the United Nations. Other events will take place the weekend of April 19th – 20th and include a free event Friday night at Jack Poole Plaza beginning with the lighting of the Olympic cauldron. There will be family fun, food and entertainment. 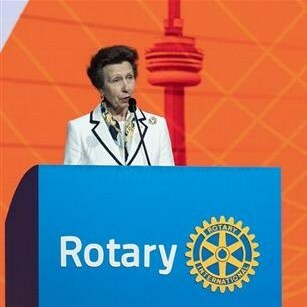 Saturday afternoon is an open house at the Vancouver Convention Centre showcasing projects from Rotaries across British Columbia followed by the Gala Dinner on Saturday evening. Gala Dinner tickets are now on sale with pricing of $175 per seat or $1,750 table of ten. Book a table for your club or group now at www.rotaryvancouver.org/Gala or by phone to Jessica at 604-783-1487. February 25, 2013: Squamish Rotary President, Denise Imbeau, presents a cheque for $1500 to Christine Buttkus, Outreach Coordinator-Sea to Sky for the North Shore Schizophrenia Society Services for Family, Friends and Communities. Also included in the photo are Mental Health Partners: Rob Smith, Child & Youth Mental Health; Marilyn Caldwell, School District 48; and Christine Baker, Squamish Nation. All of these organizations are part of the Suicide Awareness and Prevention Working Group. At the Feb 14th membership lunch meeting, Acting President George McKenzie presented a cheque from Squamish Rotary for $500 to Jude Goodwin of the Griffin Squadron Air Cadets towards the purchase of a drum kit. of Rotarians or students recommended by Rotarians! The program is based upon a reciprocal Family to Family exchange. 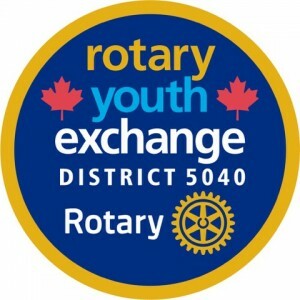 go to d5040youthexchange.ca and follow the links to short term youth exchange programs. or phone 604 898 4490 for further information. 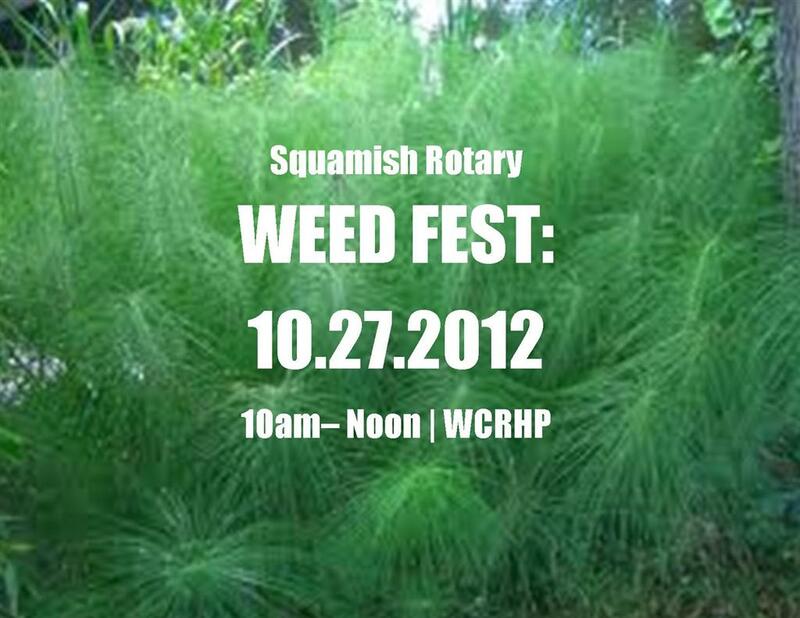 Join the Weed-Fest on Saturday, Oct. 27 from 10 - noon at the Railway Park. We will be weeding, whacking, trimming and planting bulbs and other things to see a nicer garden next spring. No gardening experience necessary. The fun time will be followed by an Oktoberfest style bratwurst, potato salad etc. lunch at our place. If you have some plants to bring (daffodil bulbs, and anything else that is deer proof, drought tolerant (grasses, cactus), and not a bear attractant, please do.) Now is a great time to split your perennials, (grasses, rockery plants, daisies etc.). We also need some ground cover like junipers, pines etc. Wear your gardening boots, bring a shovel, pruners, weed carrying bucket, gloves, and a good sense of humour. We will be going rain or shine. With an army of ten or fifteen we can easily get it done in a couple of hours. Spouses, dates, children and anyone else you can talk into this, will be welcome. If anybody has a good high powered weed-whacker, that would be useful. Please rsvp to me at rosefast@telus.net or 604-849-1802. There will be some gardening prizes awarded at the lunch compliments of me. You can now pre-order your tickets for the Grey Cup party on Sunday November 25th. It is the 100th Grey Cup and also the 100th year of Rotary in BC. Tickets are $100 each with $50 going to purchase the X-Ray unit at the new Dental Operatory at Hilltop House, a campaign spearheaded by Dr. Laurie Vanzella. The event is at the Squamish Golf Club, 1:30-7:30 pm. Your ticket will include drinks tickets, halftime BBQ buffet, swag bag, program, $50 tax receipt, and lots of fun and fellowship. At least 4 large screen TVs will be set up for your viewing pleasure. By ordering now, you will be assured of tickets. · Name and address (for tax receipt). · Phone number and email address. 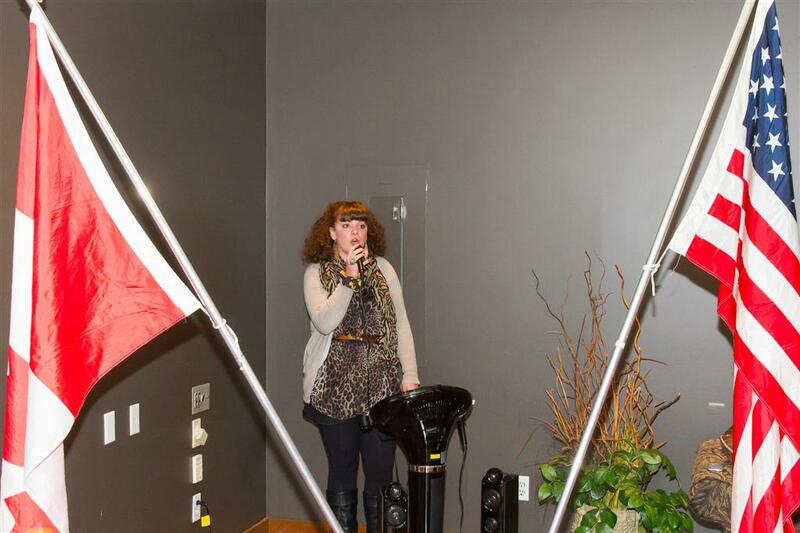 Check out the new Rotaract Club in the Sea to Sky Corridor! Rotaract International is a volunteer service organization associated with Rotary International, for youth between the ages of 18-30. 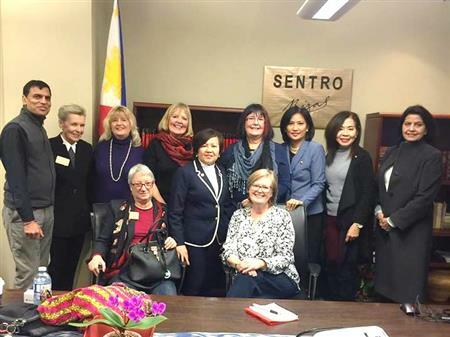 Through Rotary involvement, you can be exposed to great opportunities for international exchange, professional development, volunteering within the community, and building personal and professional connections. Rotaract can open many doors! Starting January 7th, check it out Mondays at 7pm in the Quest University Cafeteria, 3200 University Blvd. As you may already know, I'm seventeen (born on the 5th January 1995) and I'm Belgian. My parents are Belgian too, my father is from Huy (where my sponsor club is and where I go to school) and my mother is from Brussels. Because I live in the south part of Belgium, I speak French but I learned Dutch, English and Spanish at school. I live in the countryside, 20 kilometers far from the nearest city and I have a cat and a dog. I like reading, listening to music, playing games with my family and, since we came to the cabin with Sheri and Ian, Canoeing, mountain biking and fishing. My club Sponsor is RC Huy in D1630. My father is Rotarian, as was his father and his mother's father, in RC Huy. They all were at least once president and stayed many years in the executive. My father did a court term exchange in the USA with the Rotary in the beginning of the eighties. What convinced me to do a long term exchange was seeing my older sister coming back from Australia after her exchange year. During this year we hosted two girls at home from Australia and from the USA and that also showed me how great would be a year abroad with ROTARY. My family often participated to the activities organised by the RC Huy so I know many of the Rotarian in the club. Yesterday was my one month anniversary in Assis, Brazil. I have to say that it was a great feeling. I also have to say that it was a confusing one, how can one month possibly go by so fast? I still don't have the perfect answer but I do know the slogan "time flies when your having fun" may be a fitting one in this situation. This past month has been filled with so much happiness that it seems boundless. I could ramble on about why I'm happy but it's of course "boundless" and would take way too long, so in an act to preserve time I will name just a few for you. 1. The food. Oh my, the food. It is constant and delicious. Throughout the morning I eat fresh papaya, oranges, and bananas. Sometimes I sneak a few chocolates in there too. I can't help myself. Then when I get home from school at 12:30 I eat a huge lunch. It always has rice, beans, potatoes, and meat involved. Some exchange students have been complaining lately about the enormous amount of beans that they get served daily. Fortunately for me I love beans and even go for seconds. I wasn't called the bean machine for nothing. Then we snack for the rest of the day on more delicious Brazilian food. They definitely aren't starving me here. 2. The people. They are all so generous. Surprisingly very few people here speak english but that never stops them from insisting that they help you as much as humanly possible. A complete stranger on the street will go out of his/her way to lend you a guiding hand. It has happened to me before. They are also so quick to welcome and call you a friend. I've never experienced anything like this in Canada. It makes my life here 100 times easier. As well the people are incredibly laid back but also know how to have a good time. 3. The cream cheese. Yes this item of food needs it's own number. Why? Because it's that delicious. I'm making amends that -no matter the cost- I'm bringing a life time supply of this stuff back to Canada with me. 4. My host family. They are all so kind. They cater to my needs and in return I attempt to be the best host daughter/sister there ever was. They have been more then patient with my Portuguese and help me whenever I ask. My Portuguese definitely needed some patience. As I said before they are definitely not starving me and have welcomed me into their home. My host family has made this whole experience very comfortable indeed. 5. My Portuguese. I went to my friends house this weekend and everyone there was so impressed with how much I understood. Although my speaking isn't as polished as my comprehension I can still get my point across and make it through the day. Knowing that there is improvement is something that brings me oh so much joy. 6. The Exchange Students. There are five in my city including me and they are way too much fun. Although I love my Brazilian friends it is so nice to have people that understand and are in the same frame of mind as you. It would simply be against our very nature not to connect with each other. 7. My Classmates. As all Brazilians seem to be, my classmates are very welcoming. Although school isn't the most anticipated part of the day, my classmates make it worth while. 8. The weather. It is sunny and warm. Exactly as it should be. I'm only slightly worried about summer though because I asked my host parents how hot it gets and instead of explaining they just rolled their eyes to the back of their heads and slumped their shoulders. Later my host sister went on to say," You'll be outside and wish clothes didn't exist." That should be a bundle of fun. 9. My city. It is the perfect size. Not big enough to be polluted and over populated but not small enough to be boring. I explained it before as a city-town and I'm sticking with that. Although a city alongside a beautiful beach wouldn't be too bad, my city-town in the middle of Brazil is just right. 10. My life. I've been told many times in Brazil that I "say thank you too often" and honestly I can't help myself. I'm just so flippin grateful for everything and everyone. This experience is so unique and wonderful and I'm absolutely loving it so far. I know I sound like such a cheese ball but again, I honestly can't help myself. 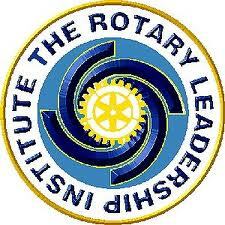 Squamish Rotary will cover the $85 fee for RLI courses offered on Sept 29 if you register prior to Sept 15. 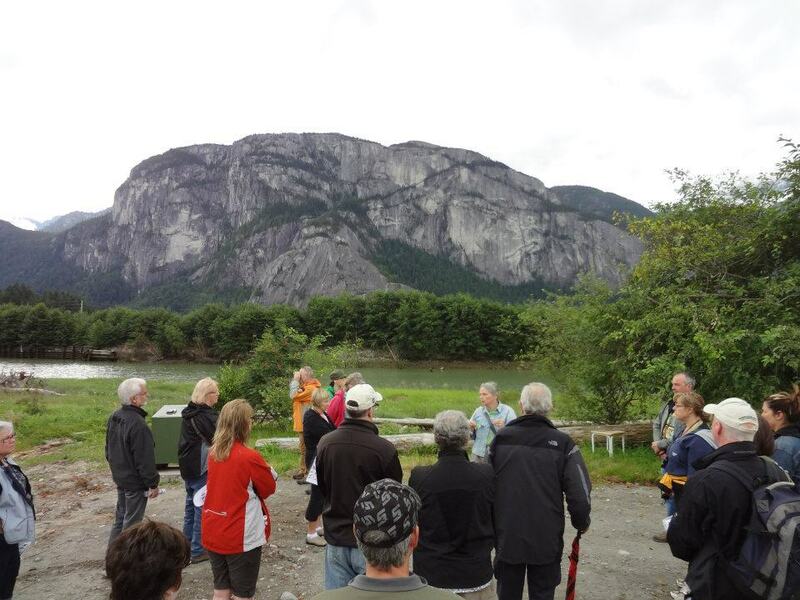 The Squamish Environment Society hosted a Rotary walking tour of the Estuary Sunday morning, July 22. SES members Correy Matheson, Meg Fellowes, Carl Halvorson and Mary Livingston provided information about the history, species and vegetation of the Estuary. 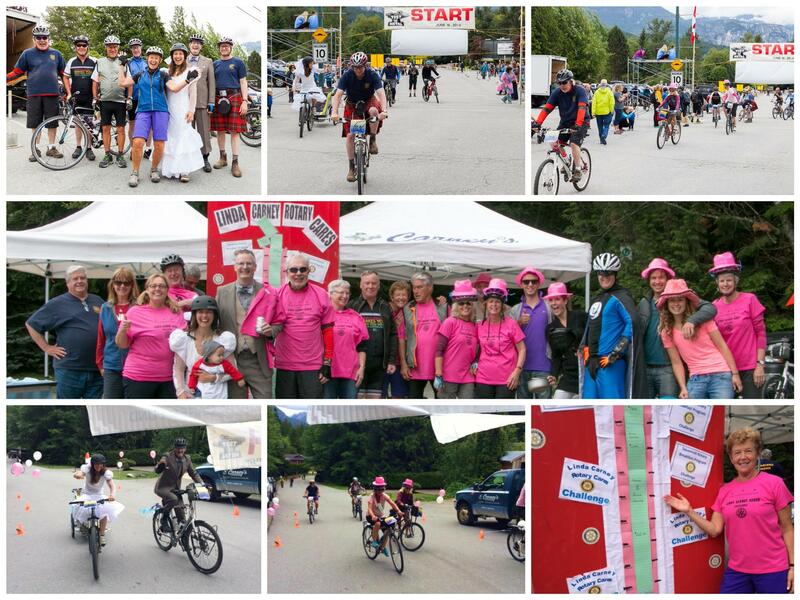 To see more photos of the event, please visit the Rotary Club of Squamish's facebook page at http://www.facebook.com/squamishrotary. MP John Weston is pictured with Mike Nasu promoting National Health and Fitness Day. Why wear a Rotary pin? 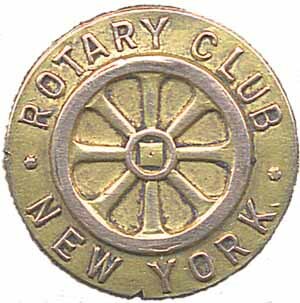 The first Rotary lapel pin was designed and made by New York Rotary Club member, John Frick on October 14, 1909 and worn by the club’s first president Bradford Bullock from 1909 until his premature death in 1911 (At the time, he was serving as VP of the National Association of Rotary Clubs). The forerunner of the traditional Rotary pin worn today, it features the Rotary wheel has it appeared in its earliest representation with eight spokes, no cogs, and no keyway. Reasons for wearing a pin are varied: for publicity of Rotary, for pride, for acceptance and recognition, for the start of easy conversation with other Rotarians wherever you go. Do you wear a Rotary pin every day? On Saturday October 20 2012 all Rotarians are invited to hear RI President Sakuji Tanaka speak at a lunch and to participate in an afternoon plenary session. This event is open to all Rotarians in all districts. A large attendance from District 5020, 5040, 5050, 5060 is expected. Only 200 tickets will be sold plus the 400 registered delegates to the Rotary Institute. Tickets are $50.00 per person if purchased before October 1 2012. After October 1st tickets will be $60.00. The lunch will be held at the Vancouver Westin Bayshore Hotel. The institute is an annual event held at various locations in Canada and the US. This is the first time since 2000 that District 5040 has hosted this national conference. More than 36 District Governors Nominee, Governors Elect and District Governors attend the institute for training. Also Past District Governors from across Canada, eastern Russia, Northwest and Northeast USA and Bermuda will take part. In addition to President Tanaka there will be members of the RI Board of Directors and Trustees of The Rotary Foundation participating in presentations and seminars. After the lunch guests with tickets for the lunch are invited to stay for the afternoon plenary session, which includes presentations by the International Agency For Prevention Of Blindness, service project highlights, South African student project, a Rotary moment, and a panel discussion by senior Rotary leaders (RI board members and trustees). Tickets are only available online, due to commitments with the hotel there will be no tickets sales at the door. One of the great events at the Zone 24-32 Institute in Vancouver will be the Walk for Polio on Friday, October 19. The 20 minute walk will be along the sea wall to Jack Poole plaza site of the 2010 Olympic cauldron. 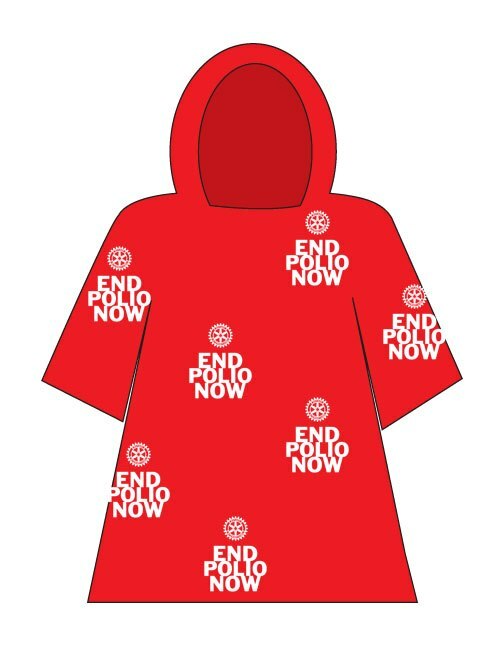 In the unlikely chance Vancouver has a rare warm dry rain that day all the walkers will get a polio poncho. We started the weekend with 1500 pounds of Alberta Grade AAA beef (114 roasts), 210 dozen buns, litres of horseradish and condiments, and the secret recipe for JD's BBQ sauce. Then was added the most important ingredient: - countless hours from 40 Squamish Rotarians, family and friends (who never stopped smiling! ), starting at 5am and ending at 6pm each day. The result: We served 2500 J-DEEZ Beef-in-a-bun to locals who have been coming for years, and visitors from as far away as Colorado, San Diego, Italy, Australia and many other places around the globe. A typical reaction was "this is the best beef bun that I have ever eaten, and I've come back for another!" 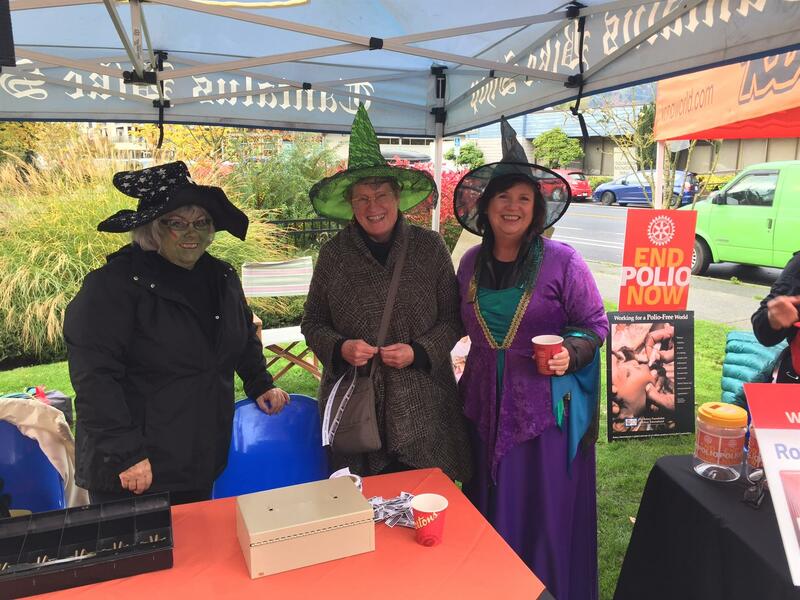 Total sales for the weekend were $14,000, the proceeds from which will go to support projects and services in the Squamish community. Thanks everyone. We will do it again next year! 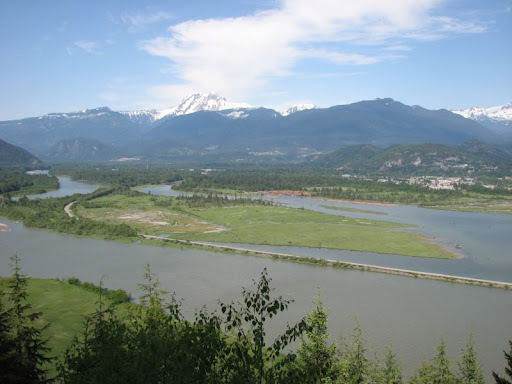 The Squamish Environment Society is hosting a Squamish Estuary Walking Tour for the Rotary Club of Squamish on Sunday, July 22. The walk begins at 10am at the Howe Sound Inn at 37801 Cleveland Ave. Please wear comfortable shoes and dress for the weather. Mary Livingston of the SES will be our guide. The cost is $5 to cover insurance and a pamphlet. The walk will run until noon ending back at the Howe Sound Inn. Everyone is welcome to stay for lunch which is optional and not covered. Please contact Judy Fowler at jackfowler@shaw.ca for more information. First of all thank you Rotary for the wonderful time and the opportunity to participate in this program and to spend time in this amazing country. During this year I have done things that people could never imagine in my town, as bungee jumping, going to RYLA, going to Hornby Island and going to Victoria, Whistler & Vancouver. Boating and fishing; taking a ride in a small airplane around Squamish and Whistler; shopping in the US; hiking the Chief and seeing animals i couldn't ever see in Italy. I have travelled a lot and I've met such amazing people as all the four host families who I stayed with. I have been through tough situations and I always knew that somebody could help if I needed it. At first I can't say that my exchange was easy- new country; new people; new culture . That was the tough period of my life. I missed home, family and friends. But after two months I started enjoying Canada. I made good friends, people I would never forget. In fact Jessica leas and Christie Lowe, two of my best friends are coming to my place for 20 days. My families were so good with me, changing families helped me understand the variety of Canadian culture . All of them took a little place in my heart and I will never forget how much love they could give to someone that is not even their daughter. I wish everyone could be in an exchange, just to understand that being different is not a defect but it's what makes the world wonderful. Thanks again amazing Rotarians. See you in few years. Acting President Denise Imbeau recieves funds raised by Howe Sound Secondary School's Interact Club 2011-2012 at the Rotary membership lunch, Thursday, June 28, 2012. 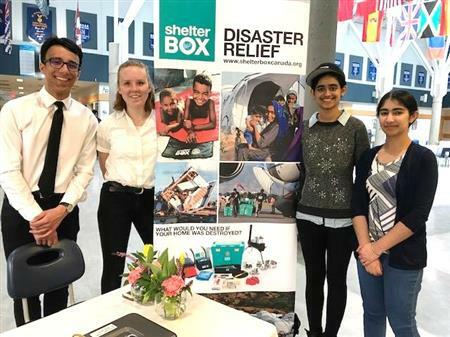 The HSSS Interact Club hosted a series of successful fundraisers throughout the year. $2900 was raised towards the Rotary Water Project and $3900 was raised for Polio Plus. Great work! The Community Service Report for 2011-12 has been posted under the Downloads section on the right side of this page. 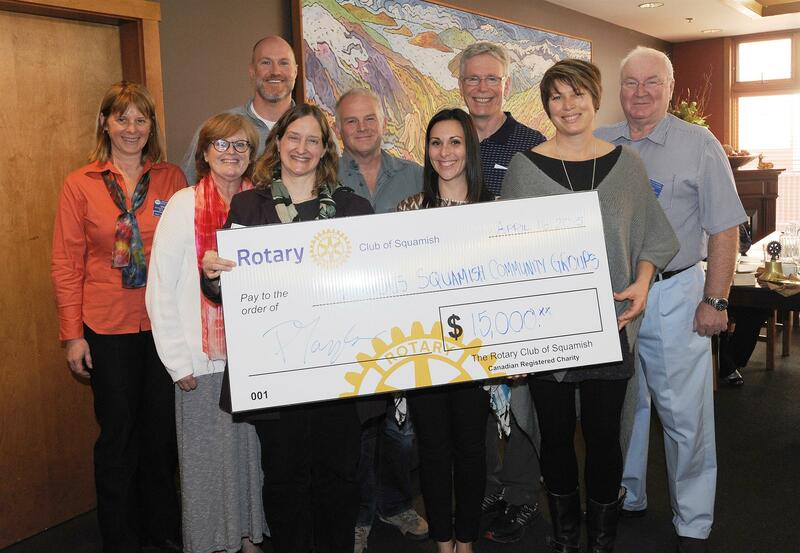 Please refer to this to review how the Rotary Club of Squamish contributed to the community during the last Rotary year. 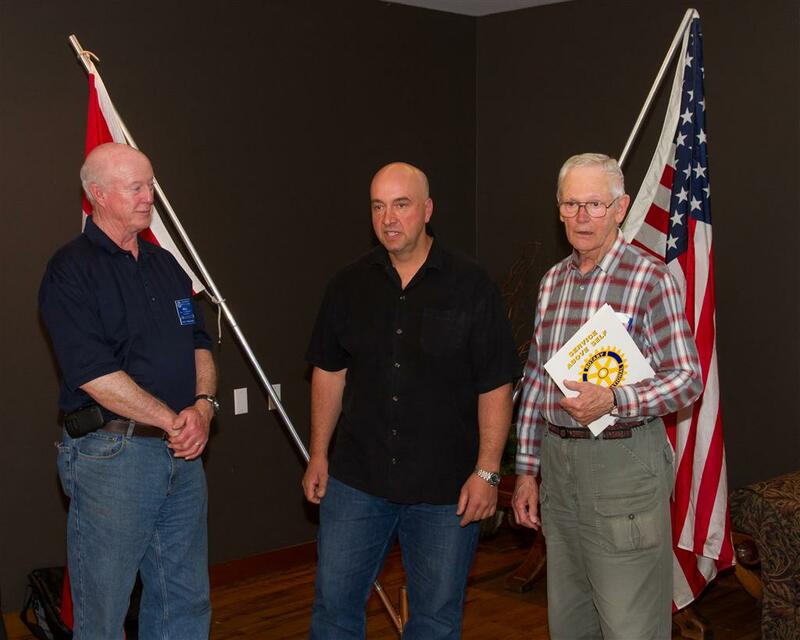 Don Christie, (right) installs Dean Terry(centre) as a new Rotarian. Bill McNeney (left) is Dean's sponsor. Rotary sponsored grade 11 Howe Sound Secondary School International Studet Wasup Map Srithongkun who took part at the Powell River Youth Film Program this spring. Don Patrick presents Sheri Davis with her Paul Harris Level 7 pin and Greg Gardner his Paul Harris Level 4. 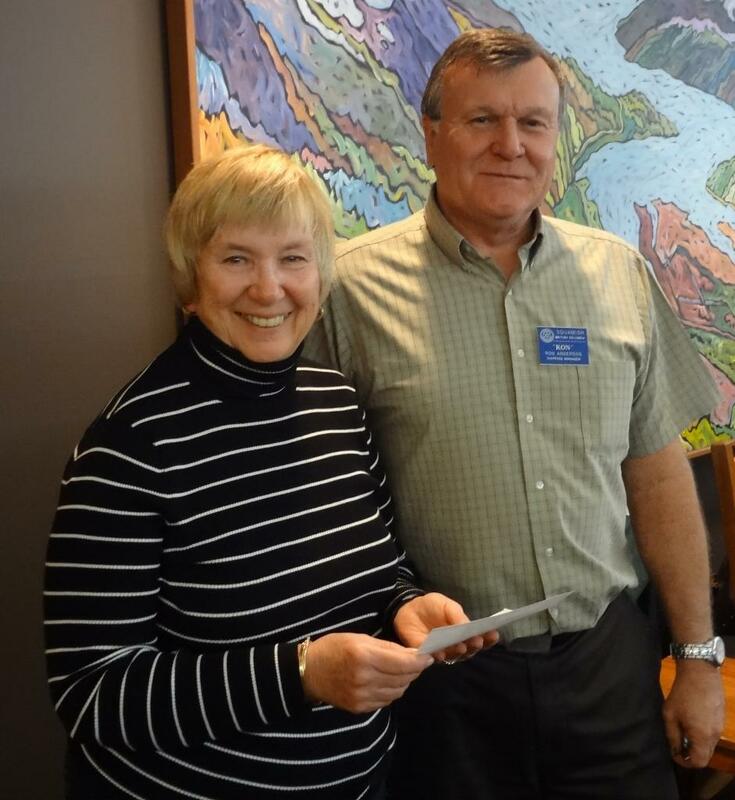 Pauline McNeney recieves two cheques for the Squamish Hospice Society totalling $3900 from the Rotary Club of Squamish. Present Ron Anderson presented the money to McNeney on the Club's behalf. There will be a Squamish Hospice Society climb on May 6th. Contact Rotarian Bill McNeney for more information on the Hospice fundraiser. April 5, 2012: Joan McIntyre speaks at the Rotary Club of Squamish luncheon. It is with heavy heart that I must inform the membership that John Drenka has passed away. I am told he passed peacefully at home yesterday with family and friends at his side. Our thoughts and prayers for Colleen and the Drenka family. The service for John Drenka will be held on Wednesday March 28, 2012 at 12:00 noon at The Squamish Valley golf Club. We are looking for Rotarians to assist in our Rotary Beef B-B-Q which we will prepare at the Golf Club for the reception. A core committee is being organized a signup sheet will be circulated at the Club lunch on Thursday, March 22, 2012. Please speak to Bill McNeny for details. With all the great snow accumulation up the mountains, here's your excuse to take a day off and go skiing this Spring Break! 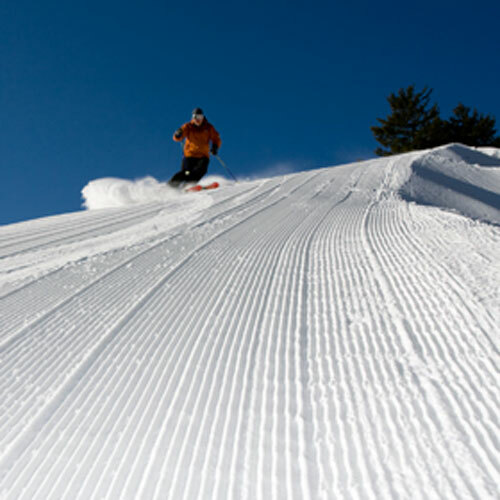 It's Rotary Ski Day in Whistler on Tuesday, March 12th at 7:10 am. Please contact Brian Finley, Director of Community Services at blfin@shaw.ca to get involved including car-pooling and signing up for breakfast. If you don't have a pass, Brian suggests buying one at 7-11 before you head up. Rotary Club by Merv and Lorraine Barrenton-Foote, the former owners of Merv Foote Men's Wear Ltd.
Last summer, Devyn Scott participated in a STEP (summer exchange) with Margherita Pasqual from Udine, Italy, near the city of Venice. 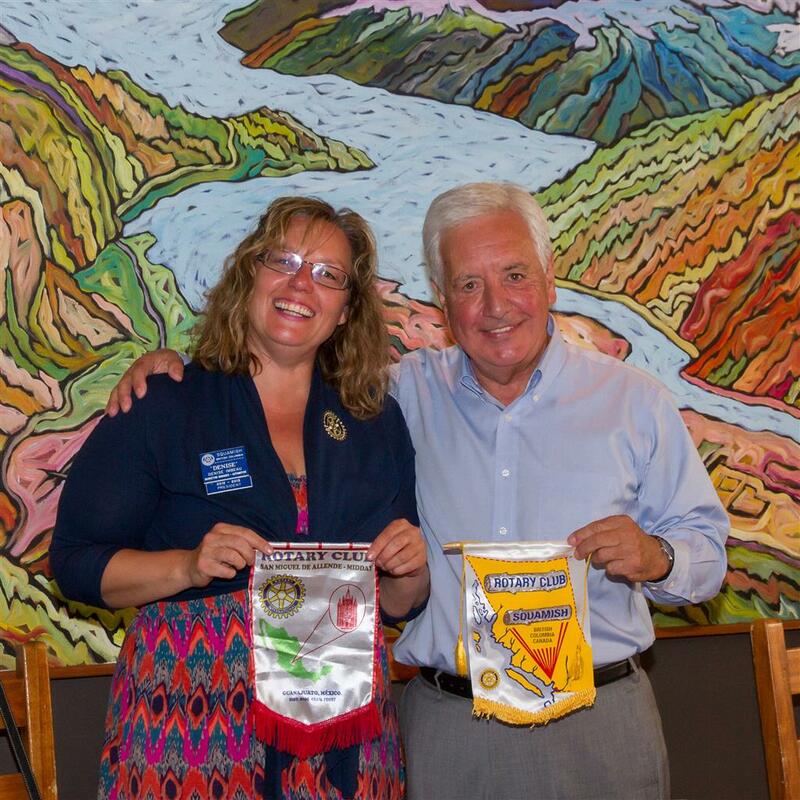 Here she is presenting the Rotary Club of Udine's club banner to President Ron Anderson. There are still spaces available for Summer 2012 STEP exchange. If you know a young person between the ages of 15 and 19 who you believe would make a good Ambassador and exchange partner, please contact either Judi McQuinn or Liz Scott. Requests have been received from several countries including France, Italy, Austria, Switzerland, Mexico, Germany, Ireland, and Finland. Brian Finley and Rose Fast of the Community Services Committee stand with President Ron Anderson as they recieve a plaque from the West Coast Railway Association for their contribution to the Rotary Garden at the West Coast Railway Heritage Park. 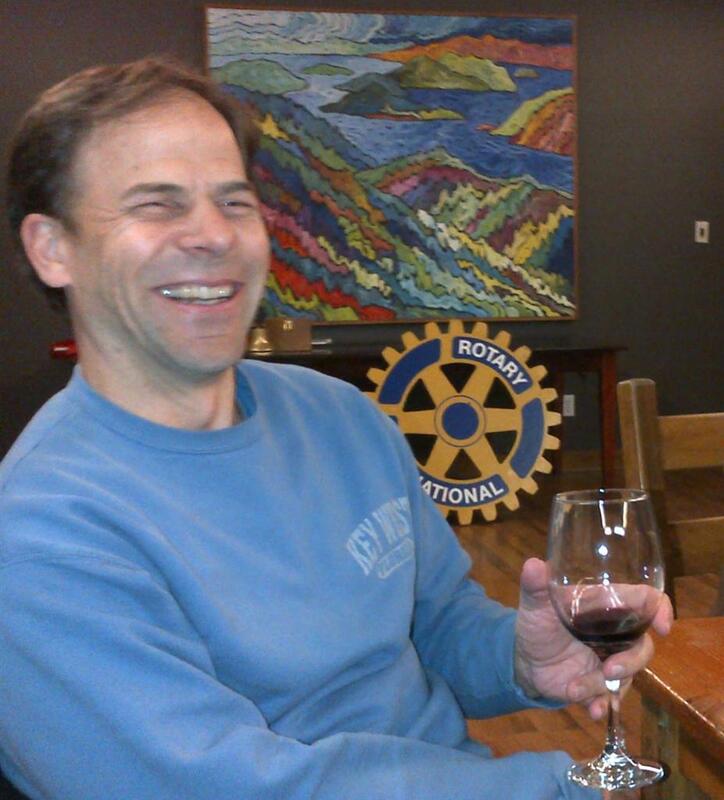 Photo: Rotarian James Martin shares a laugh and a glass of wine at tonight's Rotary Happy Hour. Past President Denise Rittberg chaired the meeting and Rotarian Colin Ransom was the guest speaker. Squamish Rotary will be hosting an evening of curling and fellowship this Friday, March 2 with guests from the Whistler and Pemberton Rotary Clubs at the curling rink at the Squamish Valley Golf and Country Club. 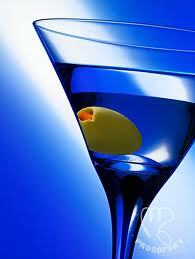 The only cost is your bar tab. Please contact Judy Fowler at jackfowler@shaw.ca to sign up. Thursday Lunch: February 23, 2012: Foundation Chairman Don Patrick presents Rotarian Glen McEachran with his Paul Harris + 2 pin. Glen is a Club benefactor which means he has stated his intent to donate no less than $1000.00 US to the foundation each year. The Wael Audi Volleyball league was first started by Officer Wael Audi of the Squamish RCMP. Waels goal was to integrate the youth with the emergency services of Squamish. After his untimely death while on duty, the league was put on hold. Graham Teanby re-started the league 3 years ago. This past year with the help of the Squamish Rotary Graham was able to get a monetary donation from Telus which covered the cost of trophies, medals, t-shirts and the cost of the gym rental. Teen mentors from both the local high schools are screened by BBBS, and spend one hour with a boy or girl in elementary school in a non-academic activity, playing games and sports, doing arts and crafts, or simply hanging out in the playground. Children in the elementary school are identified by the teacher or referred by a parent. The program builds self-esteem and worth through building a friendship with an older peer, giving them one caring individual in their lives. These children tend to do better in school, make healthier relationships, have improved decision-making skills and are less likely to get involved in drug and alcohol abuse.. The grant monies will be used for purchasing art and craft supplies, games, outdoor activities, bus transportation for the teens, volunteer recognition events. 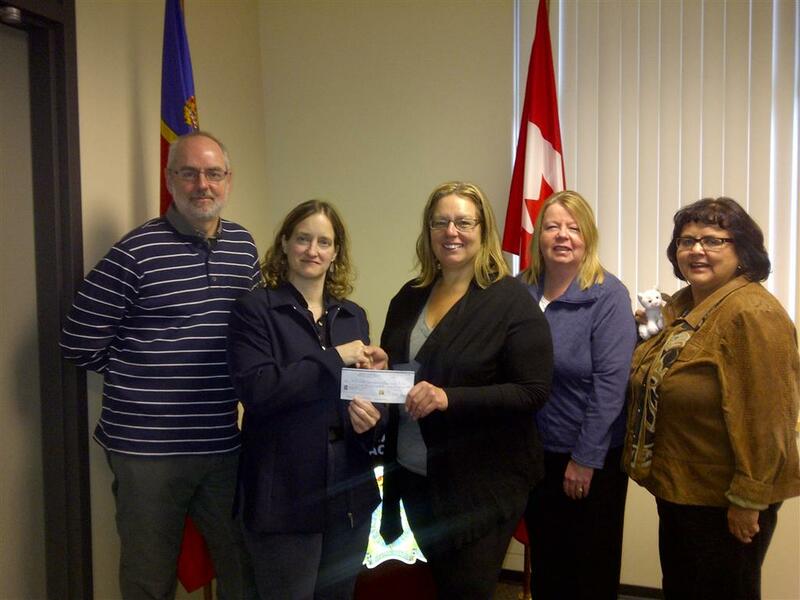 Pictured with President Pat is Ann Marie McKenzie receiving a cheque for $1000. 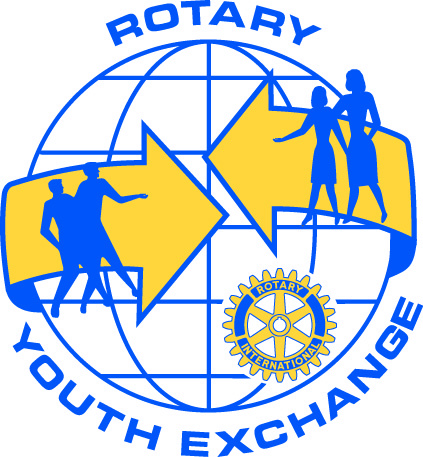 RYLA is Rotary's Youth Leadership program. RYLA stands for Rotary Youth Leadership Awards. Each year students aged 16 to 18 are chosen to attend this leadership camp held at Camp Jubilee in Indian Arm. The leadership skills and confidence that is instilled is amazing. 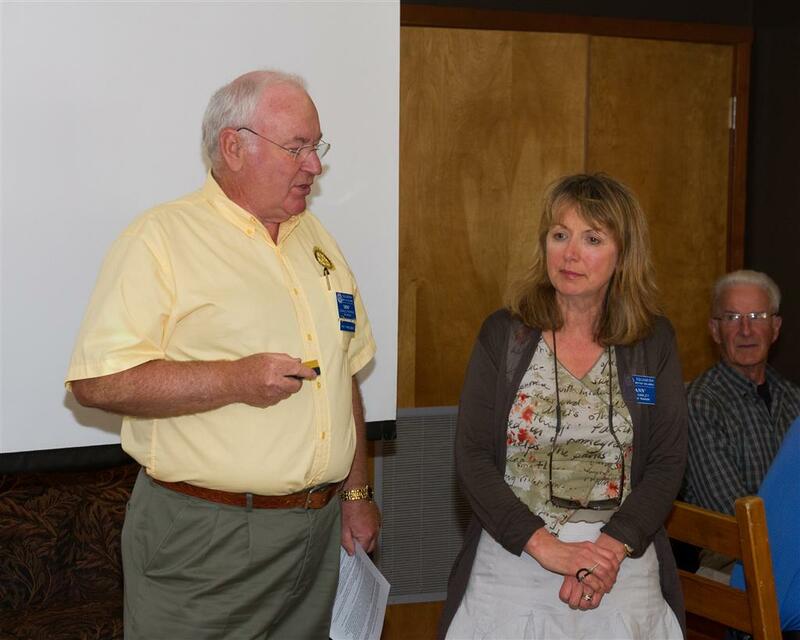 Recently the excited participants reported back to Rotary about their experiences. Pictured are Howe Sound Secondary student Ben Hughes, 2011/12 Outbound Exchange student Teri-Rose Davis, and 2010/11 Inbound Student (from Germany) Nora Kleffmann. Missing is 2010/11 Inbound Student from Spain) Sara Morales. Gaming funds are used to supported this priceless program. The newly created Seniors Lawn Bowling greens in Squamish was completed in September 2009 and over 40 seniors were introduced to the game of Lawn Bowling, however they are in need of protection from the summer heat and sun. These gaming funds will go towards providing four sunshades on the sidelines of the greens, making it more comfortable as well as safer to enjoy this sport. President Pat presents DoS employee Scott Lamont and Rotarian Janet Gugins (also representing the DoS) with a cheque for $1000. For those of you who were unable to attend the Vital Signs town hall meeting early last week, we still want your input (and the input of your family members) on what indicators of Squamish’s community health we should be reporting on. Please refer to your recent email "Vital Signs" for an attached series of ballots for each of the Vital Sign areas. Each ballot lists “Indicators”, which are things we can get hard data about. We need your help in deciding which Indicators are most relevant to Squamish. We ask you to do this by completing the left hand column “Rank” on each ballot by identifying your top 4 choice in order of importance to you, with “1” being the most important. We then need you to return the ballots by June 7th as instructed on the cover page. Alternatively, you can also return them to me at Rotary. The quality of the report on Squamish depends on each of us looking at this material and participating. I am happy to field any questions about the process, as are Carl Ingraham and Kevin Haberl. On Saturday April 16th, 2011 A Tribute to John Drenka was held at the Sea to Sky Hotel, featuring the film "The Legend of John Drenka". A packed house enjoyed this event, and many stories were shared by both old and young. Thanks for all that you have done for our community AND Rotary JD! Over $1200 was raised for the Log Books project. Thanks also to Bianca Peters, President of the Squamish Historical Society, for organizing this event. The Outbound Orientation for Youth Exchange students in District 5040 is going to be held at Quest University the weekend of May 13 - 15th. We would like to invite you to be a part of this dynamic weekend and have an opportunity to meet the students; both this year's inbounds and next year's outbounds as well as some returned exchange students. If you would like to help to create the atmosphere of a crowded international airport arrivals area, you are invited to come to Quest University May 13th at 7 pm. The simulation will take place from 7:30 to 7:50, so it is a very minimal time commitment. We are also looking for donations of baking for this weekend. Yum! Please see or email Sheri or Liz if you are interested in helping out. After many long months of waiting, the Gaming Commission recently announced that our Rotary club had been awarded $7500 to be distributed to groups with both our Rotary club and our community. A week later we were awarded a further $7500 for a total of $15,000. The Gaming Committee met and their recommendations were presented at the April Executive meeting. Recipients will attend the May 5th business meeting for presentations. At a recent meeting Lloyd Ingraham was honoured with a set of beautiful prints of Squamish by Ian Davis on behalf of the Squamish Community Foundation for Lloyd's contribution of close to $60,000. Thank you for supporting our community in such a significant way Lloyd. At age 16, Sara Galvan and Nora Kleffmann left friends, family and familiarity for the sake of experience. "Everything is different but at the same time is beautiful," said Galvan, a sincere smile on her face. 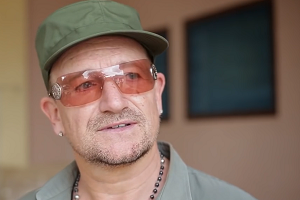 "After six months I'm much more comfortable and Canada is becoming more like home." Galvan's real home is Asturias, Spain and Kleffmann is from Osnabrück, Germany. Both girls are attending Howe Sound Secondary and live with host families as part of the long-term Rotary Exchange program for one year. I want to tell you a little about my last weekend, 11th and 12th of December. Those two days I spend with the Rotarian Inbounds in Vancouver. We met in Metrotown and went for Christmas shopping the entire noon. It was awesome to see them again. We haven´t seen each other since Halloween. Therefore it was so exciting, because every time we have new adventure to share. We also had lunch together before we went ice skating. 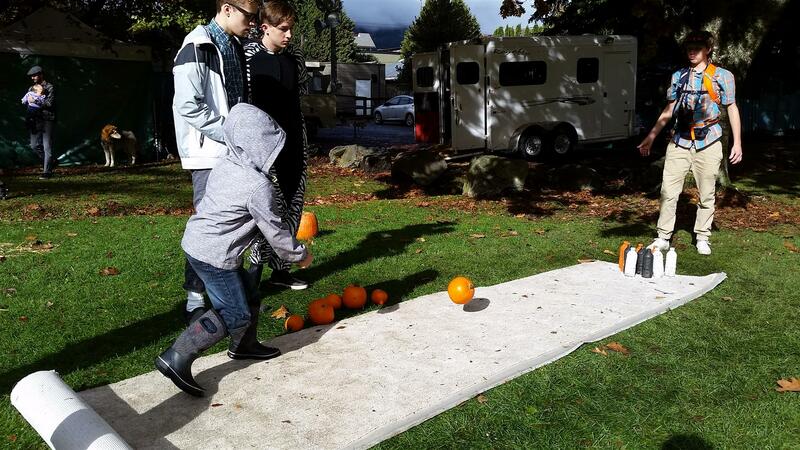 Even though most of us couldn´t skate that good, we tried not to fall and had tons of fun. After ice skating we went to Janice Froese´s place and she prepared a lovely dinner for nine exchange students in total, three Rebounds and couple of nice Rotarians. We sang, laughed, talked, played games, made Gingerbread houses and exchanged gifts under the Christmas tree. It was amazing to have Brazil, Italy, Sweden, Belgium, Holland, Czech Republic, Spain, Germany and Canada sitting on one table. We were really glad to spend also Sunday together. And especially for me it was something wonderful to go to a "German Christmas market" in Canada. It felt like home and I was lucky to share little German tradition with my international friends. So you see I´m still enjoying my new, busy life in Canada and looking forward to the next Inbound Whistler weekend in January. 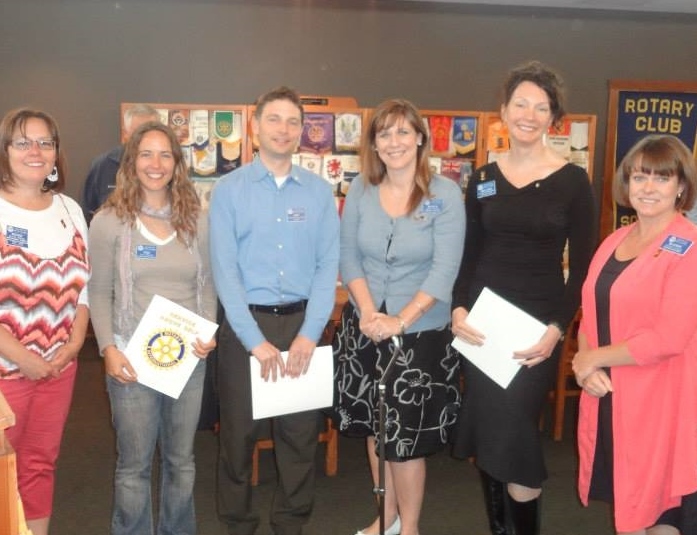 At our Rotary meeting on December 9, 2010, two new Rotarians were inducted. They are Deidre Plaatjas and Michael Kanka. Welcome Deidre and Michael. 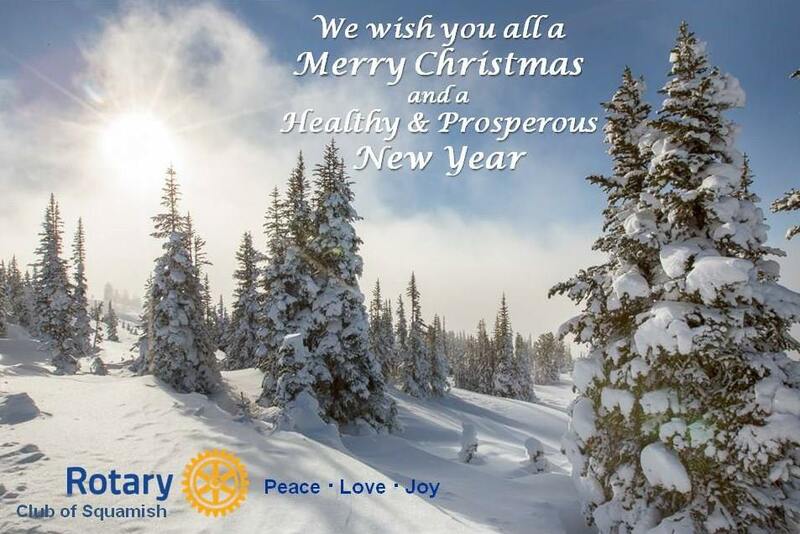 We look forward to working with you to achieve the goals of Rotary. 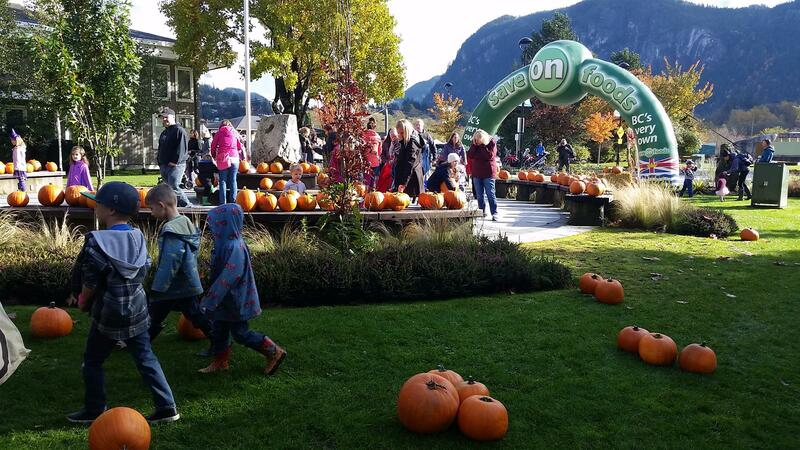 Squamish leads the way by "taking back the tap"
Teri-Rose Davis is very excited these days. She was selected from among six applicants for the Long Term Youth Exchange Program. Teri will be heading out on her exchange in July 2011, and although she won't know where she is going until sometime in the Spring, there is still much planning to do to prepare for this amazing adventure. Teri is pictured second from left together with Larissa Bergeron with their Interact Club's Pennies for Polio collection, and PDG Chris Offer and DG Penny Offer. In August of 2010, the Squamish Rotary Club was made aware that the Hospice Society had a short fall of funding. 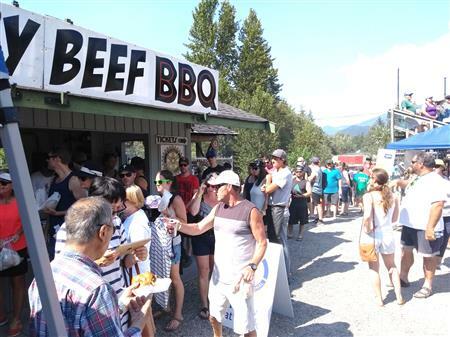 The upcoming Squamish Live Music Festival was the Rotary Club's next fundraising effort and the executive assigned a percentage of the profits from the Beef BBQ to be donated in the name of the Squamish Hospice. The fundraiser was unsuccessful resulting in a deficit… which in Rotary means the members pick up the shortfall. The Bank of Nova Scotia offered a challenge that would match up the first $5,000, therefore the Lloyd Ingraham Challenge to the Rotary Club of Squamish resulted in a total of $11,200 towards the continuing service of the Squamish Hospice Society. Thank you Lloyd and your fellow Rotarians and the Bank of Nova Scotia. A new addition of a Squamish Rotary brochure is being finalized. Liz Scott is still looking for a couple of testimonials for the brochure. If you would like to say a few words about what Rotary means to you, please see Liz or email her at liz_scott@shaw.ca. Thank you to everyone for your input. Rotary Foundation Co-Chairs Don Patrick and Mike Nasu recently co-hosted a Foundation Dinner at Don and Lynda Patrick's home. Mike brought his culinary skills to the table and a wonderful time was had by all, in addition to monies raised for our Foundation. Don and Mike are now looking for someone willing to host the next Foundation dinner in either October or November. Please speak to either Don or Mike if you are interested. Reminder: the host receives 500 Paul Harris Credits and those attending receive a tax receipt. The recent Golf Fundraiser at the Squamish Valley Golf and Country Club raised $8,000 for the Squamish Elementary Schools Breakfast Program. Thanks to Brian Avey for organizing, Glen McEachran for all of your work promoting, and of course to all of the golfers for participating and supporting. Lunchtime September 23, 2010 found us at the West Coast Railway Heritage Park in the newly opened CN Roundhouse and Convention Centre. 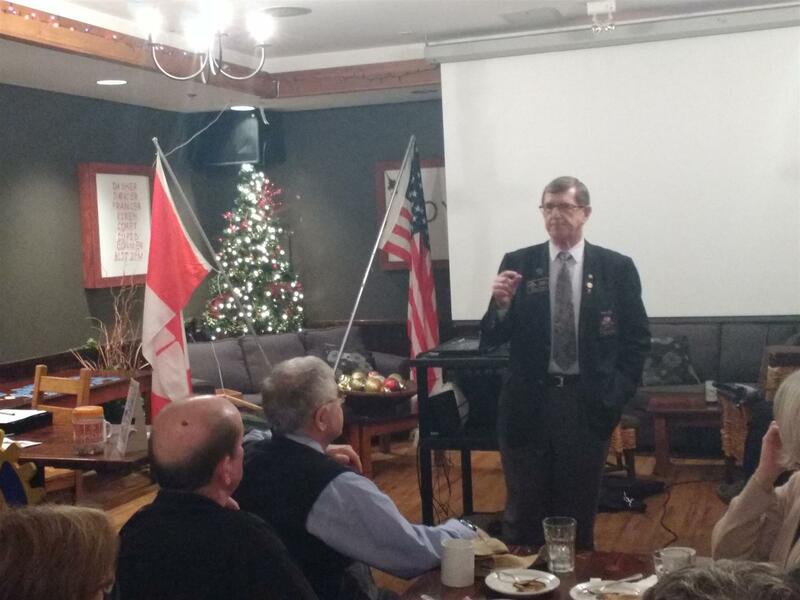 Rotarian and a driving force behind the Railway Heritage Park and its future vision, including the Roundhouse, Don Evans, updated our club about the history surrounding the Roundhouse and the challenges that were faced along the way. Today we have a beautiful new facility in the Railway Park capable of hosting a crowd of up to 1200. Thanks Don, for your commitment to this amazing facility, and for sharing its history with us! Thanks also to Greg van Hierden of G-Van Catering for a delicious lunch. Enjoy 5 days in beautiful Guatemala, golfing, going on excursions, experiencing Guatemalan culture and supporting the great work of Casa Colibri. Contact Sheri or Pat for info. If you'd like to know what our outbound student is up to in Mexico, read her outstanding blog. The link is on the left side of our website under "Club Links"
Don't forget the BBQ hut cleanup tonight at the Logger Sports Grounds. We will meet at 6 pm. Also, don't forget your shift at the BBQ hut Saturday and Sunday. It's going to be a FANTASTIC weekend for Logger Sports! 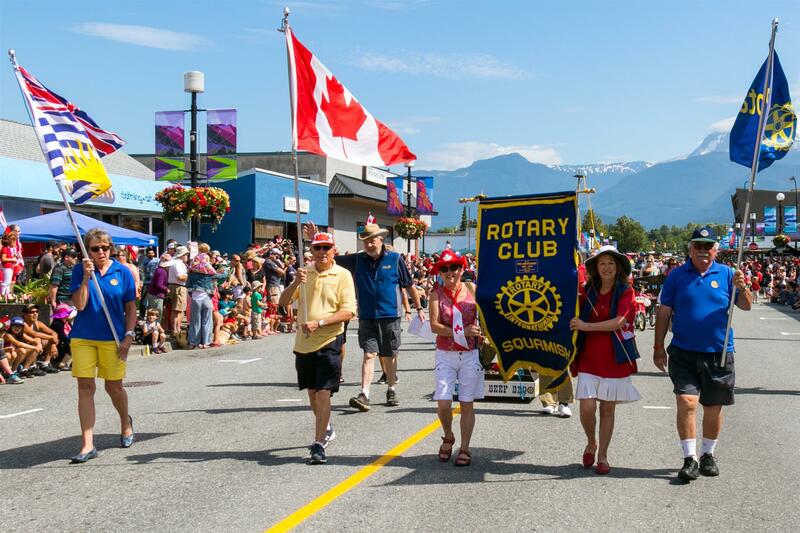 The District 5040 Directory has been added to the Squamish Rotary website. To access this Directory, please sign in, and click on "Admin". Then click on "View Club Documents" on the lefthand side of the screen. Click on "District 5040 Directory". With the blessing of PDG Gord Dalglish, Sheri has contacted all the clubs in the district in an effort to coordinate a GSE Legacy project with the home club of the GSE leader in the Phillipines. Clubs are being asked to donate fines/happy dollars, and "take a child to breakfast/lunch/dinner" during the second week of July. Funds raised will go towards the Filipino club's project at a local orphanage, which involves a feeding program and the purchase of school supplies. The goal is to collect approx $6700 and then write a District grant to bring the total to $10,000. 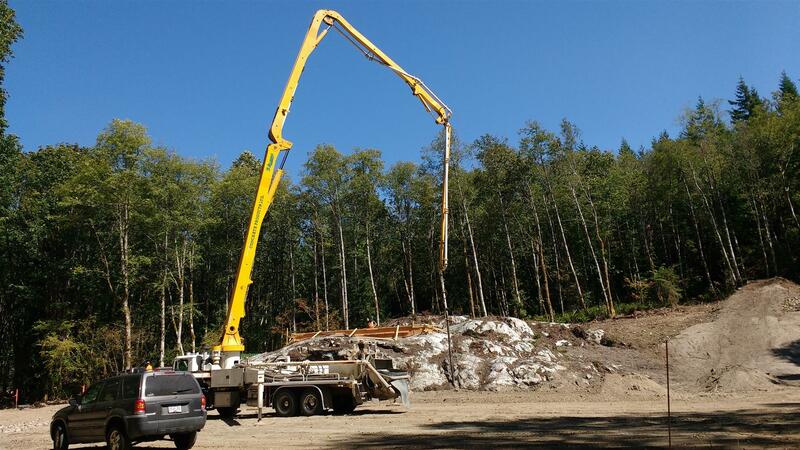 Approximately $470 was collected in fines and happy dollars at our recent Installation in Whistler towards this legacy project. Next Thursday, July 15th, we designated as Squamish's "take a child to lunch" day, so if you would like, we invite you to donate a lunch in a child's honour to this legacy project. 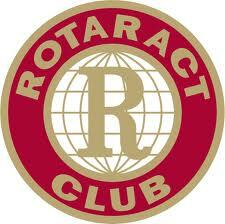 Take a few moments to review the accomplishments of our club during the 2009/10 Rotary year. You will be astounded by just how much our club does over the course of one year. Read the article and then pat yourself on the back for being part of this remarkable club! 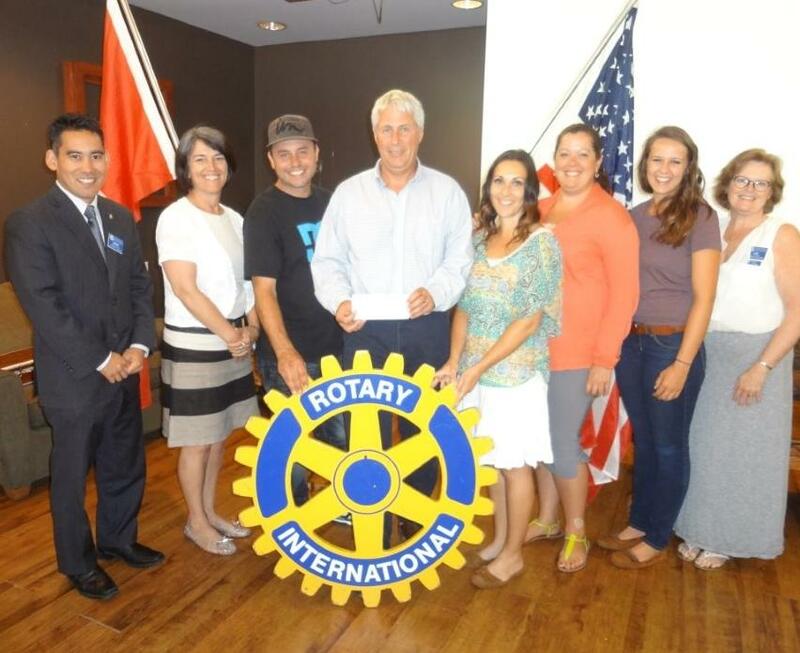 Rotary meeting August 5th will be held at Chances Casino on the deck. Last year's outbound student, Michael Duffee, has returned from Brasil. Sara Nilsson, our Inbound Student, has now returned to Sweden full of wonderful memories of Squamish and Canada. This year's outbound student, Logan Bennett, had many issues with his visa for India, but arrived there over a week ago and is already attending school. Abbey Heilig, our other outbound student is will be heading off to Puebla, Mexico very soon. Inbound students, Nora Kleffmann from Germany, and Sara Morales from Spain, are registered at Howe Sound Secondary and have their courses. Nora will arrive Aug 25 and will stay with the Heilig's. Sara will stay with Pat and Gary Taylor first. We still need one more host family!!! All seven Squamish STEP exchanges are going well. 3 students attended RYLA Lakelse. They are Maegan Bruce, Britany Shier and Abbey Heilig. 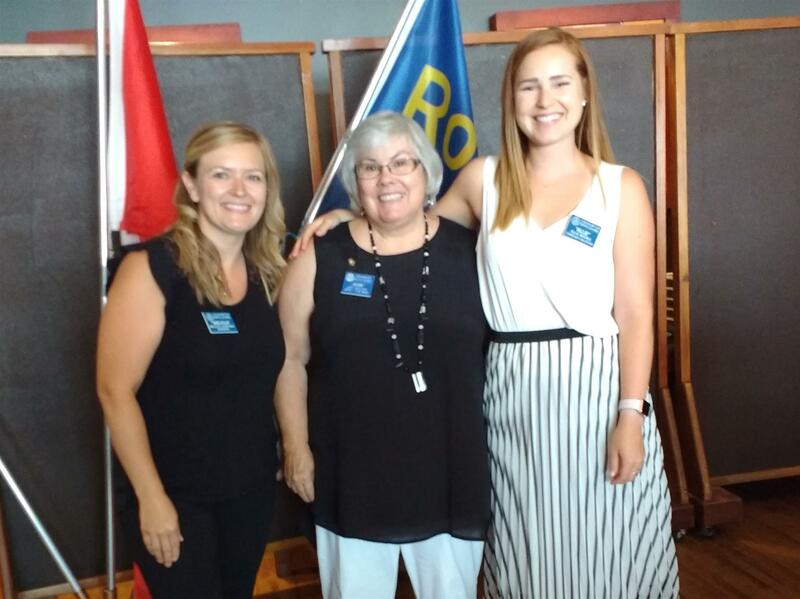 The 3 young people we sent to the Rotary International Convention and pre-convention Rotaract meeting in Montreal were very inspired and are excited to get the Rotaract club going. 2 of the students will return to school at Quest in August, and start recruiting members. Katelemwa Cheshire Home in Uganda - final paperwork for the matching grant has been submitted and accepted by the Rotary Foundation. Matching grant closed. EBRC - funds from the matching grant have all been spent. Final paperwork will be done with the Rotary Club of Hurlingham so that the grant can be officially closed. 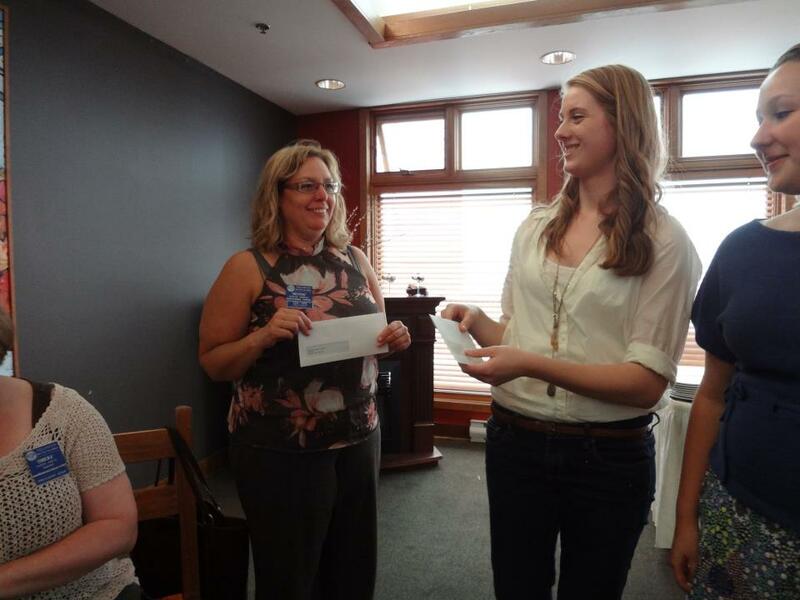 We recently received just over $3300 from the Interact Club of Howe Sound from their Global Awareness Dinner. Funds were raised for EBRC. We wired $2500US to EBRC on July 6. Miguta Health Center in Kenya - Sheri and George Mbugua from the Rotary Club of Nairobi Industrial are continuing their work on the Global Grant application. Casa Colibri - received correspondence from Linda McGinty of Michigan. Included AGM minutes and an update of current activities at the clinic. We have forwarded $6000 raised during Ian's year, and have committed to another $10,000 for this year as part of a Global Grant application. Sheri will work with Linda on this process. If you are interested in becoming a website sponsor for only $50 per year, please contact Liz Scott. Your company banner will be included on the home page of the Squamish Rotary website and will be viewed by anyone who visits our website. This is great exposure for great value! Thanks Rotarians for the incredible outpouring of support for TEAM LIZ in the Ride to Conquer Cancer. Devyn and Randy Scott rode 254 km from Vancouver to Seattle this past weekend, battling blistering heat, headwinds so strong that they tossed Devyn into the bushes at one point, rainstorms causing hypothermia in many of the riders, and 9.2 million dollars for the BC Cancer Foundation. Devyn and Randy raised $10,300! 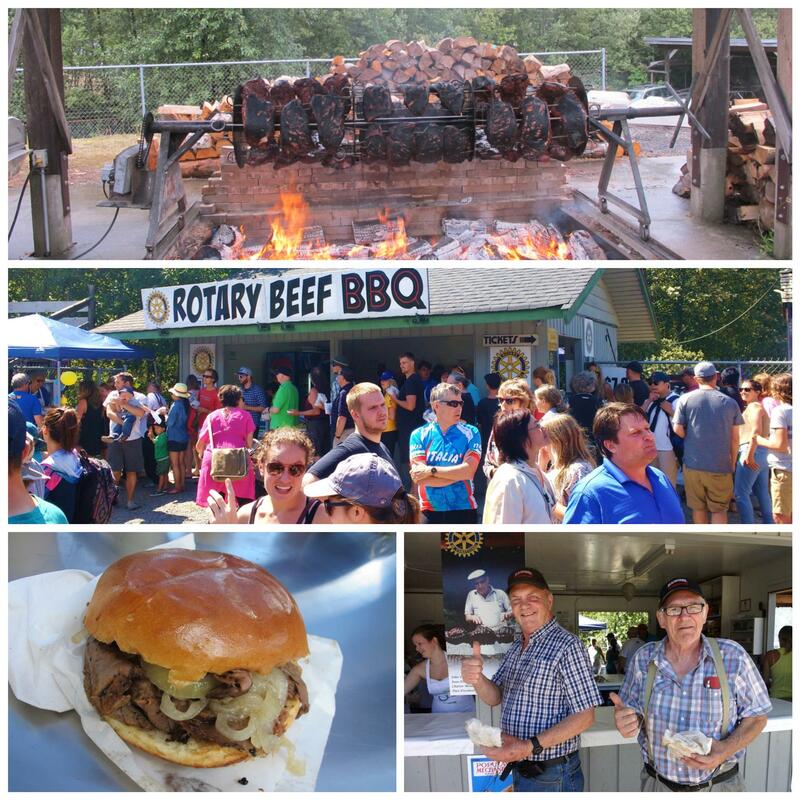 Pictures have been posted on the Rotary Club of Squamish facebook account from the Rotary Beef BBQ July 31 & August 1. Go to www.facebook.com and enter Rotary Club of Squamish to view the pictures or enter http://www.facebook.com/pages/Rotary-Club-of-Squamish/96770330919 if you are not on facebook. By the way, can you identify the Rotarians in this photo? A few weeks ago I travelled to Liberia. It's taken me a while to write about it because it was the type of trip that required some processing afterwards. While I'm still turning over much of what I experienced in my mind, let me share a few notes with you. Monrovia, the capital city, is spread out along wide roads. It has the potential to be beautiful, boasting white sandy beaches and lush green trees – and perhaps it once was. But the scars of war are still very present. As a tour I was taken to a five star hotel, or what had once been a hotel; now it was an empty shell with soldiers camped out in the lobby to prevent squatters. Street children played in the empty swimming pool and parking lot. From the poolside I looked out all over Monrovia – directly bellow me a massive slum pressed out on a peninsula of white sandy beach. Alex Cairns, accompanied by Ian Davis, rides by on Mamquam Road during the Celebrity Challenge Saturday on his way to the finish line at the top of Perth. 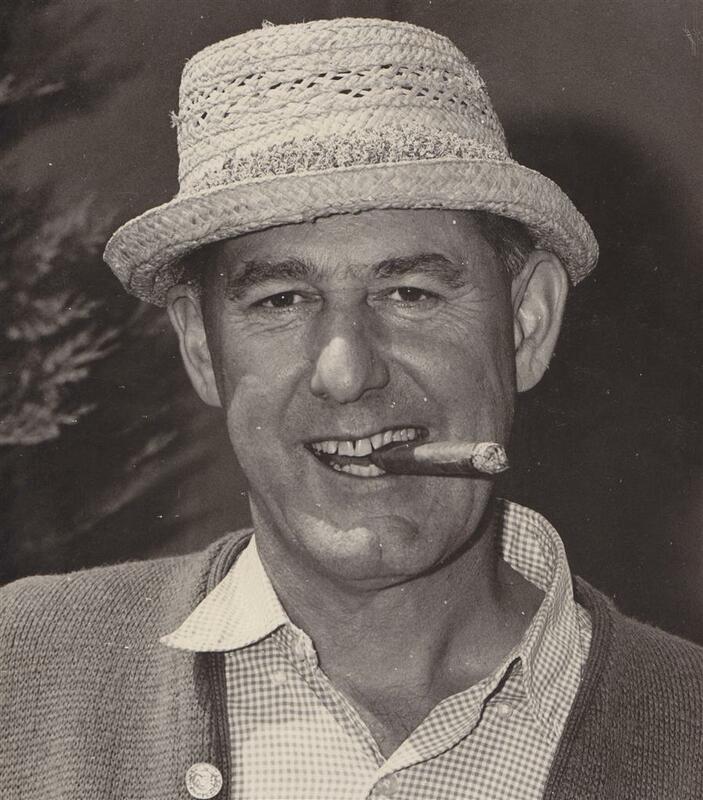 Once there, he was awarded a cheque for $5,000 for a sit ski from the Club 200 fund. 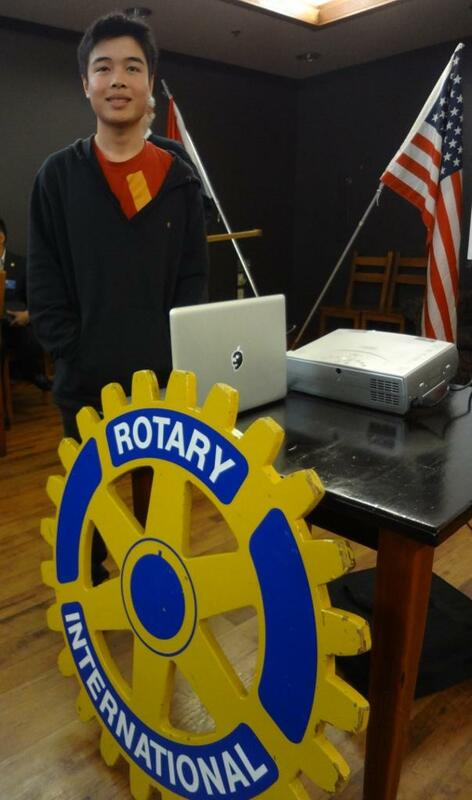 Alex raised $1,700 for the Linda Carney Rotary Cares Fund by going door to door collecting pledges. We support you, Alex! If you have any Rotary photos from the past year, please email them to Liz Scott at liz_scott@shaw.ca to include in the slideshow for the Installation Saturday evening. Several offspring of Rotarians are graduating from HSS this year including Glen McEachern's son, Patrick, Judy Fowler's adopted granddaughter, Andy, Matt Sousa's son, Kevin, Ian and Sheri Davis's son, Gareth, and Liz Scott's daughter, Devyn. Many awards, scholarships and bursaries were handed down and several of the students are also members of the Interact club, headed by Sheri Davis. Pictured is Devyn Scott, receiving the Allison Roberge Memorial Award from Denice and Nate Roberge. A new Canadian postage stamp recognizing 100 years of Rotary service in Canada is now available. Juliana & Julio Cha presented a Squamish Husky award to Alex Cairns at the Howe Sound Secondary Awards night. Rotarian Laurie Vanzella presents the Dr. Luke Plunkett Memorial Award to Patrick McEachran, son of Rotarian Glen McEachran at the HSS Awards Night. Patrick received several other awards this evening as well. Congratulations Patrick! June 10 was Awards Night at Howe Sound Secondary and there were many highlights. 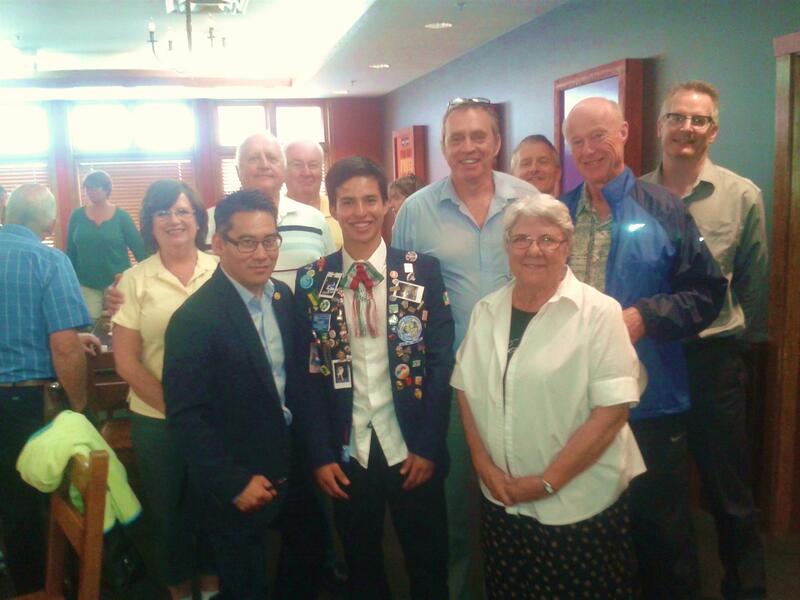 Among them of course, was the awarding of the Rotary Club of Squamish Scholarship. The recipient is Julianna Bourke, an active Interact member and recently chosen student to attend Adventures in Citizenship in Ottawa. 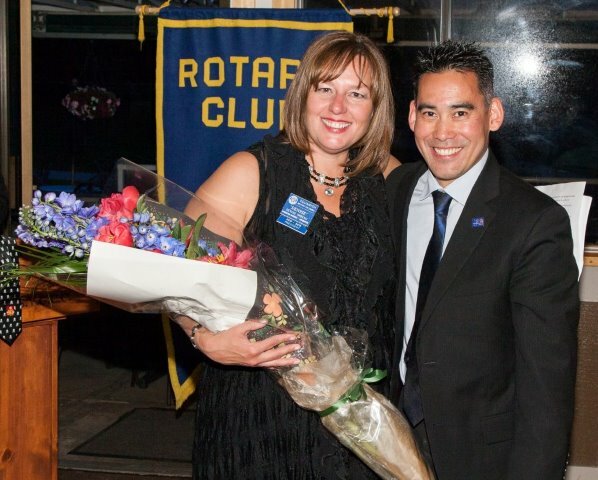 At the recent District Conference held in Prince Rupert, our own Sheri Davis was named District 5040 Rotarian of the Year. 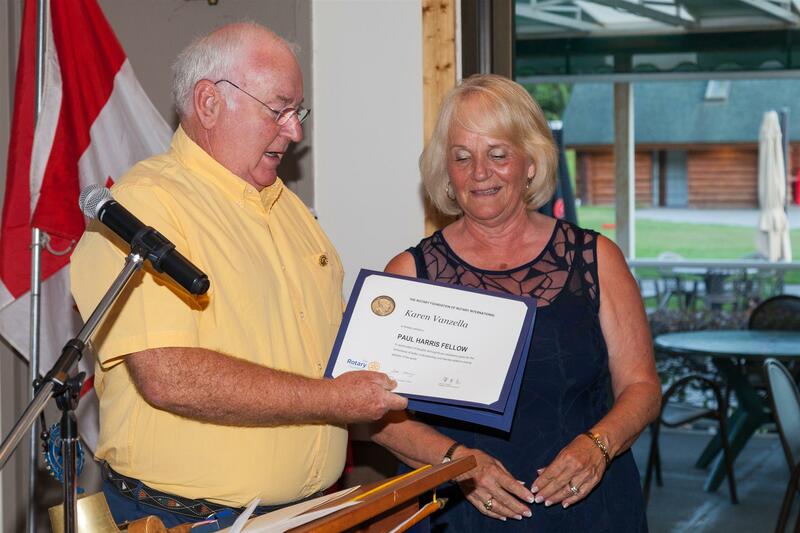 Upon Sheri's return to our club, in true humble fashion, Sheri claimed that it is impossible to name just one Rotarian of the Year as it is because of the support of the club and her husband and current club president, Ian, that she was so honoured with this distinction. 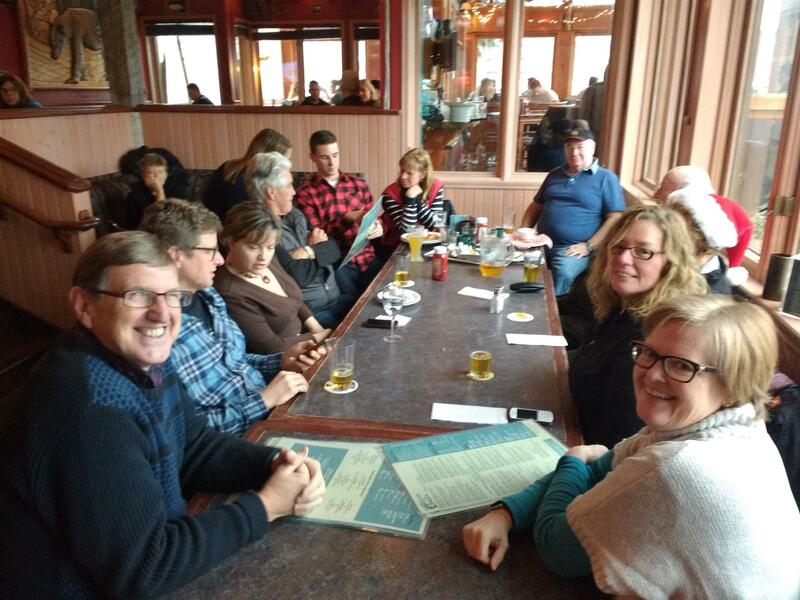 Regardless, we know how many countless hours you devote to Rotary, Interact, Rotaract, as Assistant Governor for Sea to Sky, to International projects and grants; the list goes on, and our club would not enjoy the success it does without you, Sheri. 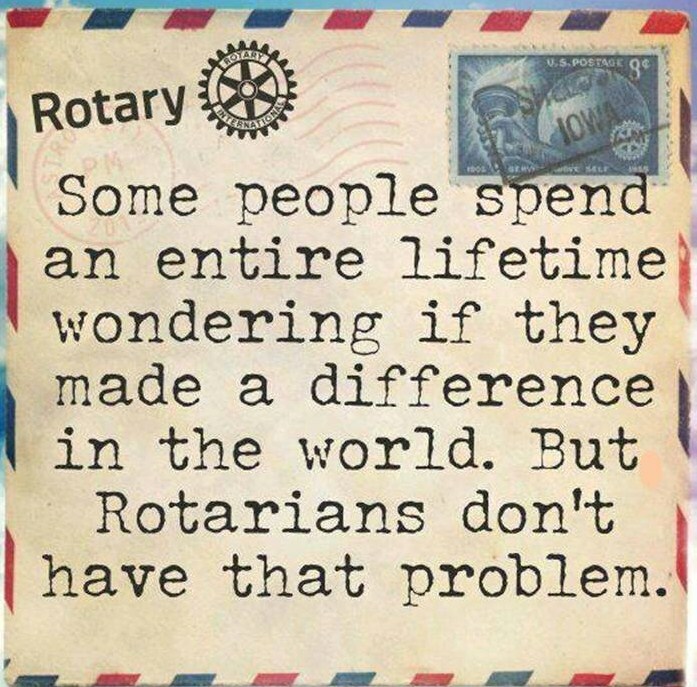 Thank you for all that you do for Rotary. Sara Nilsson recently presented to the club about her home in Linkoping, Sweden, including her family and many of the traditions. Her presentation was very interesting and informative, as well as entertaining. Well done, Sara! February is already over, school is back in full swing, and I'm already halfway through my exchange. At the beginning of this month, my whole family and I finally went on our trip to Toque-Toque, an amazing beach about 3/4ths of the way from Sao Paulo to Rio. In total, there were 12 of us (6 more later on in the vacation) fitting into a few cars, which then drove 4 hours through Sao Paulo during rush hour (which, if you have ever been there, means that we had just driven 40 or 50 kilometers! ), and 3 more hours on the beautiful highway that overlooks the sea and beaches way down below! When we arrived during the nighttime, me dad, mum, uncle, granddad, grandma, 2 sisters, 4 cousins (all girls), and I unpacked our things into our beautiful rented beach house and went to the local town to get something to eat and to meet another uncle, and 2 cousins (one boy and one girl). We all ate and decided to get some sleep and wake up early for the sun and the heat (which I couldn't wait to finally get under at the beach!). The next day we all walked cown to just quickly check out the beach before breakfast and se the best place to set up campl After quickly walking along the beach (I decided to be very smart about the sun and slowly ease into a good tan by putting on sunscreen morning and afternoon for it), I made my way to near my house and for some stroke of luck, ran into a Canadian girl that I had known on my first week of Brazil! I went over and met her family and we got talking for a longg time. Unfortunately for me, when I came back to my house 3 hours later, I noticed that I was already burned and forgot to put sunscreen on my very first day. The next few days were very cool, although I was looking a little bit like a lobster, and I got to meet a lot of very nice people wanting to know where I was from (white hair at the beach full of extremely tanned people draws some attention). The week of May 24th the Forestry GSE Team from South Carolina District 7750 visited Squamish. Forester and Rotarian Kevin Haberl arranged for a local tour for the team and they also joined us for lunch. They gave us a brief update of their travels, marveling at the scenery through the Fraser Canyon enroute to the District Conference in Prince Rupert. Of course, they were also able to witness the devastation to our forests that the pine beetle has brought. Again the team was awed by the sights on the ferry trip back to Vancouver Island. Pictured are President Ian with Tammy Cushing, Clemson University Professor of Forest Economics and ManagementKristen Austin, South Carolina Southern Blue Ridge Project Director for The Nature Concervancy, Mary Yonce, Timber Manager for the U.S. Forest Service on the Sumter National Forest, and Michelle Christensen, an intern with the Endowment at Portland State University, with plans to become an urban planner and hopes to apply for an associate level position with a forest-conservation non-profit. Upcoming Outbound Youth Exchange students Abbey Heilig and Logan Bennett came to Rotary to thank us for our support and the opportunity to head out on their year long exchanges. Abbey is going to Peubla, Mexico, and Logan is heading to India. We look forward to hearing about their adventures while they are away. Bicycle Safety A Success Again! 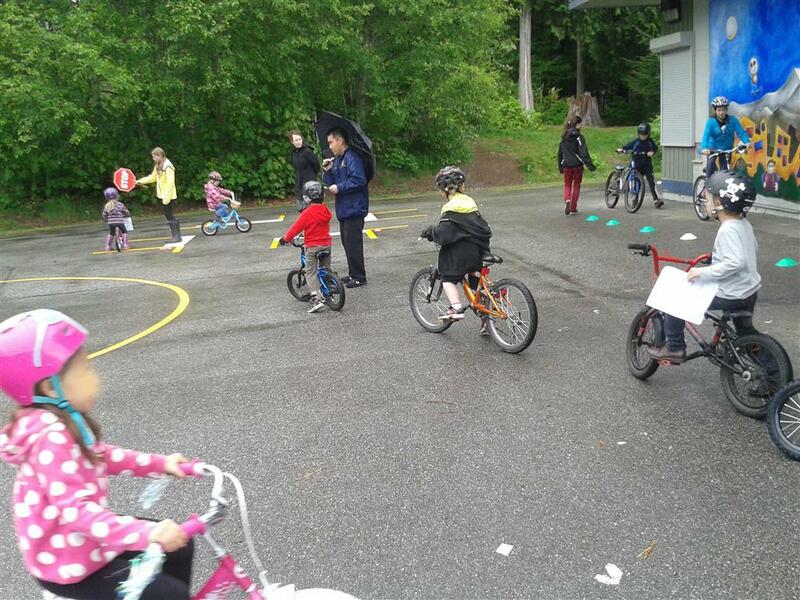 Bicycle Safety, held at all of the Squamish Elementary Schools, and a joint effort with the local RCMP and student volunteers from the high schools, was once again a success. This is such a highlight, especially for some of the younger students who sometimes even remove their training wheels for this "big event". Thanks to all who came out to help, and to Don Patrick and Peter Martin for organizing. RI President John Kenny says in his last message as president, "These past 12 months have given me the opportunity and the privilege of observing firsthand how our service touches the lives of others, and how great are the needs we address." RI President 2010-11 Ray Klinginsmith will visit District 5040 on September 29th. There is a new online newspaper in town. 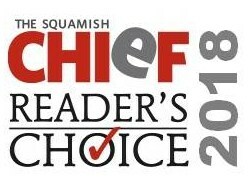 You can find it at www.thesquamishreporter.ca. In it there is an article about Rotarian Daniel Nduati, reprinted here. It's been five years since Squamish resident, Julia Smith, first met Daniel Nduati, the director of the Emmanuel Boys Rescue Center in Nairobi. Since then, members of the Squamish Rotary Club have fundraised close to $90,000 for the centre. Daniel Nduati was high on drugs, wandering aimlessly on the streets of Nairobi when a stranger patted him on the shoulder. 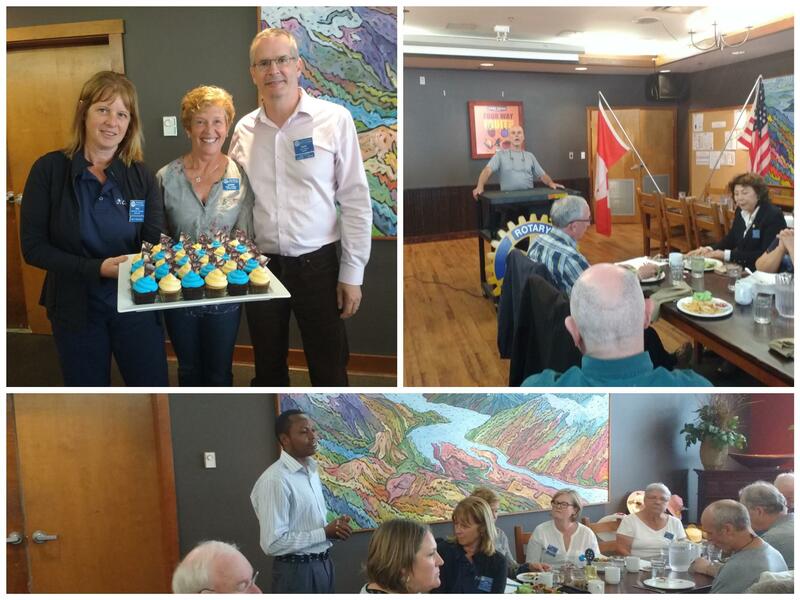 Daniel Nduati was in Squamish on the invitation of Rotary Club. "Who are you?" Nduati asked. "I am Jesus." the man said. Nduati looked closely. The man resembled his neighbour who used to graze sheep. Only, he was much more handsome. 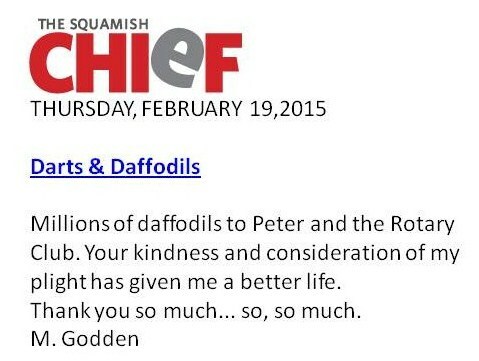 To read the rest of the story, go to www.thesquamishreporter.ca. 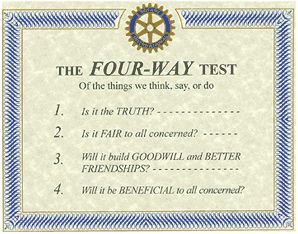 At the April 28th, 2010 Rotary Council on Legislation, representatives approved the addition of a fifth Avenue of Service: New Generations (a slight amendment from Youth Service). New Generations joins Club Service, Vocational Service, Community Service, and International Service as the foundation of club activity. The District Conference held in Prince Rupert was truly inspirational. About 3 pm, the clouds move in and the humidity rises. I'm sitting at my desk. Out of the window directly in front of me I watch women and children balances buckets on their heads as they go back and forth from the river. Through the open door to my right I can see the massive mango tree that shades our office. The temperature directly under this tree is always a blissful few degrees cooler than anywhere else. Now the leaves are beginning to tremble and in a moment the whole tree is shaking in the wind and ripe mangoes are falling like rain. Everyone is laughing and chasing to catch the sweet fruit. Then the rain pours down, sending everyone except the children inside. 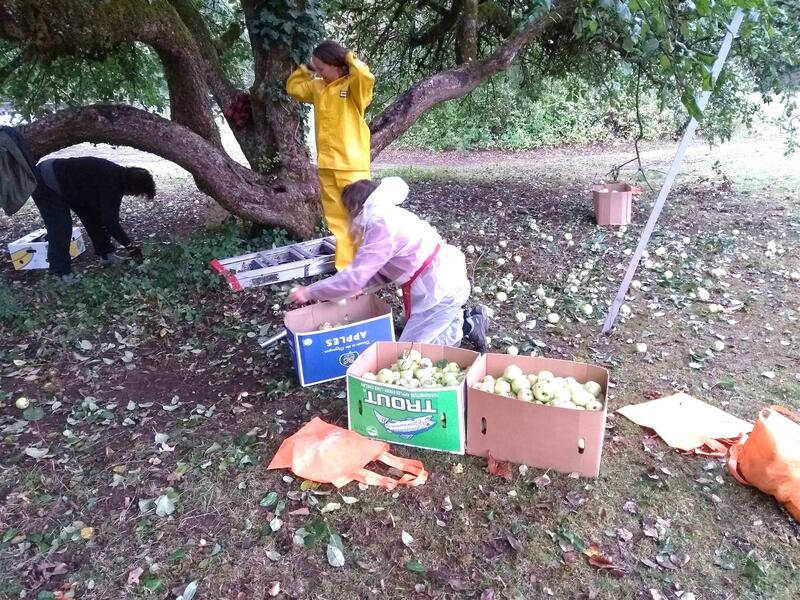 The children continue to chase the mangoes and then begin to dance in the rain. They are thin, except for swollen bellies, and they are getting the only clothes they own soaked, but they are laughing and playing like children do everywhere. To read more, click on Julia's link on the lefthand side of home page under Club Links. We encourage your consideration and circulation of this invitation for nominations for the 2010 Order of British Columbia. Our work between the government and non-profit sectors highlights the everyday successes and contributions of many individuals who make a huge difference in the lives of British Columbians. The OBC is the highest form of recognition that can be awarded within BC and carries significant attention to those involved in very worthy causes. Your assistance in seeking nominations is appreciated! The British Columbia Honours and Awards Secretariat is currently accepting nominations for the province's highest honour, the Order of British Columbia. Established in 1989, the Order of B.C. recognizes those people who have served with the greatest distinction and excelled in any field of endeavour that benefits the people of B.C. or elsewhere. It represents the highest form of recognition the province can extend to its citizens. Nomination forms are available by going to www.protocol.gov.bc.ca and following the link for the Order of British Columbia. All entries should reach the Honours and Awards Secretariat office in Victoria by 5 p.m. on June 10, 2010. Great opportunity to sponsor Grade 8 to 10 students with leadership potential for this life time experience. Submission Deadline May 30. Please see Sheri Davis if you know of a young person who may be interested in this great program. Want to Take a Course at Quest? Did you know there's a Rotary channel on YouTube? At the recent Rotary NAYEN (North American Youth Exchange Network) Conference held in Chicago, the District 5040 Youth Exchange committee was proud to receive the Bronze Level Award for Achievement. We can ALL be proud of this award and the commitment that each member of Youth Exchange contributes. NAYEN is made up of Rotary Youth Exchange Districts from Canada, the U.S. and Mexico, however Districts from all corners of the world were represented at the conference. 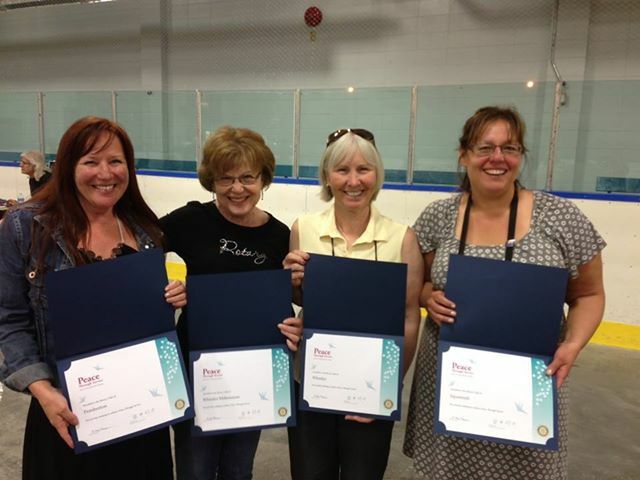 Pictured are committee members Neil McDonald, Liz Scott, Chair Petrie Neave, Liz Neave, and Lyn Stroshin. We look forward to representing you in the 2010/11 Rotary year! Do you have a personal Legacy story that should be told? A feature has been added so that Executive Meeting Minutes can be viewed securely by Squamish Rotary club members only. 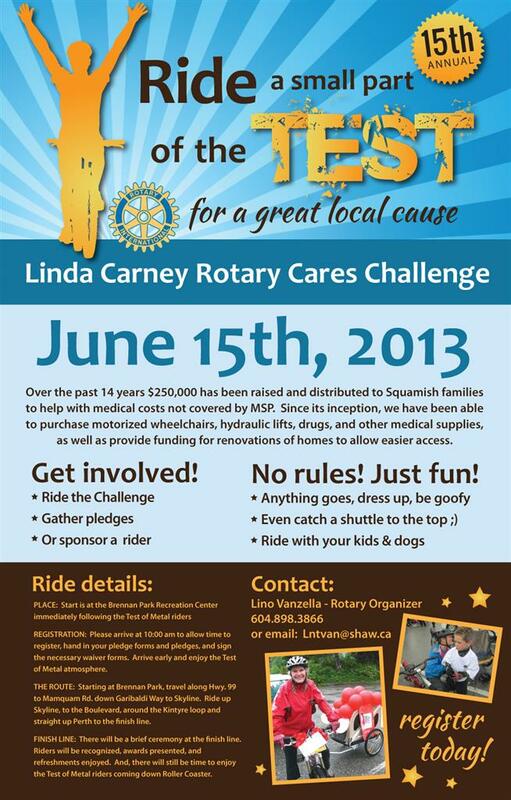 Simply go to the Squamish Rotary website and login. Click on "Admin Page" , click on "View Club Documents" under "My ClubRunner" on the lefthand side, and this will give you a menu of the secure members-only documents that are available for viewing. Make a selection and click on "view". Voila! Now wasn't that easy? If you encounter any problems at all, please call Liz at 604-898-4639 or send me an email at liz_scott@shaw.ca. The formation of the Squamish Rotary Club was the result of the dream of one man, "Johnny Morrison". 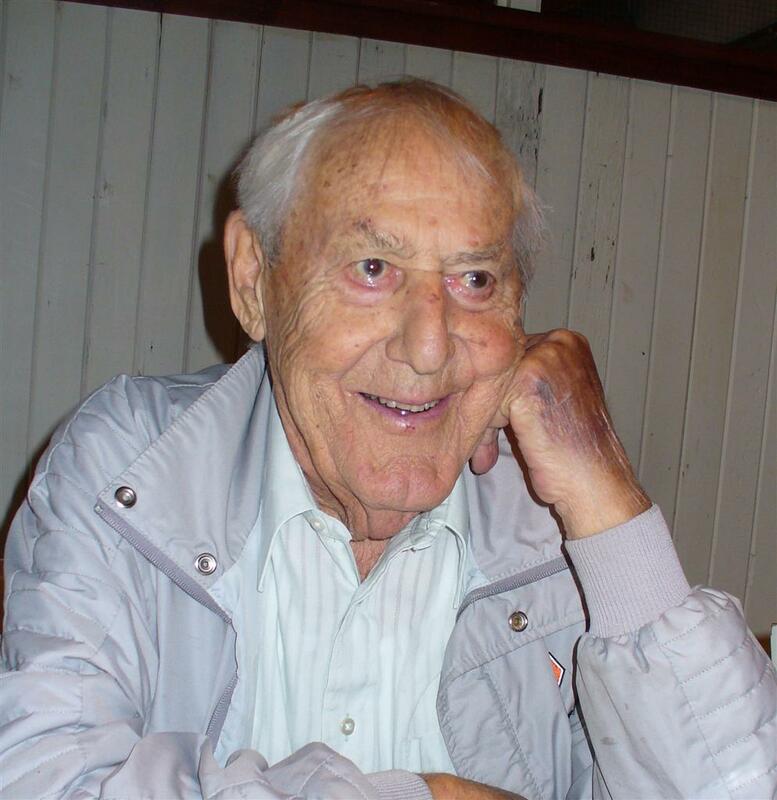 Johnny was a long time resident of Squamish and was the manager of MacKenzie's General Store. A new link has been added to the Squamish Rotary website, enabling you to donate to local and international projects that our club supports with just a few clicks of the mouse. Tax receipts are issued each time you donate, or once a year. Go to www.squamishrotary.com and look for the link under "Club Links". Click on "Donate to Squamish Rotary's Charities", which will take you to the Canada Helps website. Type in "Squamish Rotary" and you will be led through the steps to donate. You are able to donate to the general fund, or you can specify which project you would like to donate to. This can be set up to make a one-time donation or you can request monthly deductions. Please see Sheri Davis for further information. Randall Bamford, Director of Community Service, reminds us that packing hampers takes place on December 17th and hamper deliveries take place December 18th. You can sign up at Rotary on the sign-up sheet, or register online. 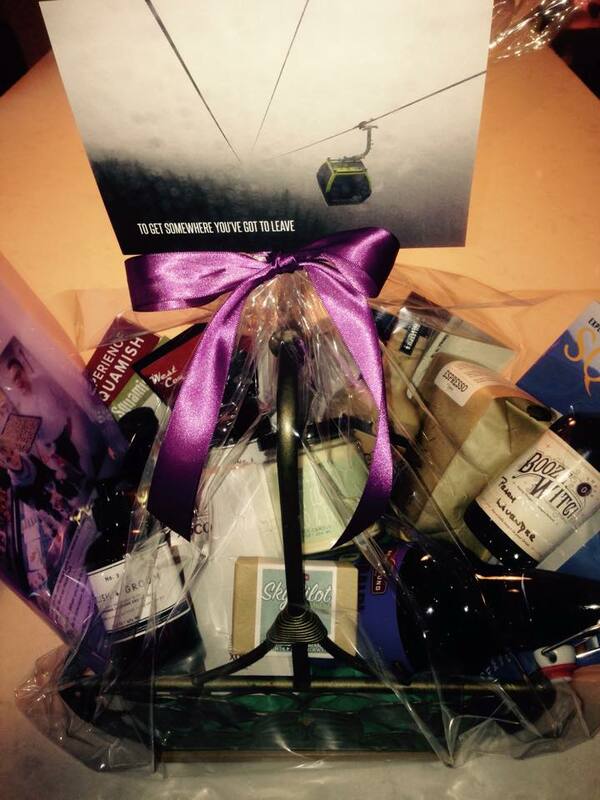 ...or that gift for the person who has everything! and friends who had contributed. 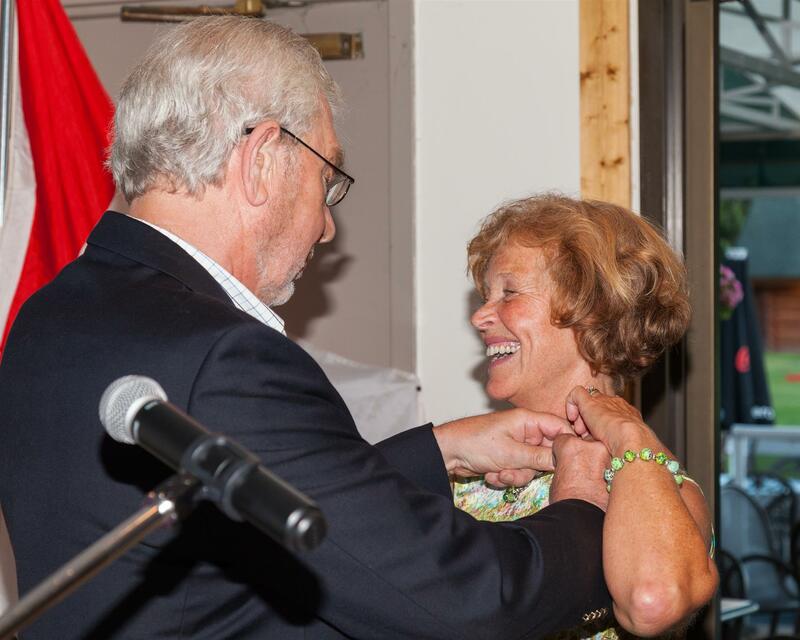 Gala Honouring Owen Carney A Success! The event, held at Quest University Saturday Nov. 22nd, raised an estimated $25,000 and attracted 226 people. 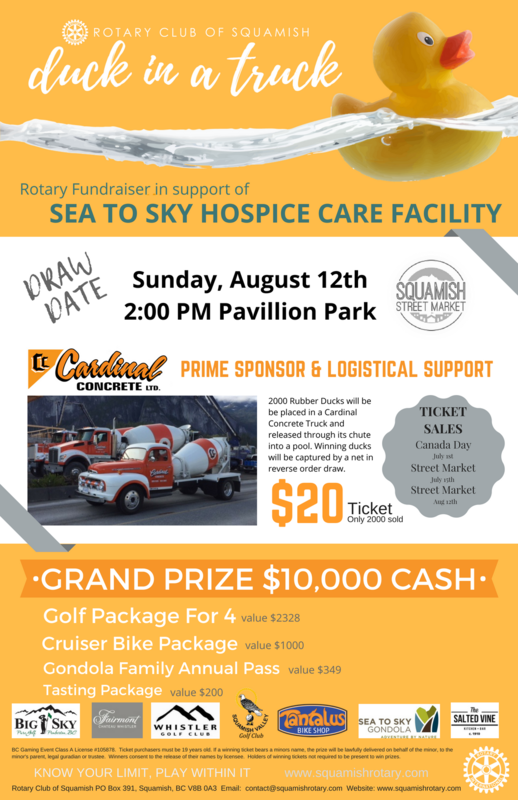 The funds will be distributed between the Linda Carney Rotary Cares fund, which covers uninsured medical expenses for Sea to Sky Corridor residents, and the Squamish Rotary Foundation, supporting local and international projects. Pictured with Owen are Jeanine Bradshaw and Grant McRadu. At the Nov 27, 2008 Rotary meeting, Bob Fast and Don Patrick were both awarded Paul Harris awards. Sheri Davis received her 3rd level Paul Harris Award. Congratulations to all of you and thank you for your many contributions to Rotary. District 5040's nominee for the Rotary World Peace Fellow scholarship, Bryan Nykon has been selected to attend Brandford University in the UK. To read more about the scholarship and about Bryan, click on the District site link above or on the left under Club Links. 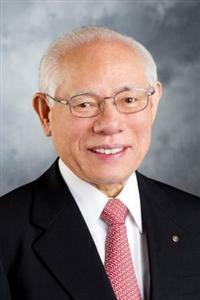 Congratulations to Assistant Governor Hans Doge, a member of the Rotary Club of Quadra, on his selection as the District Governor for District 5040 for 2011/12. The charming and delightful Elena Bakhareva of Barnaul, (Siberia) Russia, spoke to our club on November 20th. Lena is attending BCIT in Burnaby in the Business and Economics Program on a four month Russian Ambassadorial Scholarship funded by David and Lis Ker. David is a member of the Rotary Club of Vancouver South. Lena told us about her life in Siberia, and other than the extremely cold winters (-30 to -40 degrees), we were able to see from her slideshow presentation that life is not so terribly different from here in Squamish. Lena will take her new skills that she has learned at BCIT back home with her to the city of Barnaul. Contact 21 Twickenham Court Bradford W. Yorkshire BD8 7BL julia.emmanuel@gmail.com 07531847253 First Report Academic Activities and Progress I have chosen the Peace Studies module at the University of Bradford and am taking the following courses: Human Rights, African Politics and Introduction to Peace Studies. I am also auditing the Conflict Resolution course. All of the courses are extremely interesting. In particular the professors teaching Human Rights and African Politics are fascinating people with a great deal of practical and academic experience they freely share with us students. 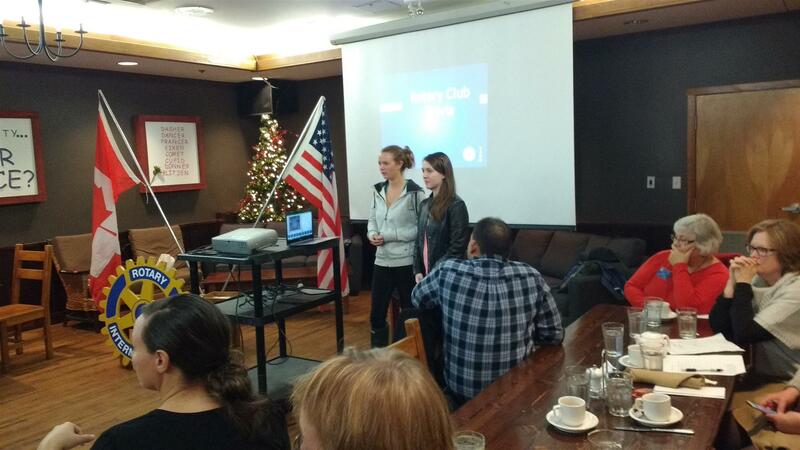 Over the years Squamish Rotary Club has hosted students from all over the globe. These students have come from Australia, Switzerland, Denmark, France, Brazil, Russia, Czech Republic, and New Zealand. Host families have welcomed them into their homes and the students have been immersed in our local high schools as well as community life in Squamish. When Canada was considered by Great Britain mature enough to govern itself back in 1867 it was men who elected our first Parliamentarians and Prime Minister John A. Macdonald. In fact, it was not until 1920 that Canada and the USA considered women worldly enough to give them the right to vote. Just 40 to 50 years ago women were expected to choose vocations like teacher, nurse, office secretary, and clerk. Vocations like accountant, engineer, geologist, business owner and lawyer were mainly the domain of the so called more learned gender, men. By Reporter Neil Judson njudson@squamishchief.com Owen Carney has been a endless source of energy for Squamish for decades. Besides building Carney's Waste Systems from the ground up, decades of community and far-reaching contributions make Carney stand out as the next Squamish resident that deserves to be celebrated by the Squamish Rotary Club, and they're doing so at a gala fundraiser at Quest University next Saturday (Nov. 22). Peter Gill attended the Canucks game with Rotarian Glen Nov 8th. Peter goes home January 2nd so there are only a few weeks left to enjoy his company and introduce him to your family. Peter is now staying with Mike and Andrea Beaubien and can be reached at (604) 898-2093 or by email at aussie.peter@hotmail.com. Peter will be making his presentation at Rotary on Dec 11th. When I left Canada many people told me that the 3rd month would be the hardest. I would feel homesick and get lonely. I think all things considered I'm doing pretty well! Now that I am in Thailand, I have a lot of free time on my hands. It gives me lots of time to think. Buddhist religion believes strongly that in every situation there is always a negative and positive side. It is the choice you make that changes things. You have the option of being positive or negative towards any situation. Sometimes when you are sad and upset it is hard to brake through and think positive. I think it is because deep down you need time and you are not ready to move forward. Anyways all this to say that I learn a lot on the beliefs of Thai people and so far I agree with them on everything. Wow, already time for the third report..which means that my exchange is already a quarter over..uhhh it's strange..time definitely DID NOT go by this quickly when I was waiting to find out if I was accepted...or what country I was going to..or who my host family was...funny how that works. Soooo what have I been up to. Well, while I still had holidays my host family and I took a trip to Hamburg for a day, stopping in Bremen for a day and staying at my host mum's parents house in a small town outside of Bremen. I caught a glimpse of a possible example of the oh so popular mullet type hairstyle and whipped out my camera to take a picture. Unfortunately just as I was taking it he saw me and I had to pretend I was just another tourist casually taking a picture of the cathedral in the background, making sure to have a good look at it with a satisfied smile once I had taken it as if it was exactly the photo I was going for. I think I convinced him, but didn't want to risk trying again, so I am afraid that I have not yet managed to get a picture worthy of sending. 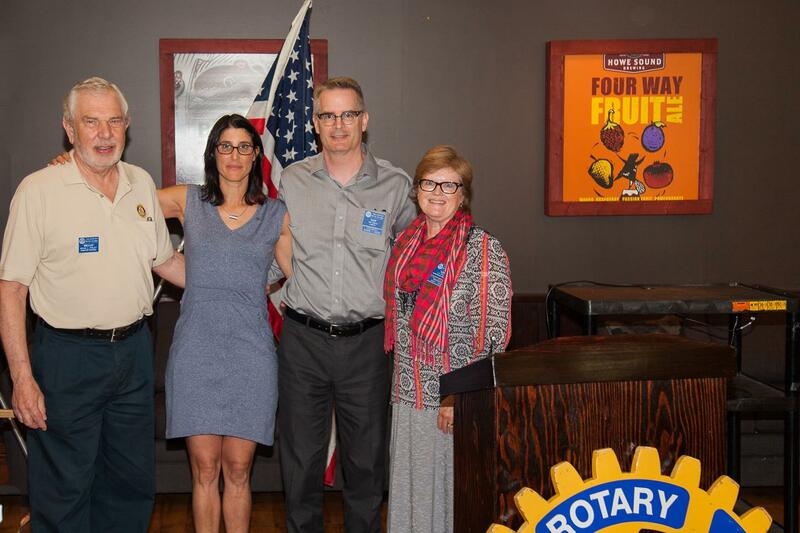 At our Oct 23rd meeting, DG Bob Blacker inducted our newest Rotarians, Rose Fast, sponsored by Laurie Vanzella, and Chris Rommel, sponsored by Ken Newington. Rose is a former Rotarian from Sechelt, where she is the Past President as well as Past Assistant Governor for Sunshine Coast. Rose has jumped on board with the Squamish Club by assisting Doug Race with Foundation. Chris Rommel is a local Building Contractor and is already involved with the "Tribute" fundraiser. We can tell that both Rose and Chris will be active members of our club.